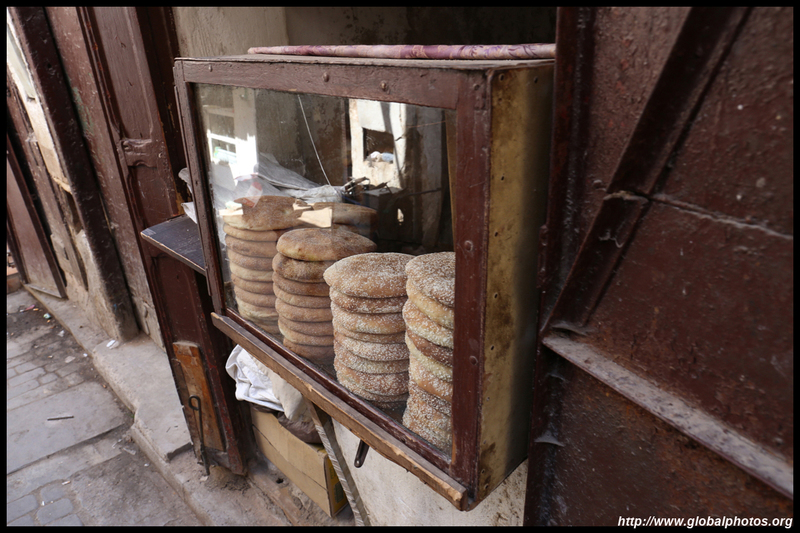 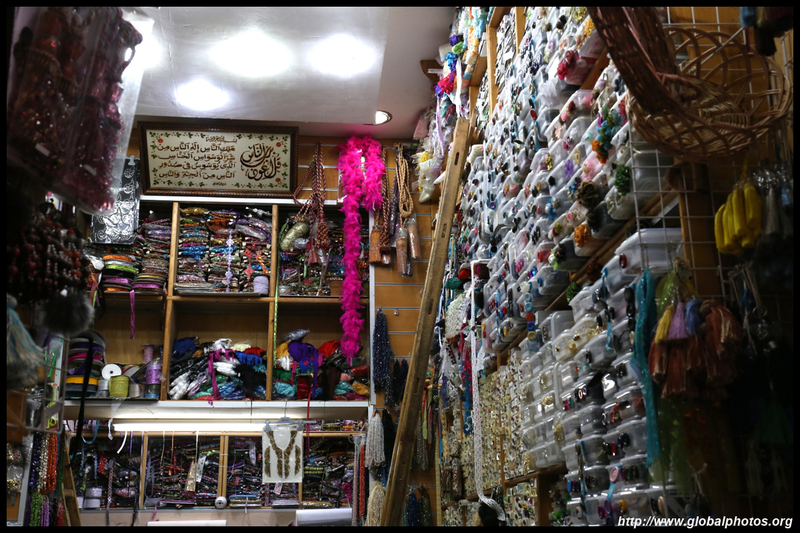 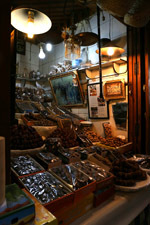 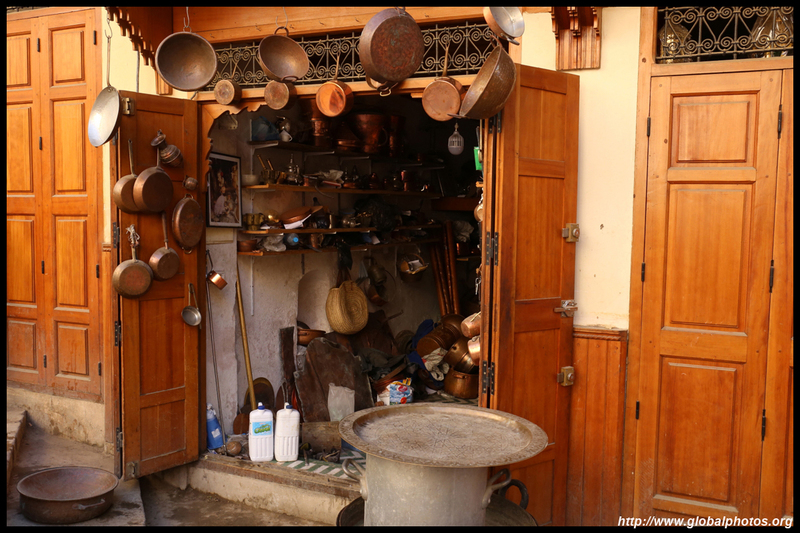 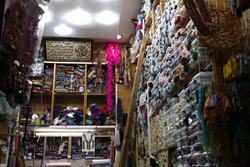 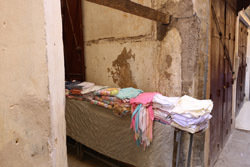 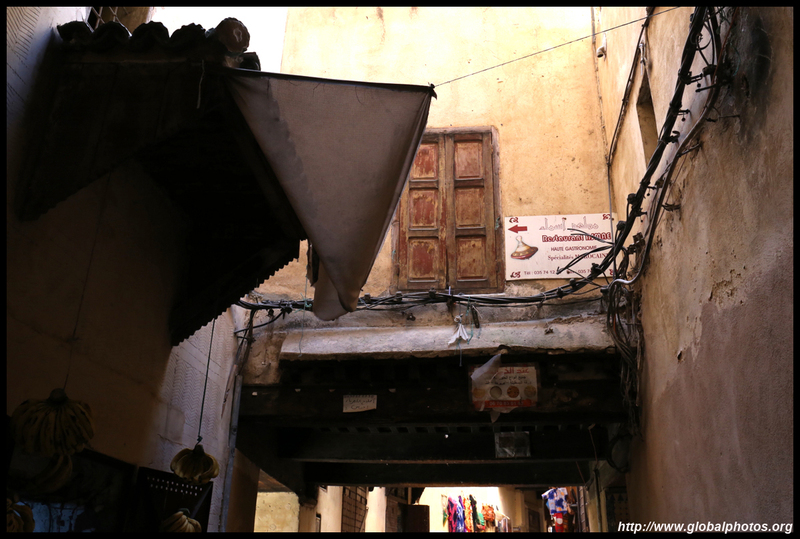 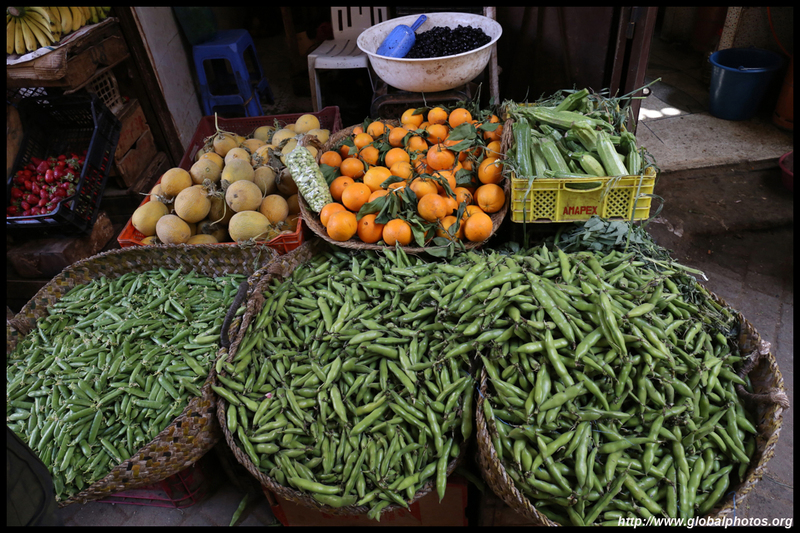 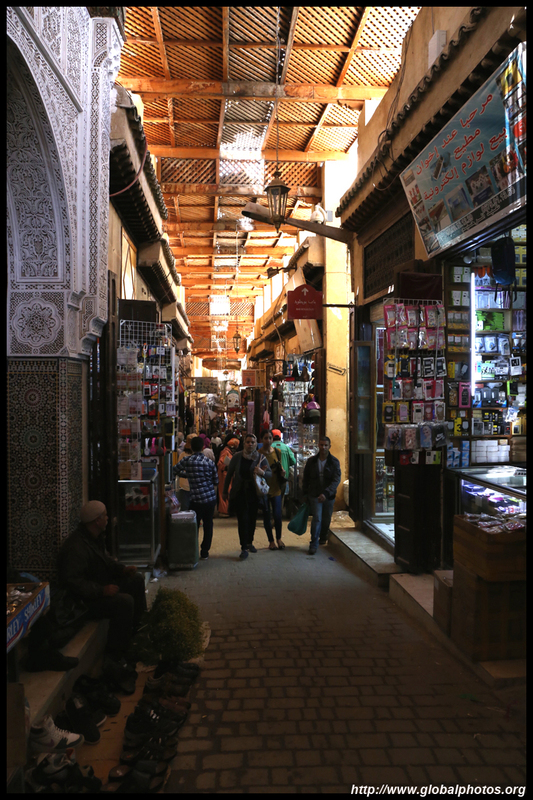 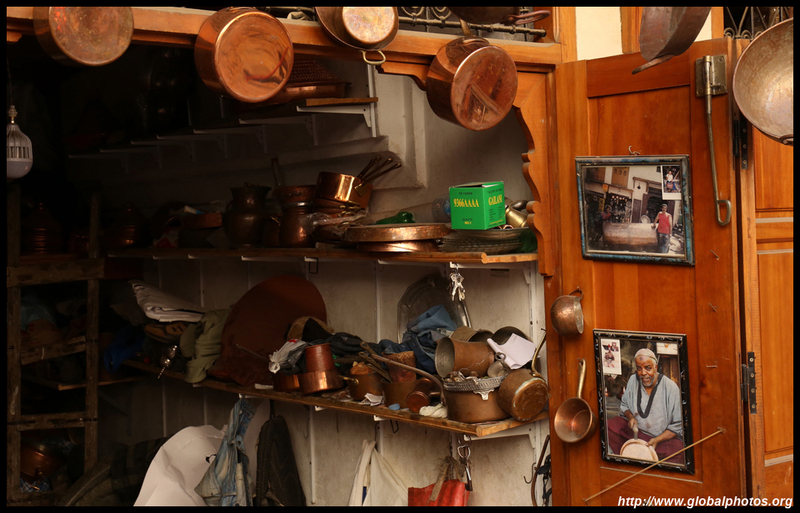 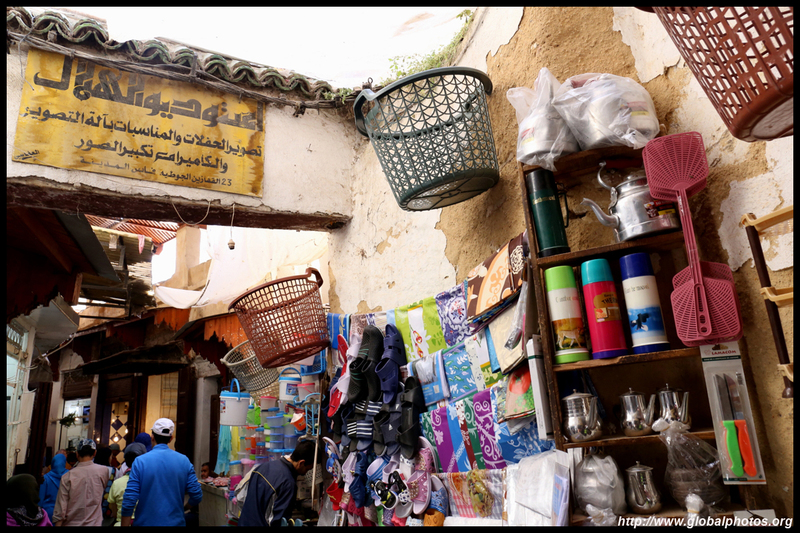 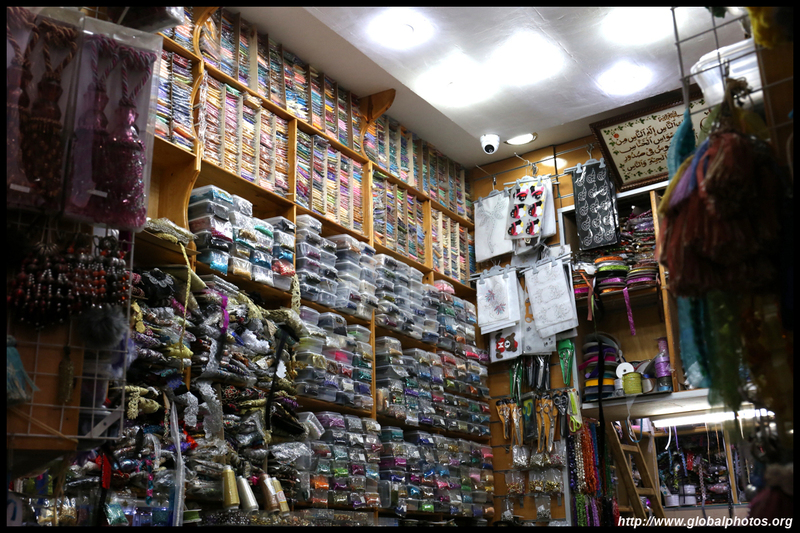 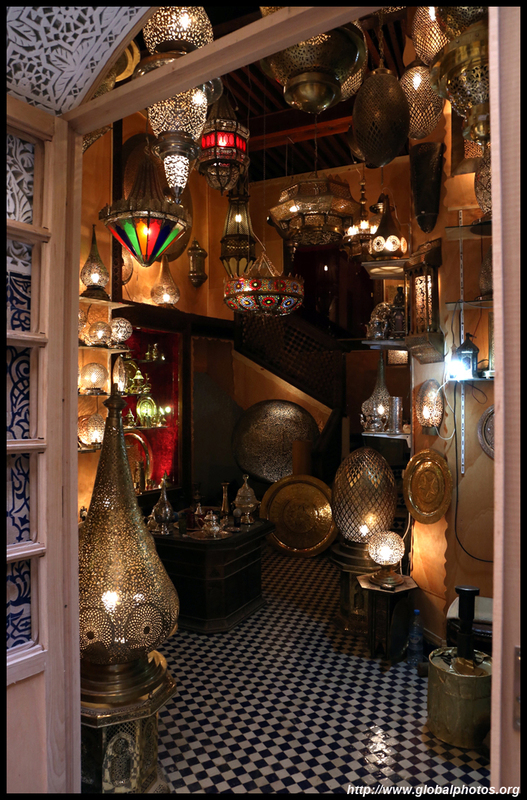 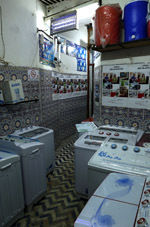 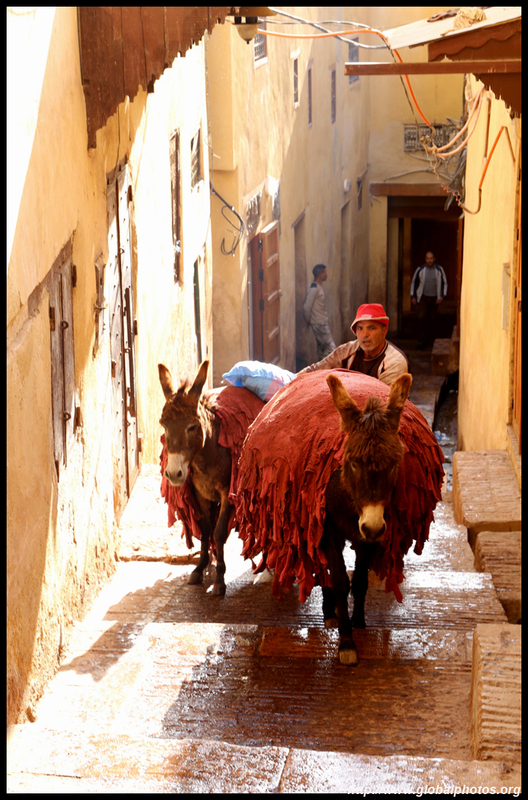 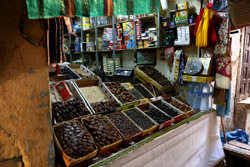 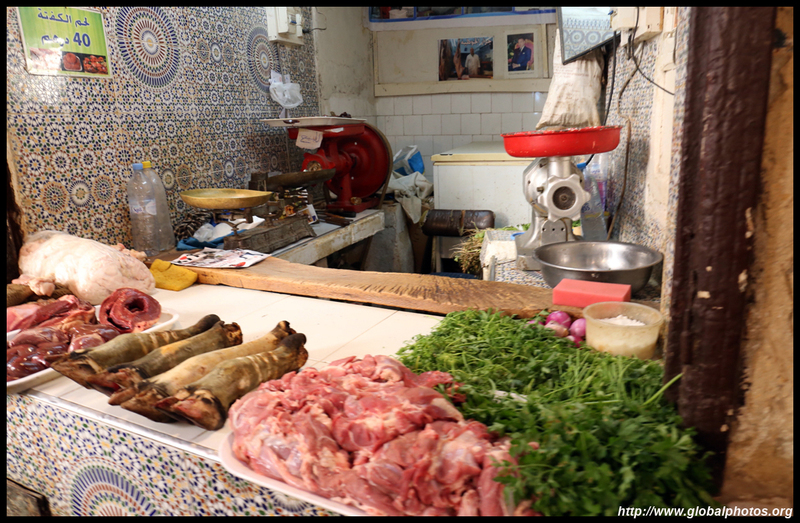 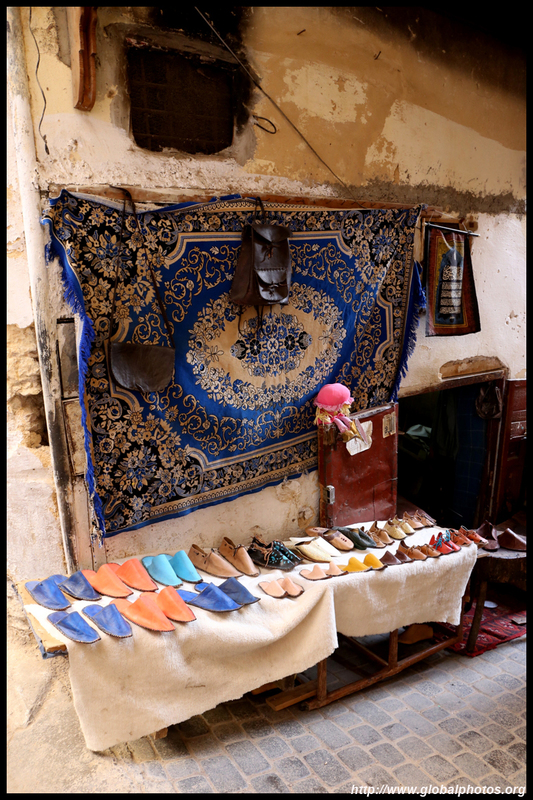 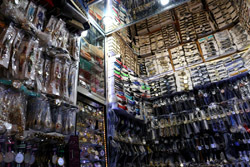 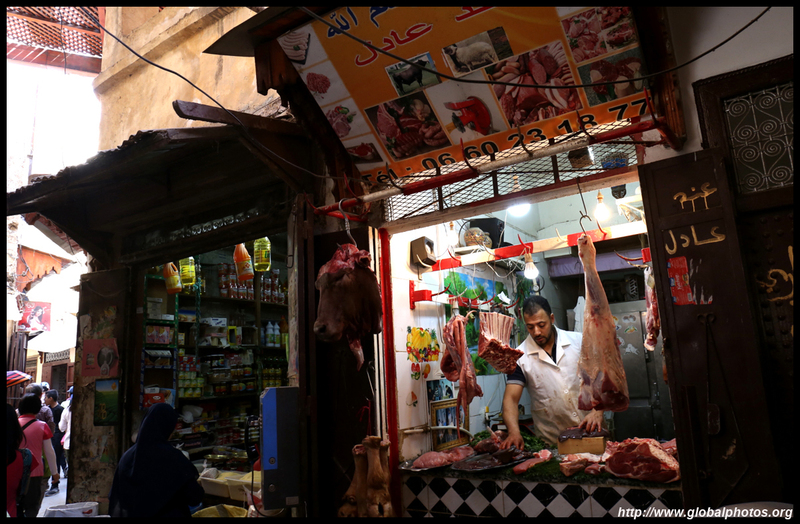 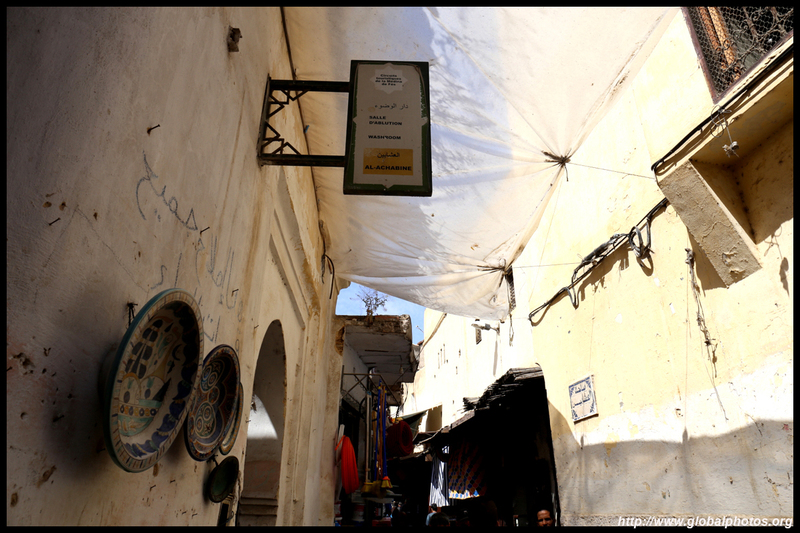 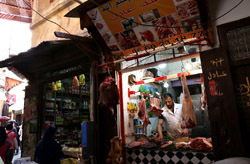 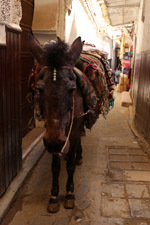 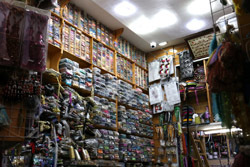 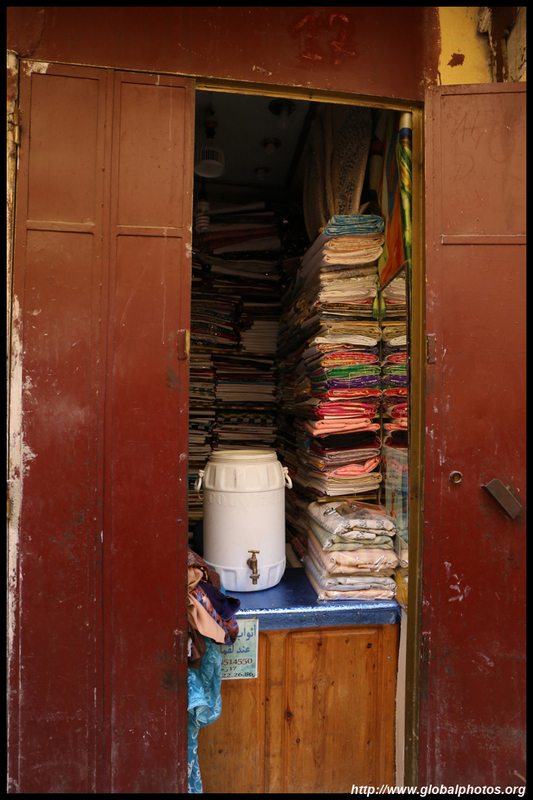 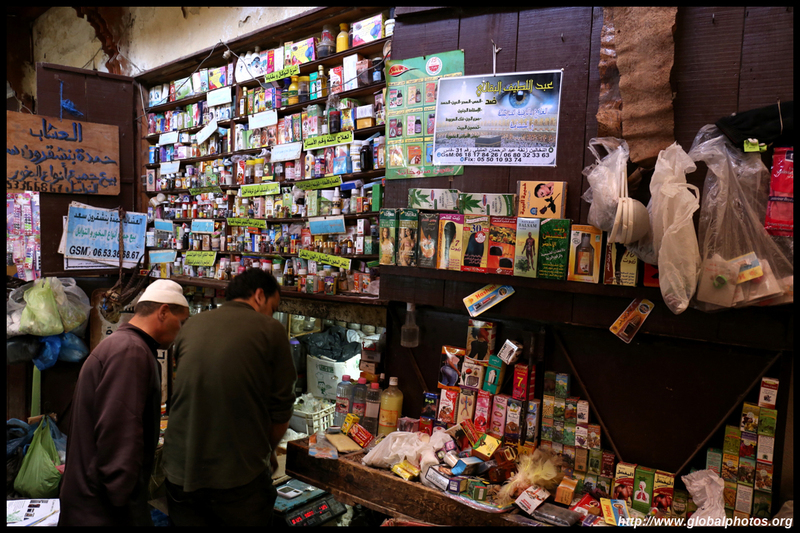 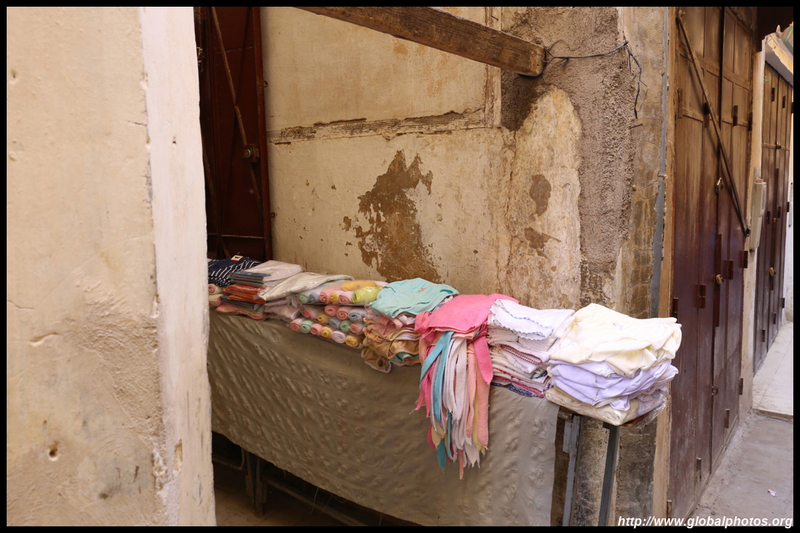 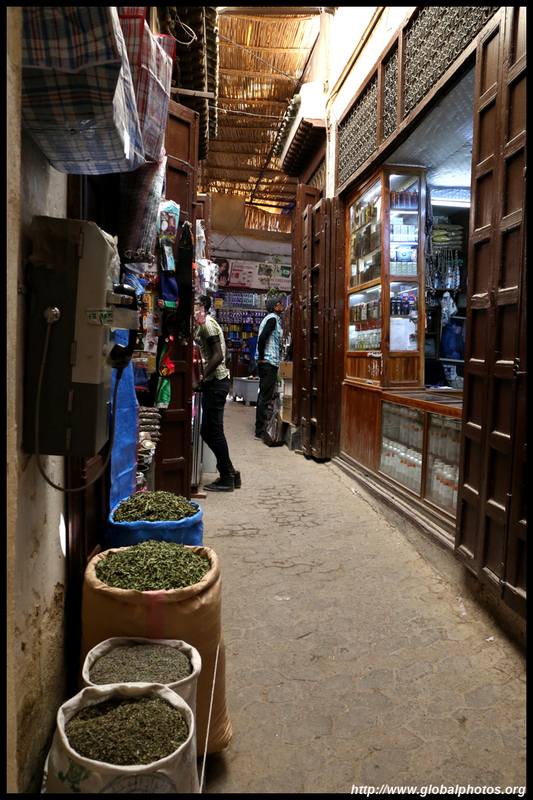 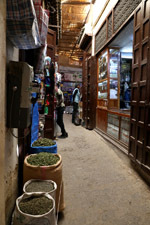 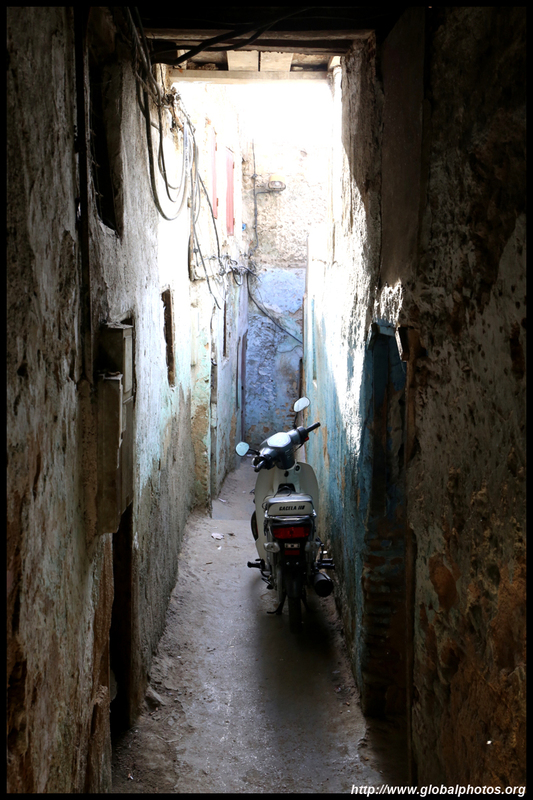 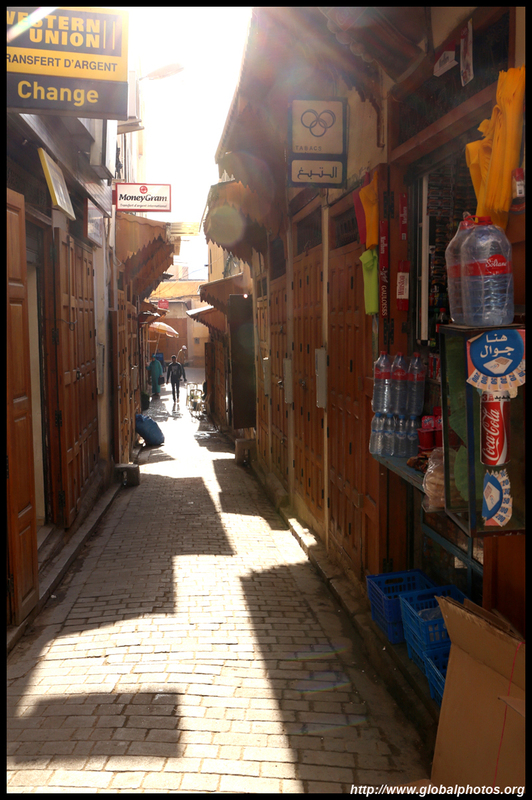 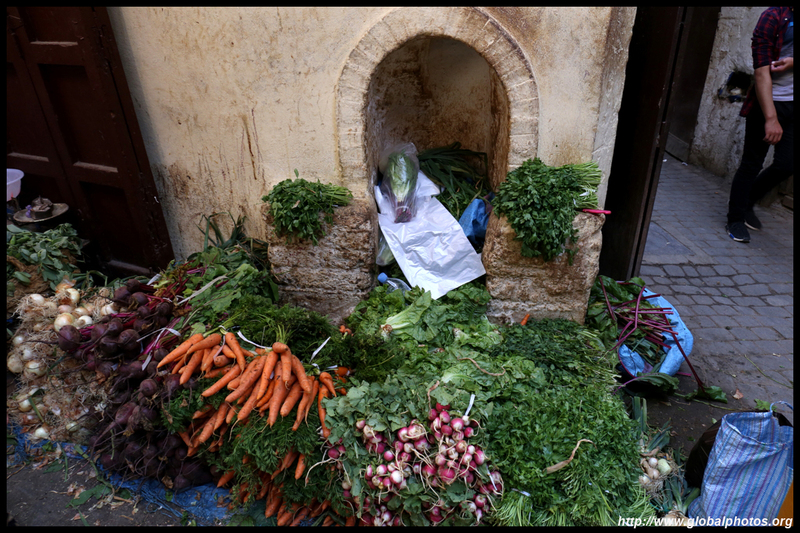 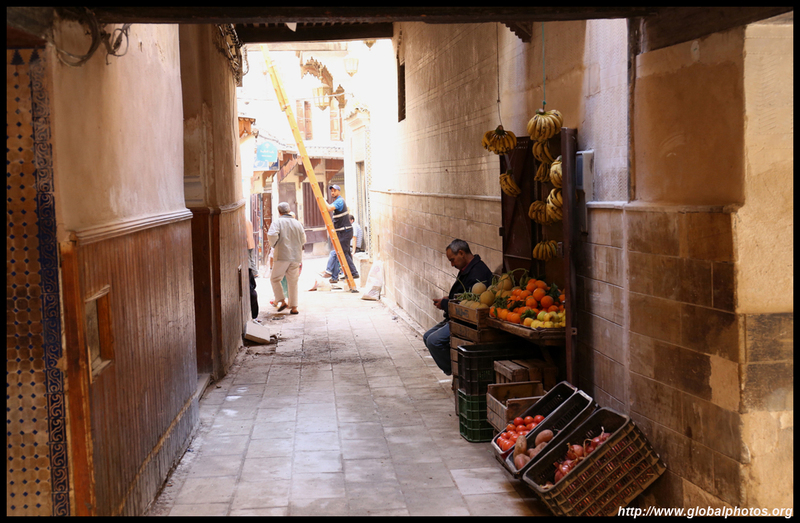 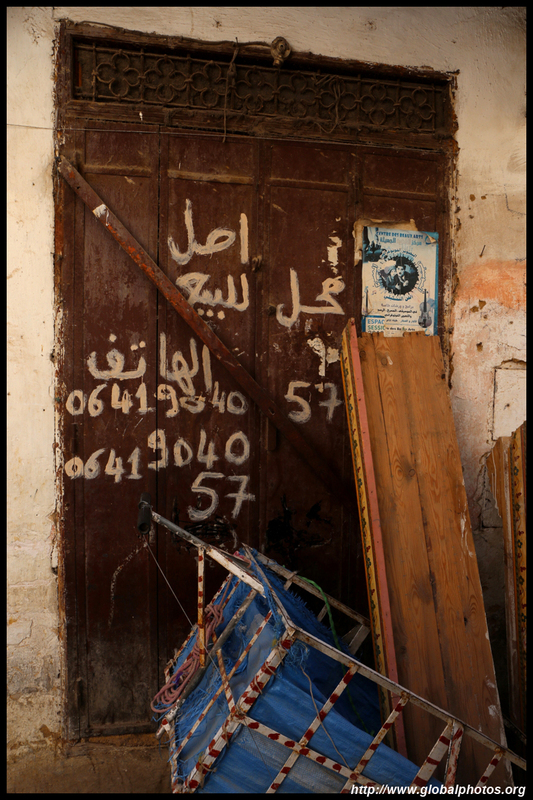 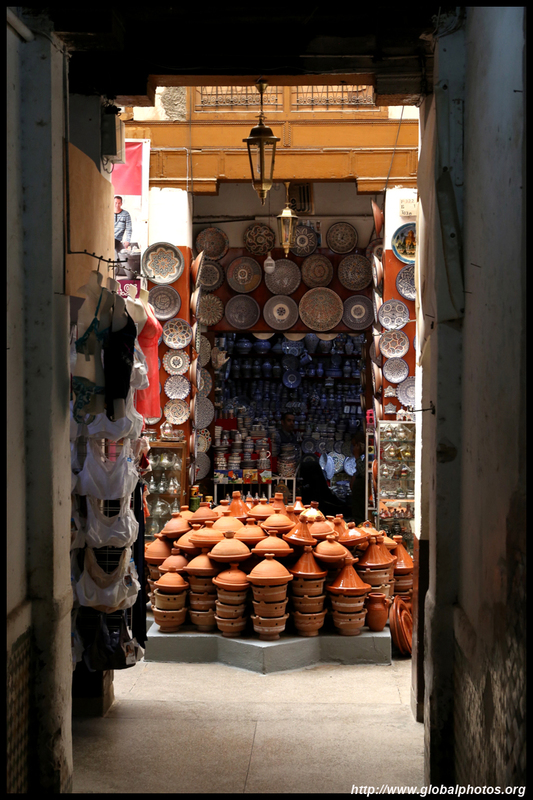 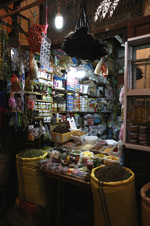 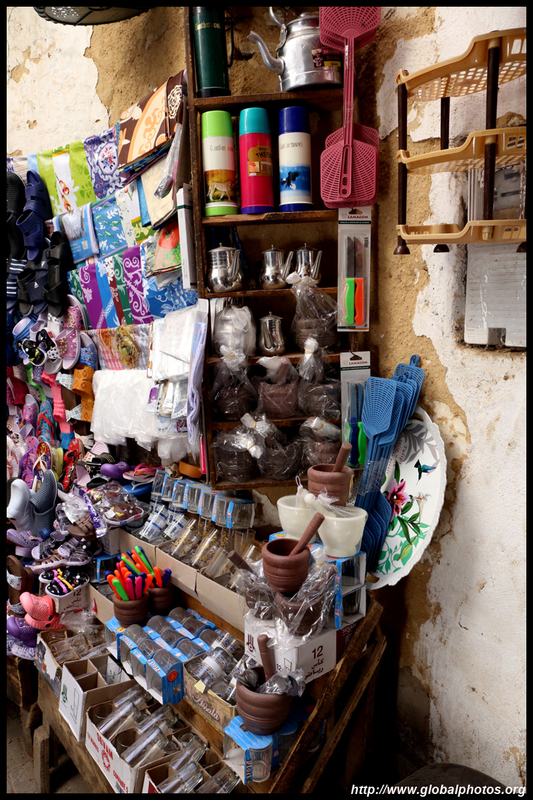 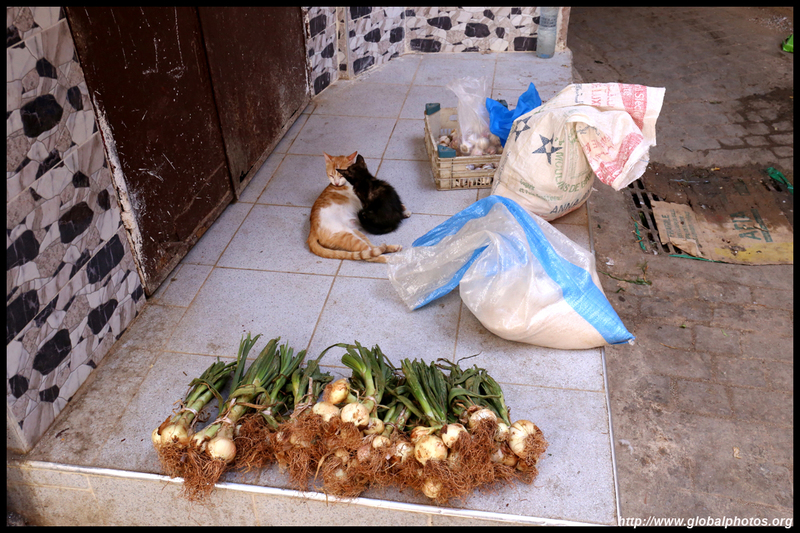 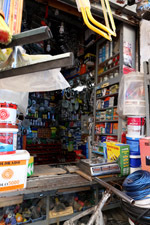 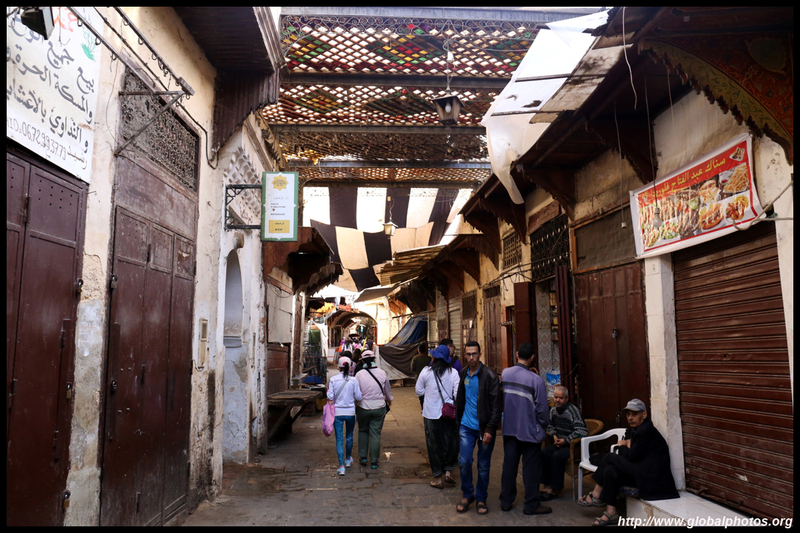 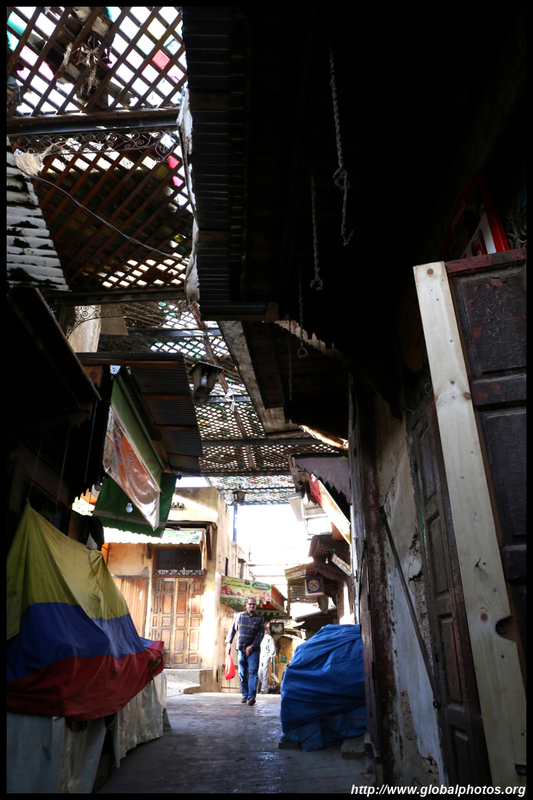 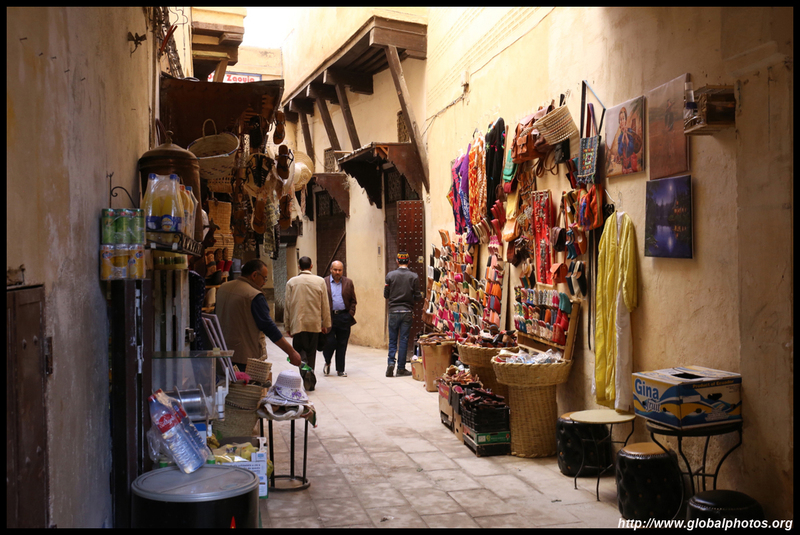 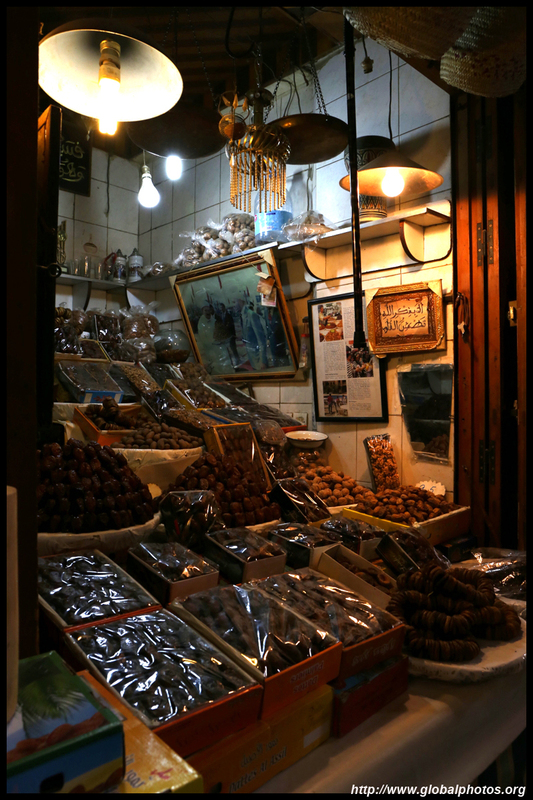 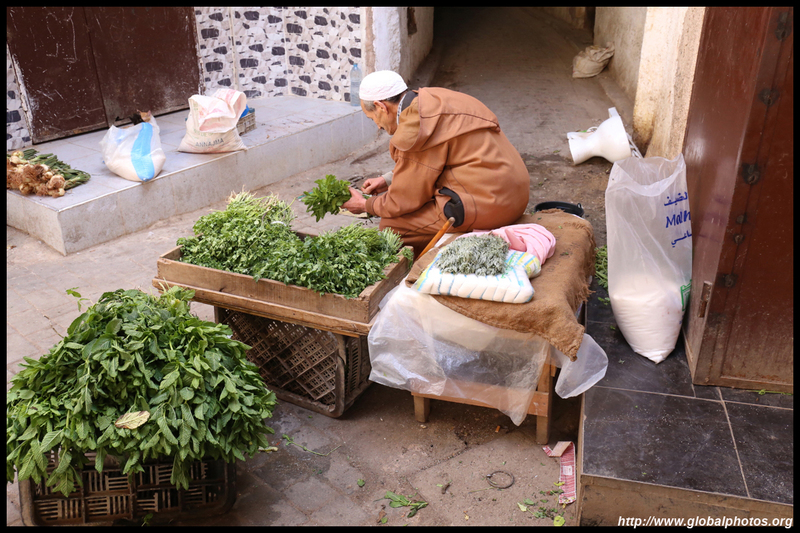 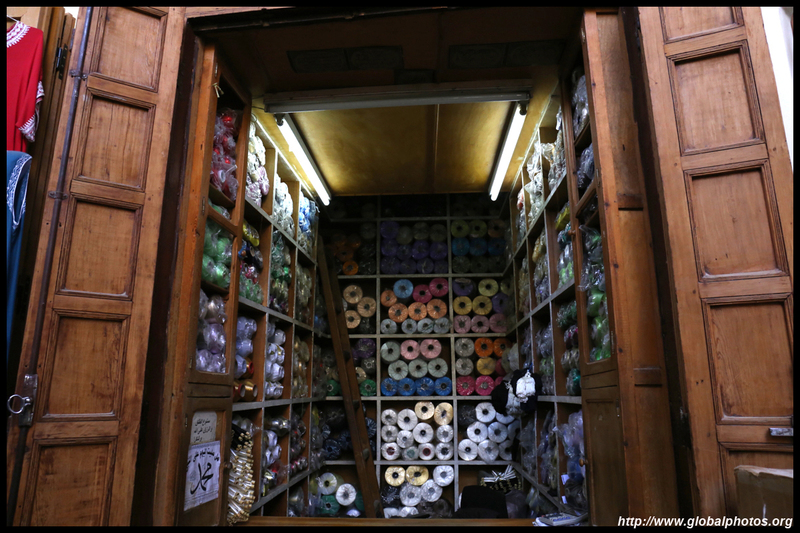 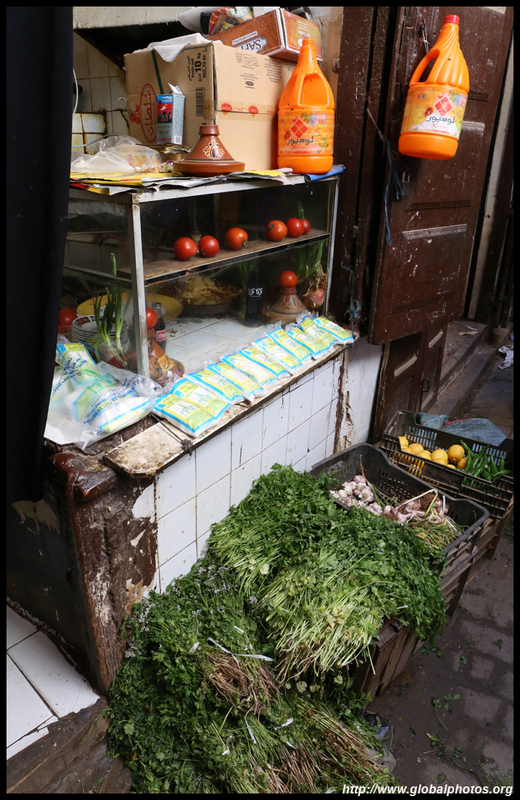 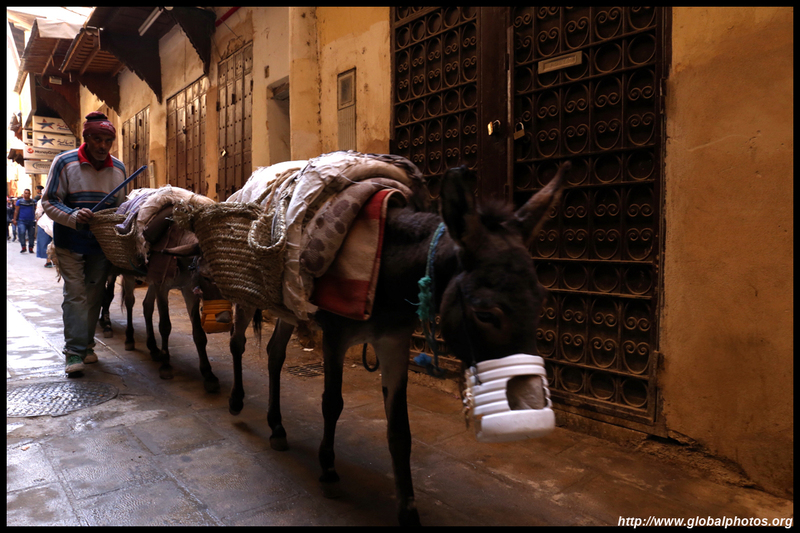 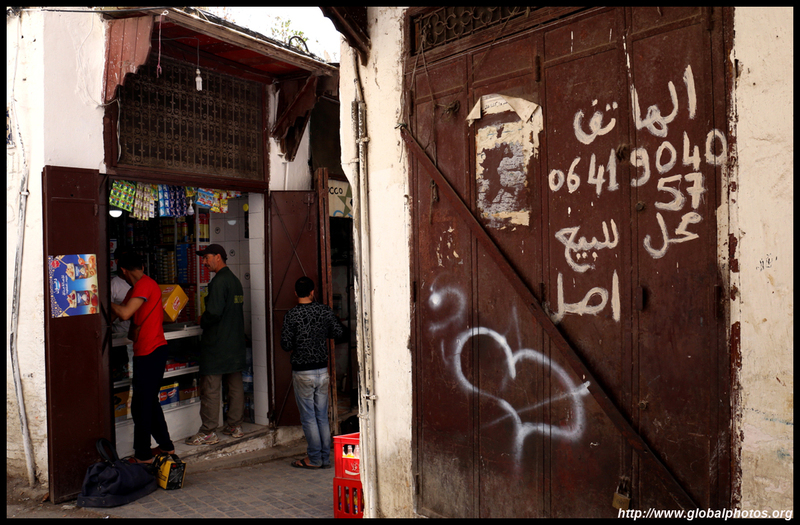 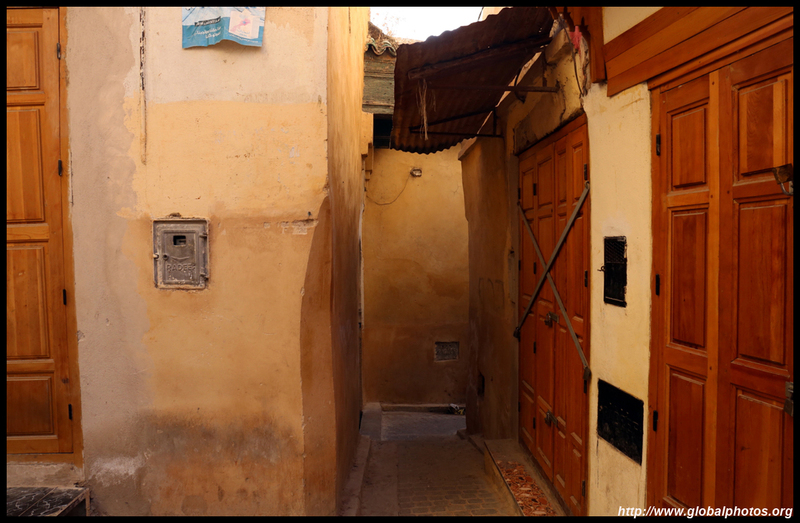 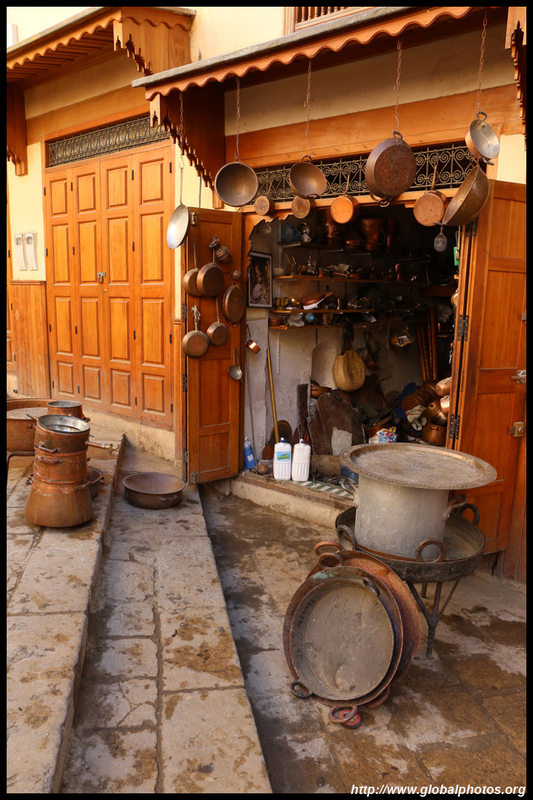 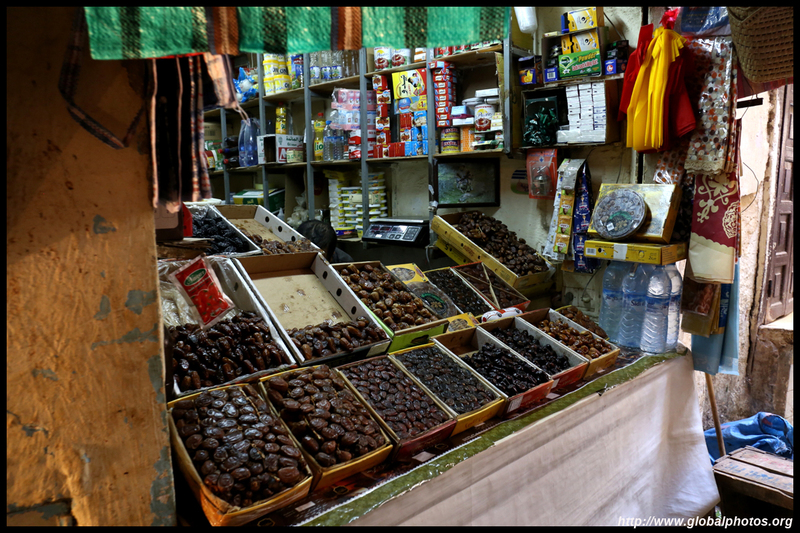 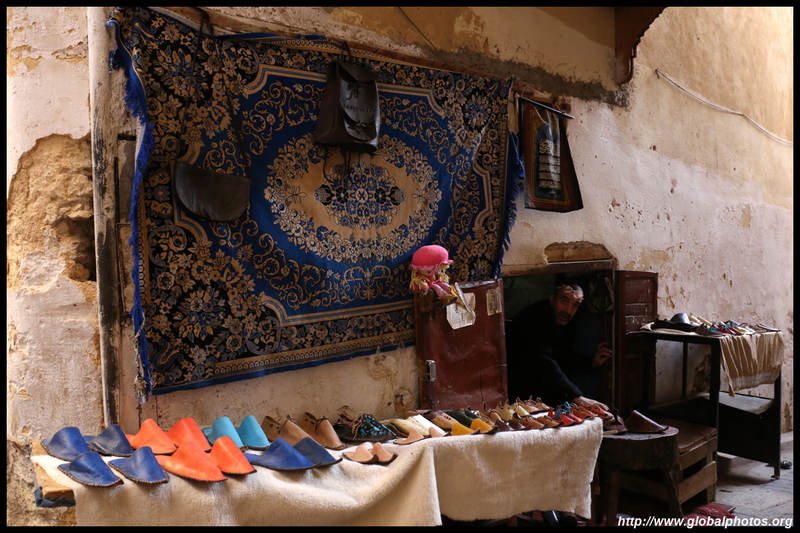 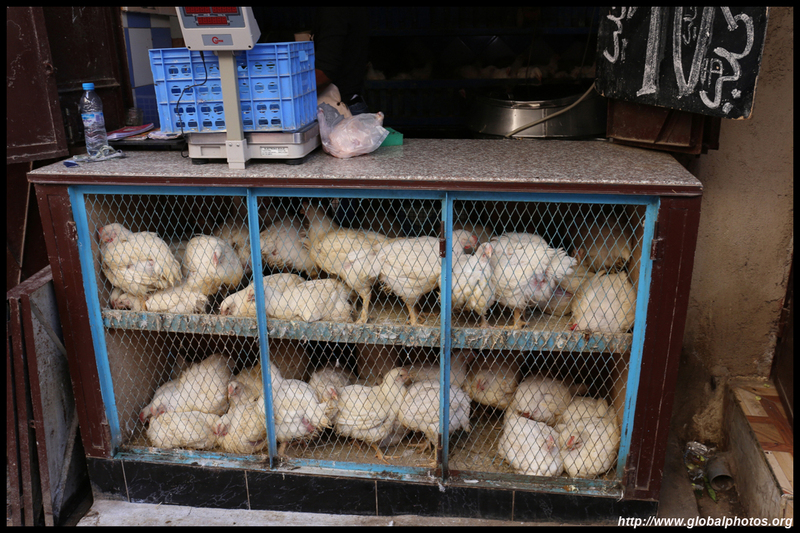 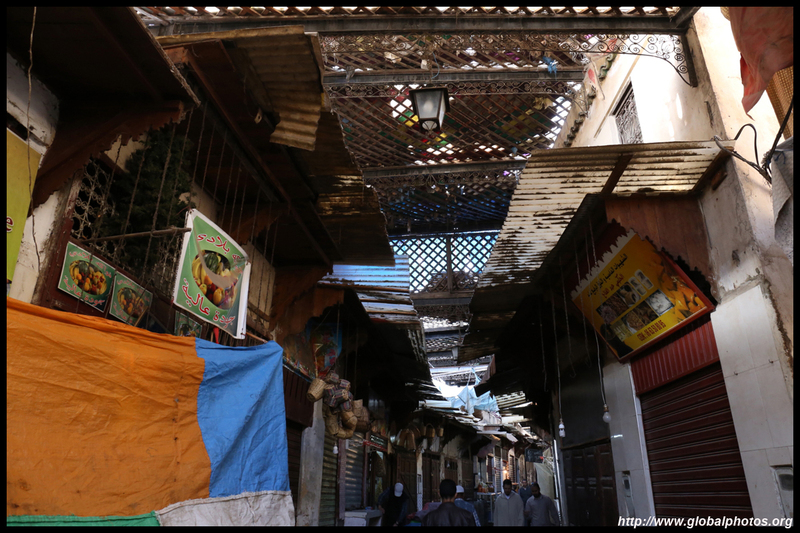 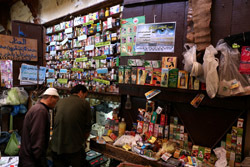 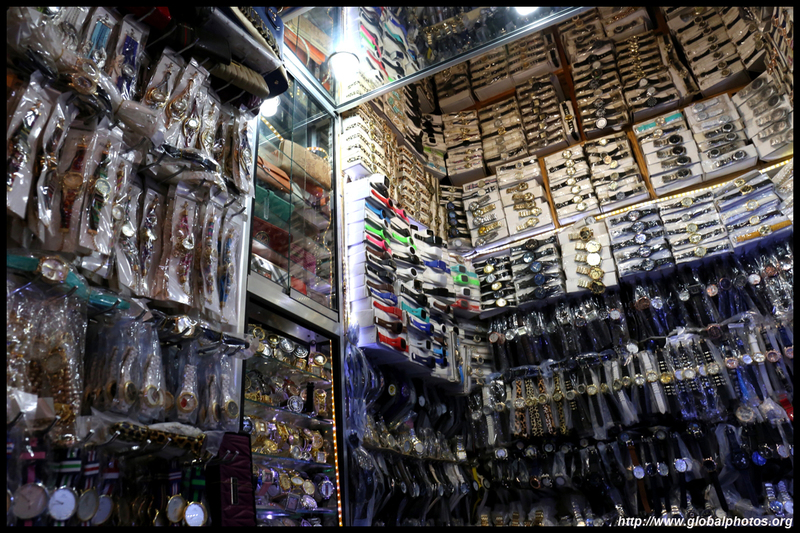 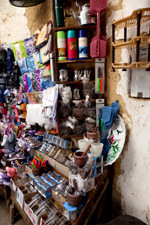 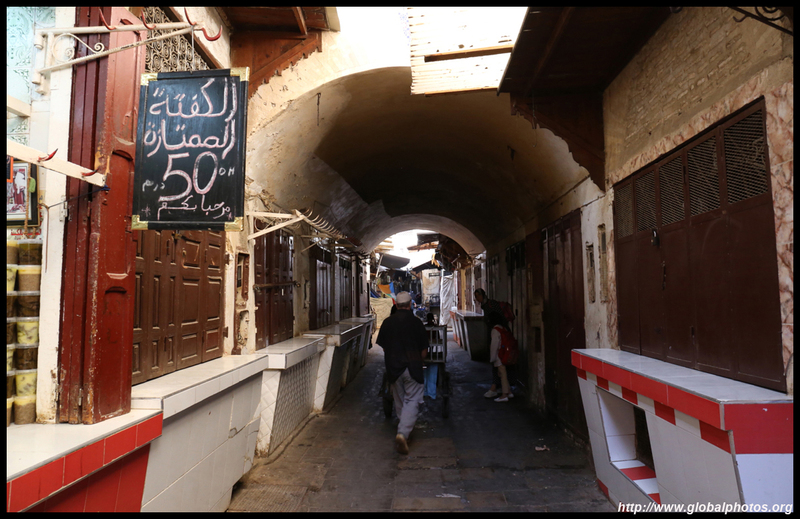 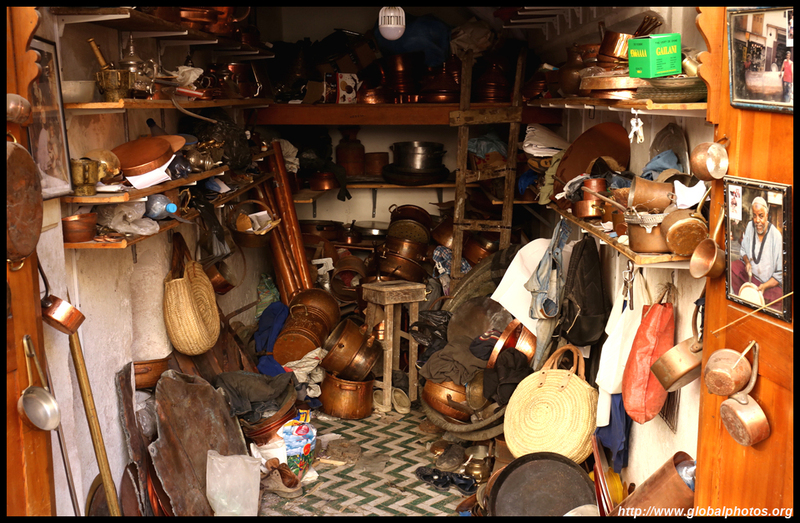 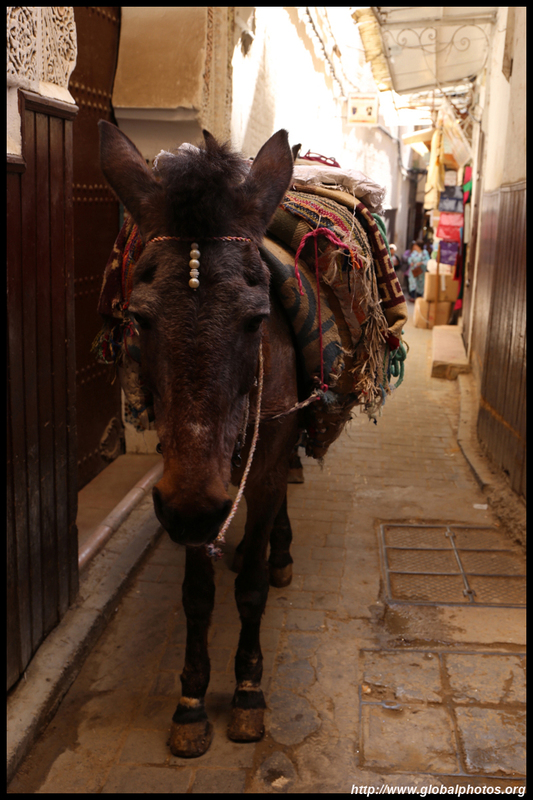 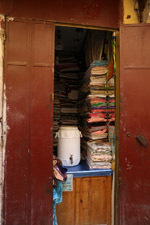 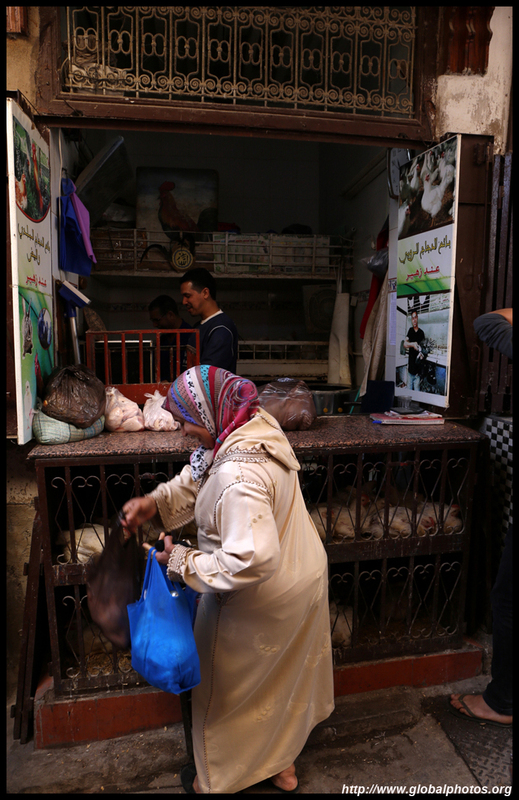 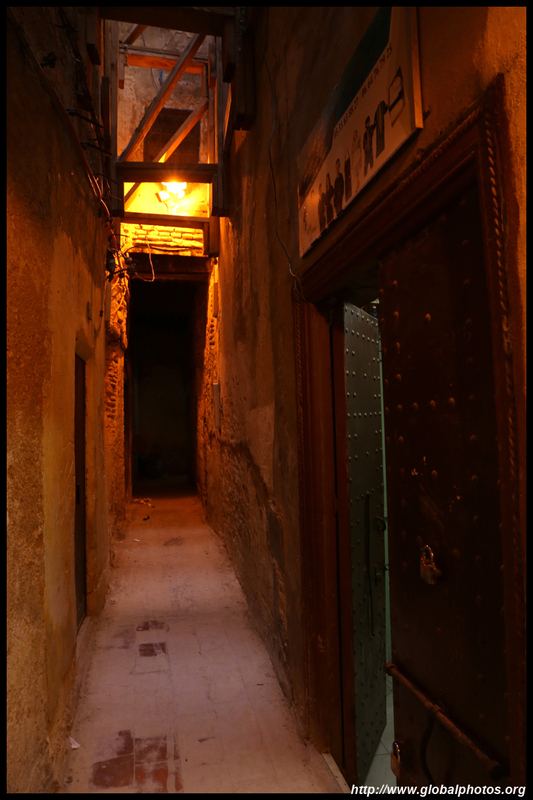 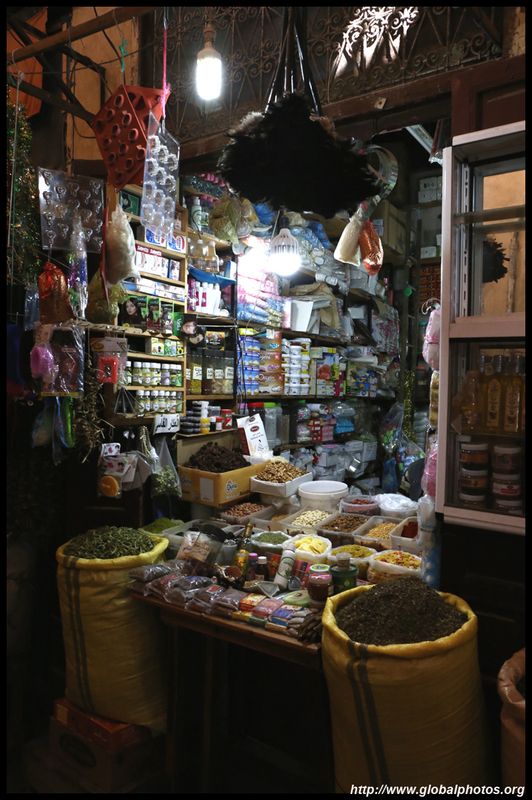 Fez's medina is a chaotic wonderland, with winding alleys full of different shops, donkey carts coming through, and everyday folks buying their daily needs. 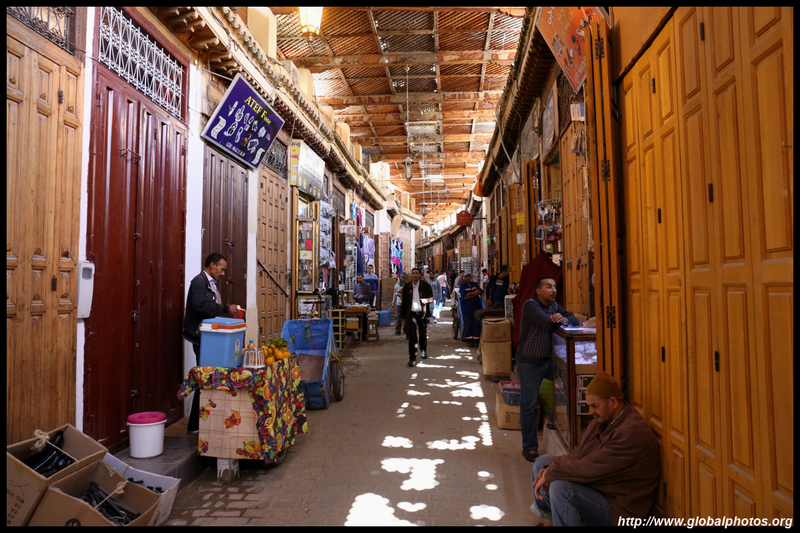 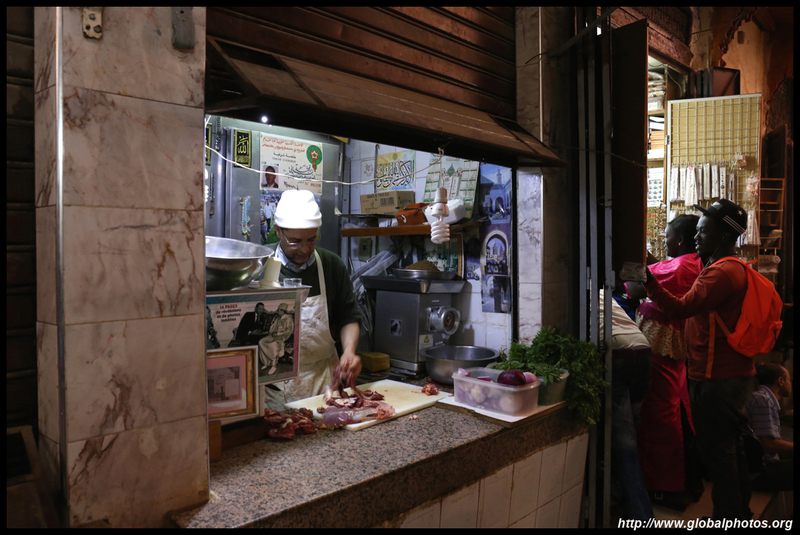 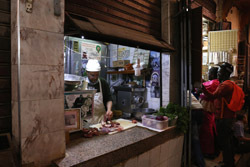 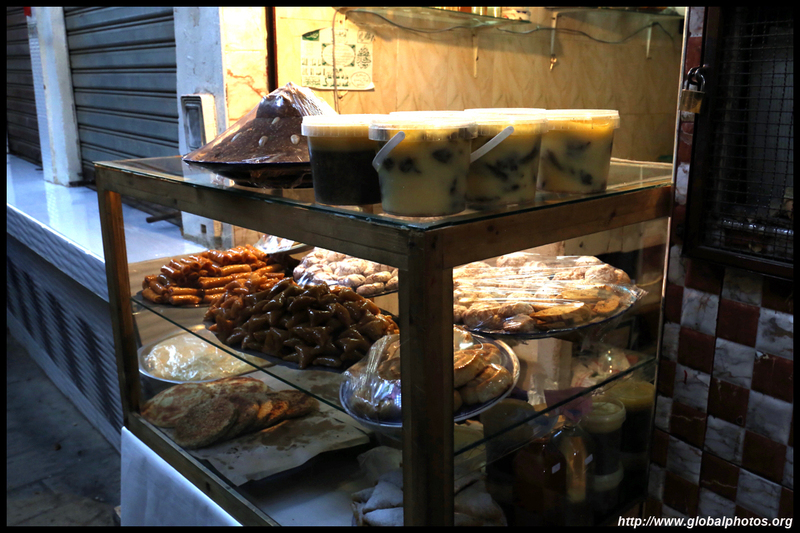 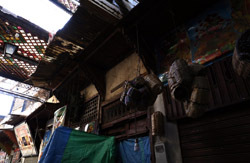 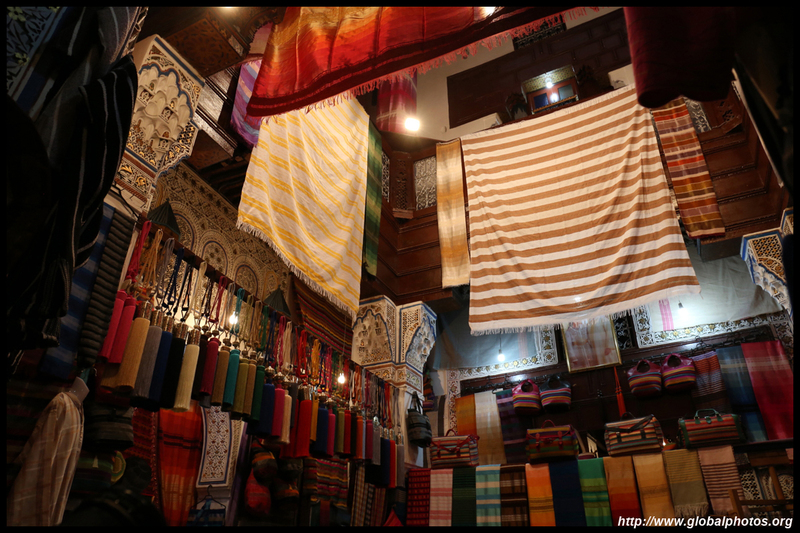 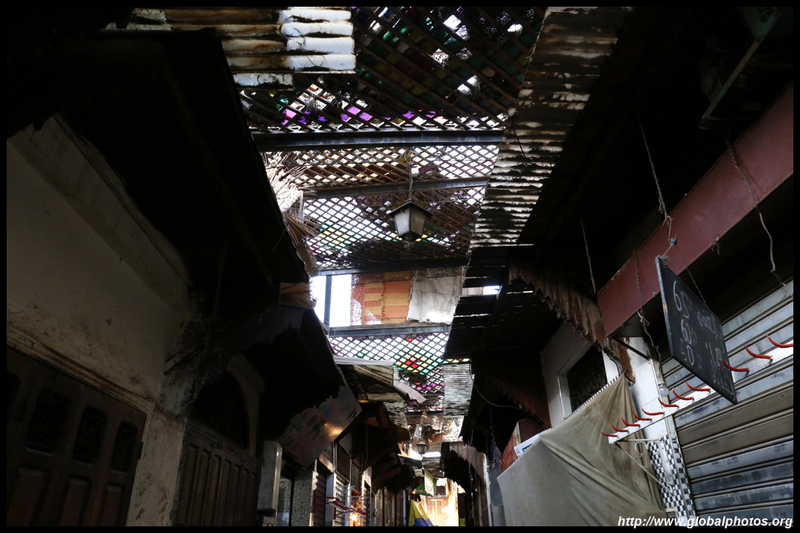 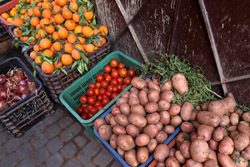 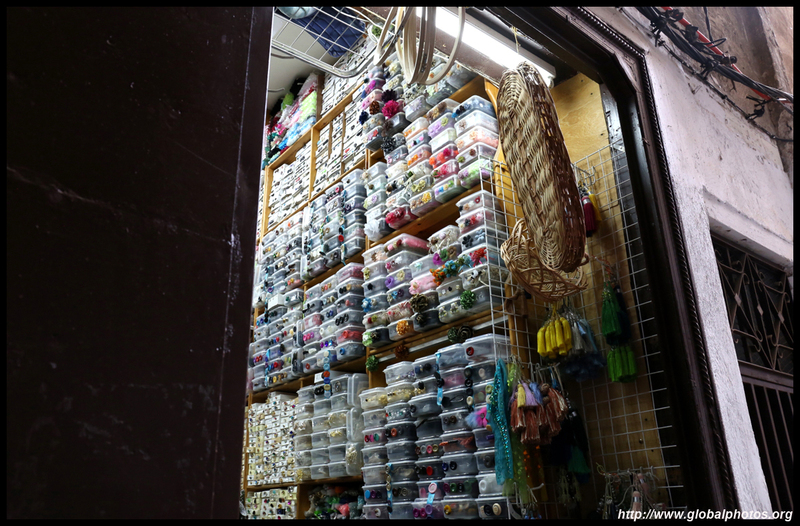 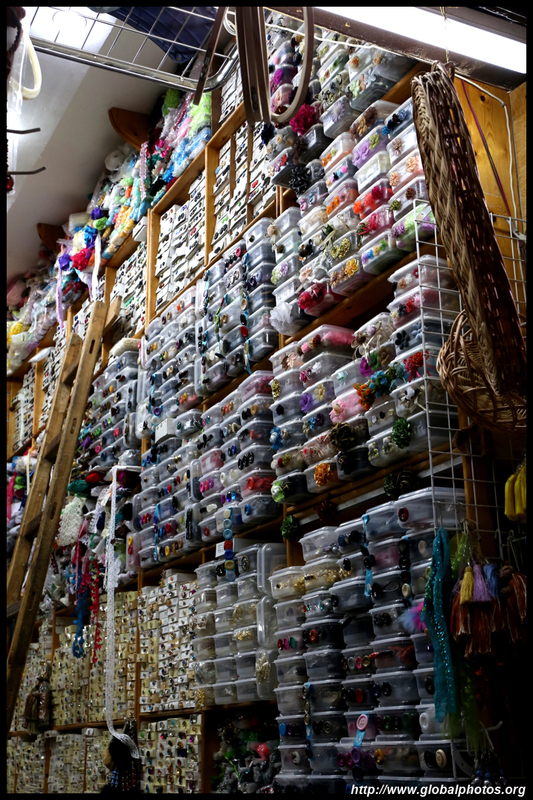 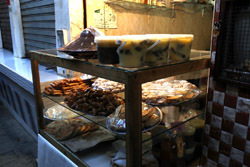 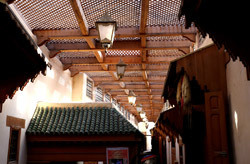 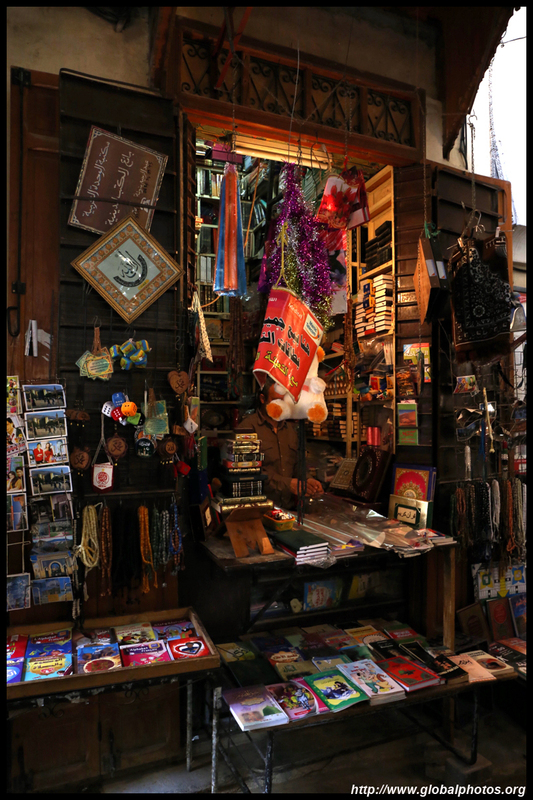 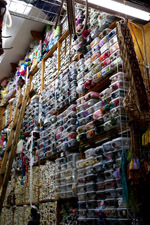 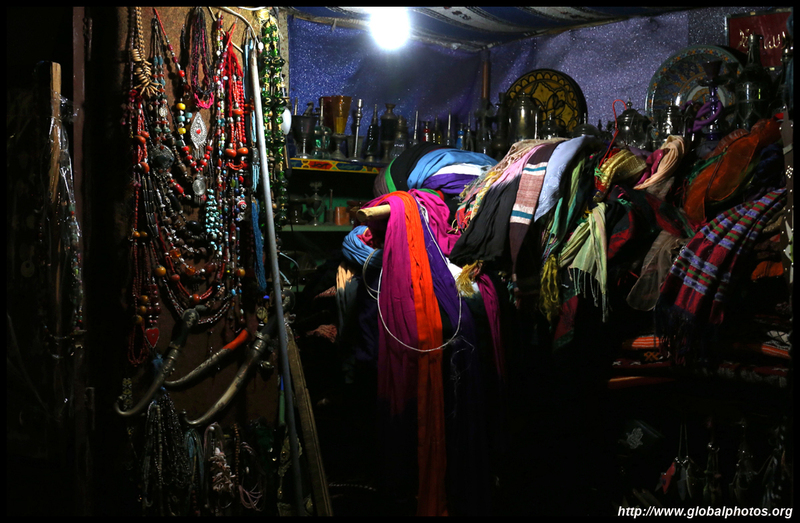 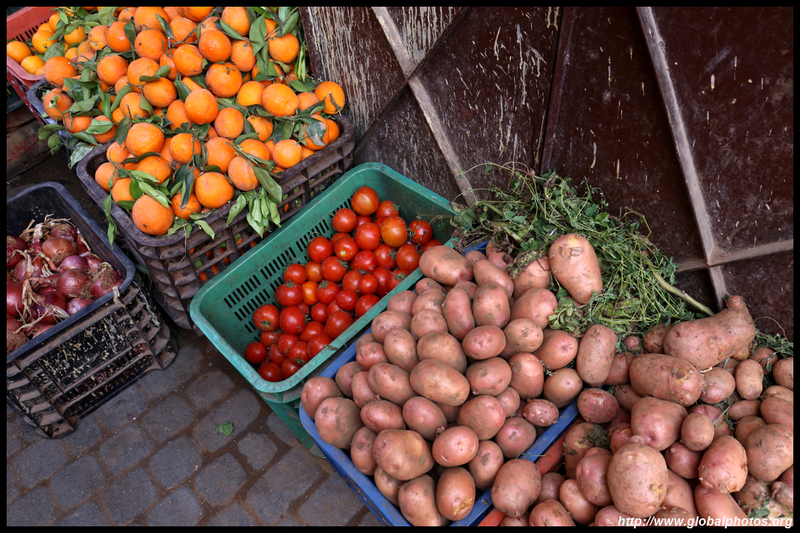 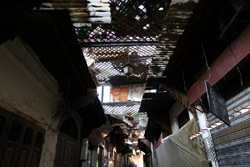 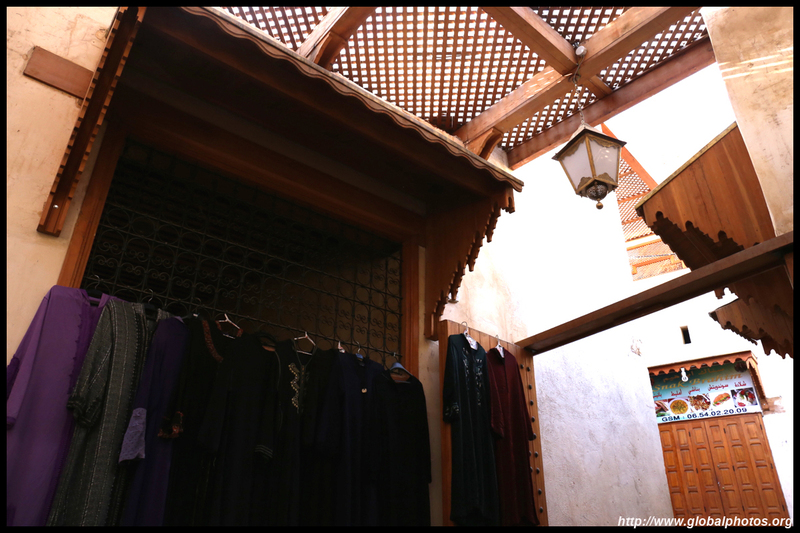 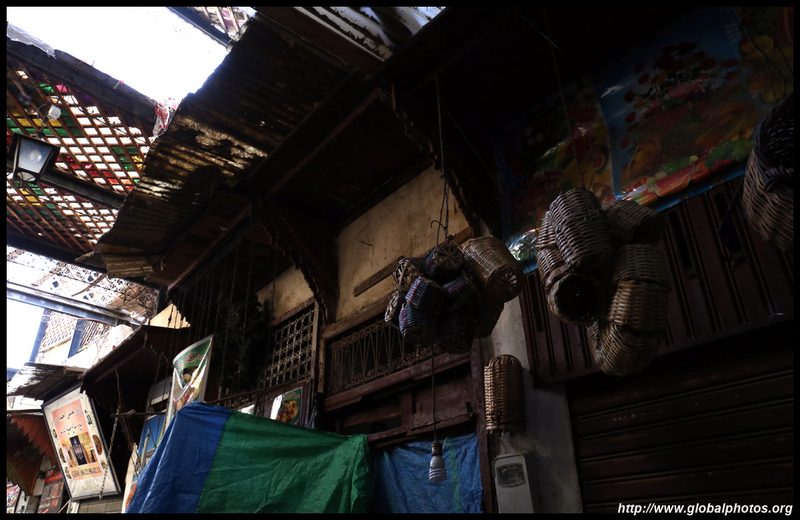 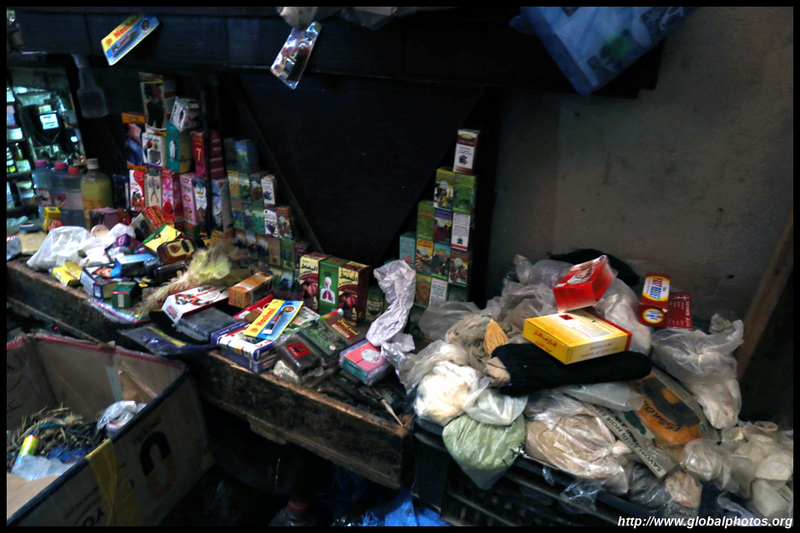 It is not a tourist market by any means, but nevertheless a great place for tourists to wander, get lost, and explore for hours. 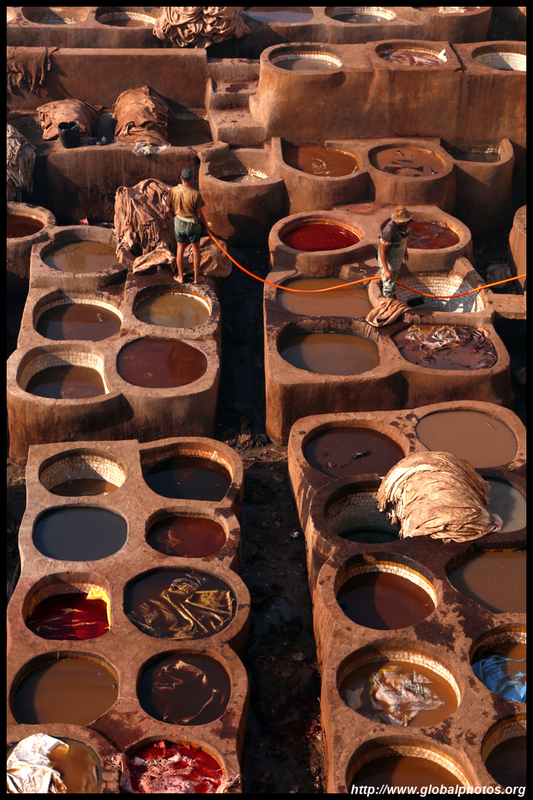 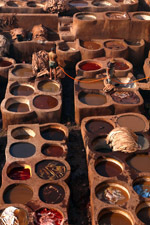 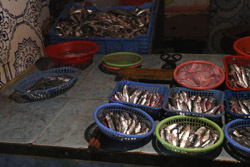 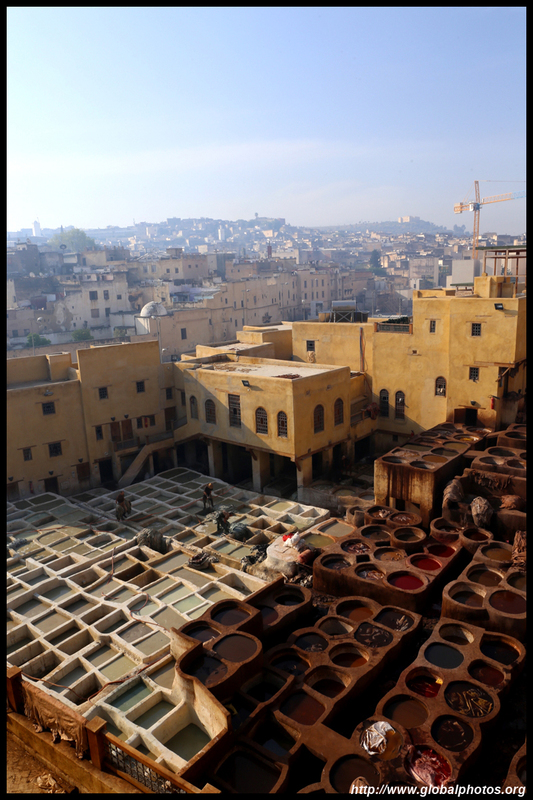 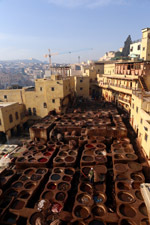 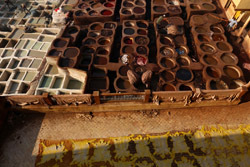 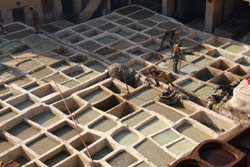 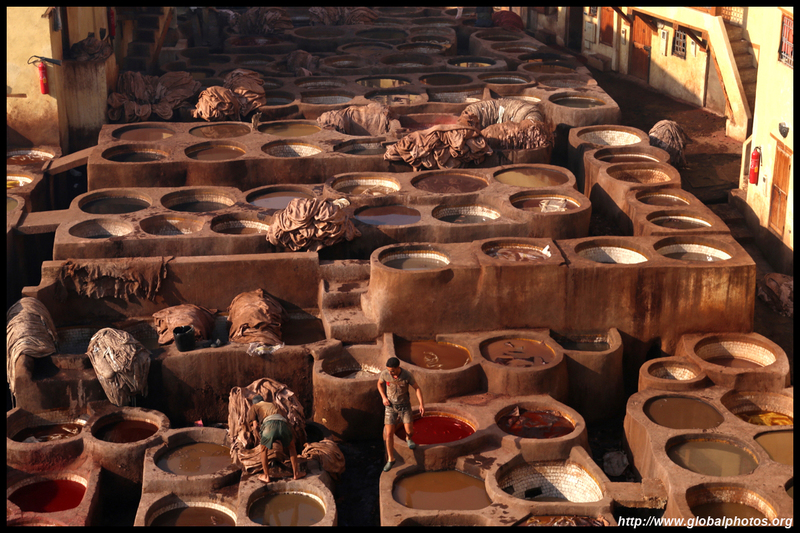 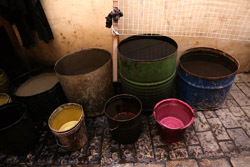 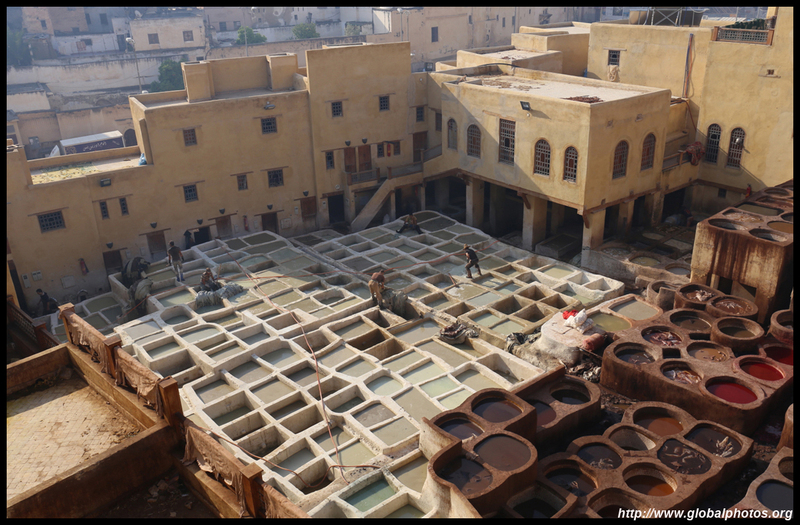 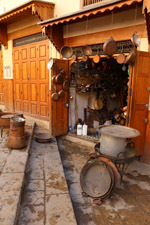 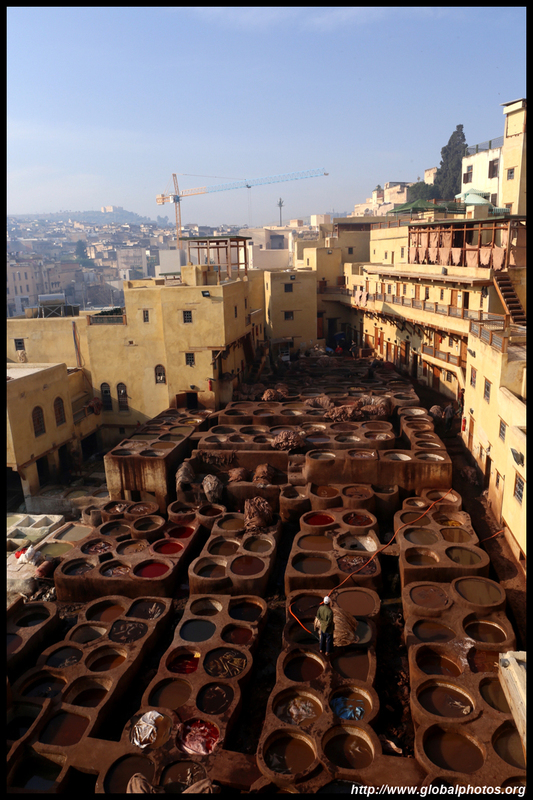 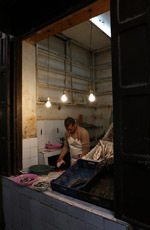 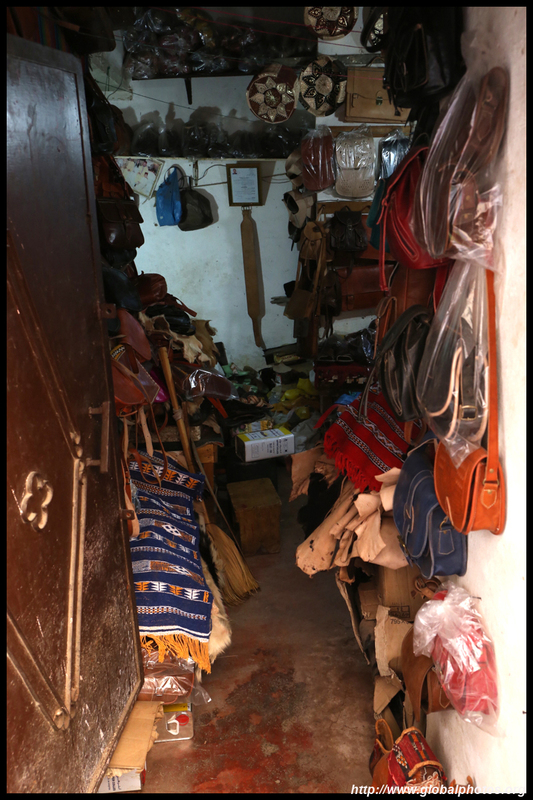 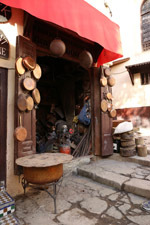 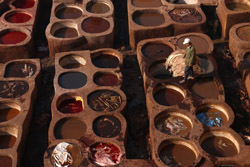 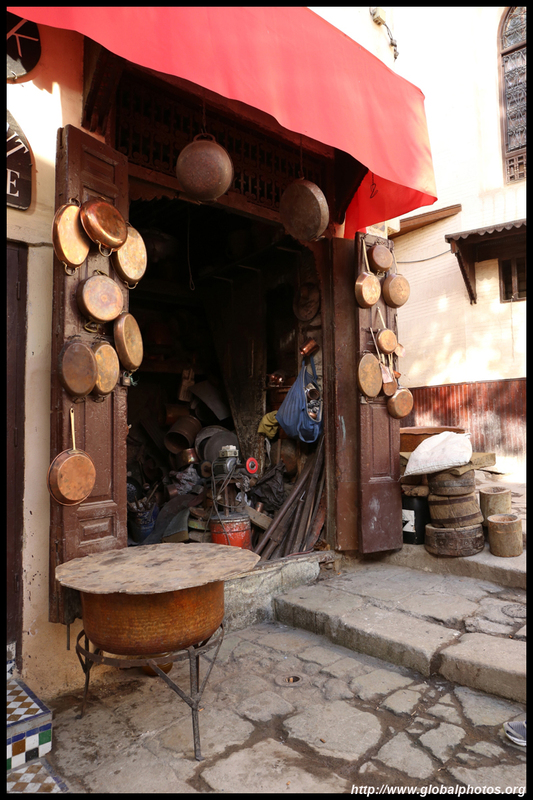 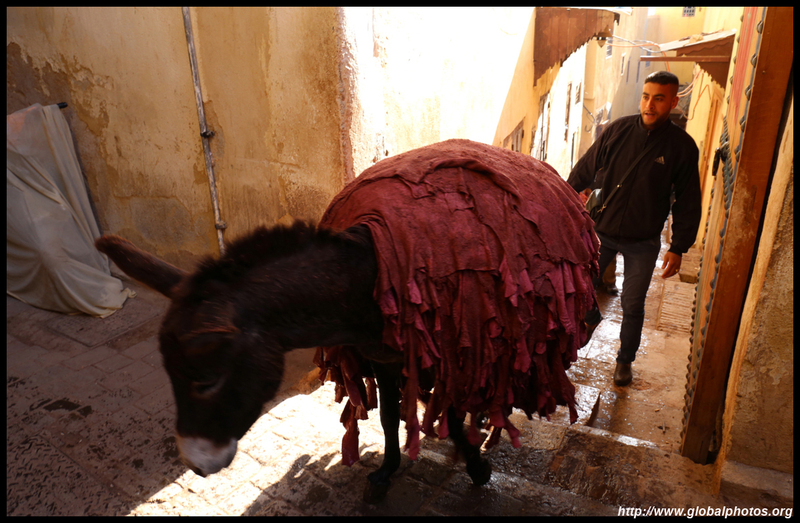 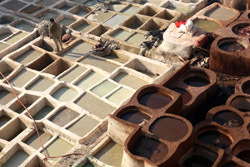 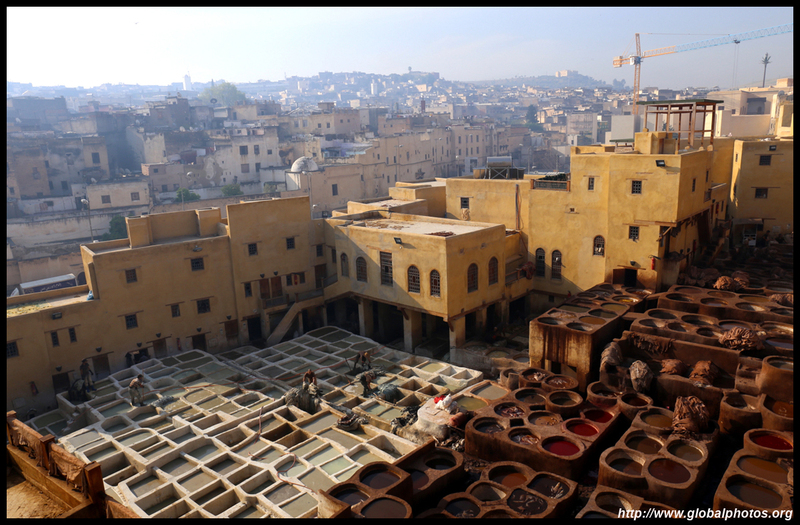 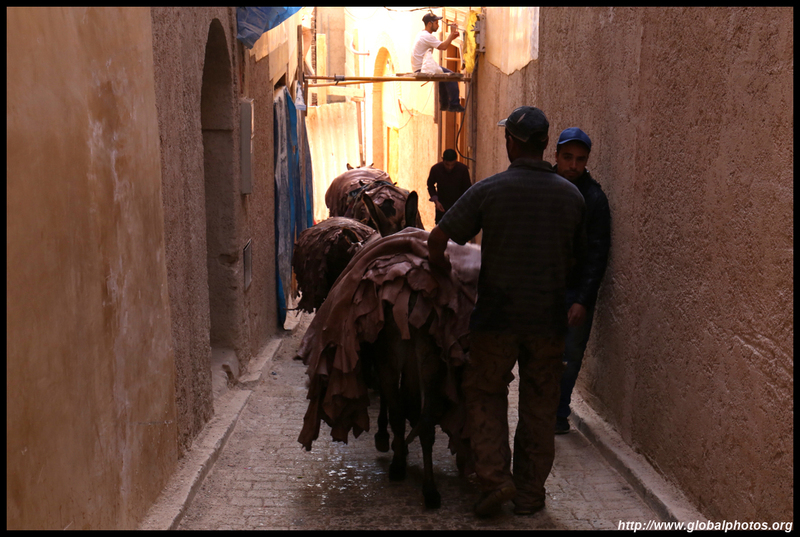 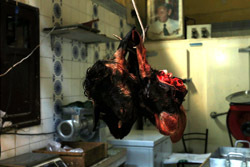 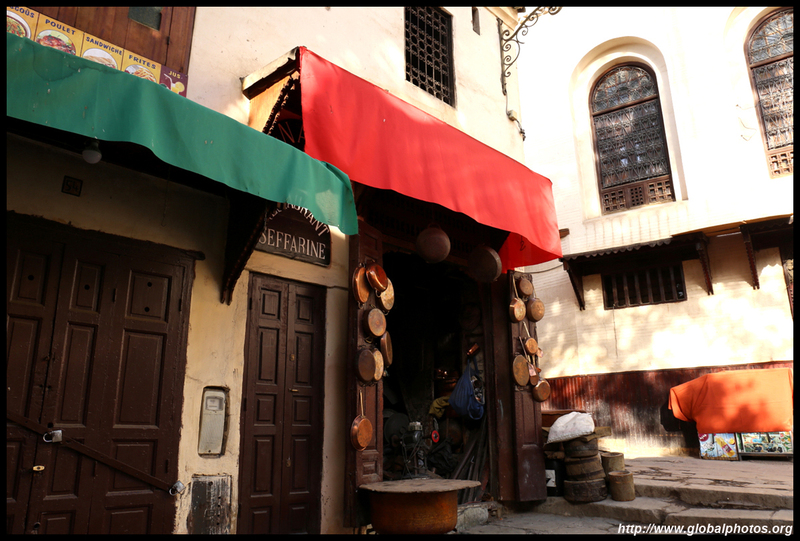 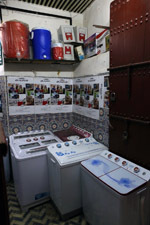 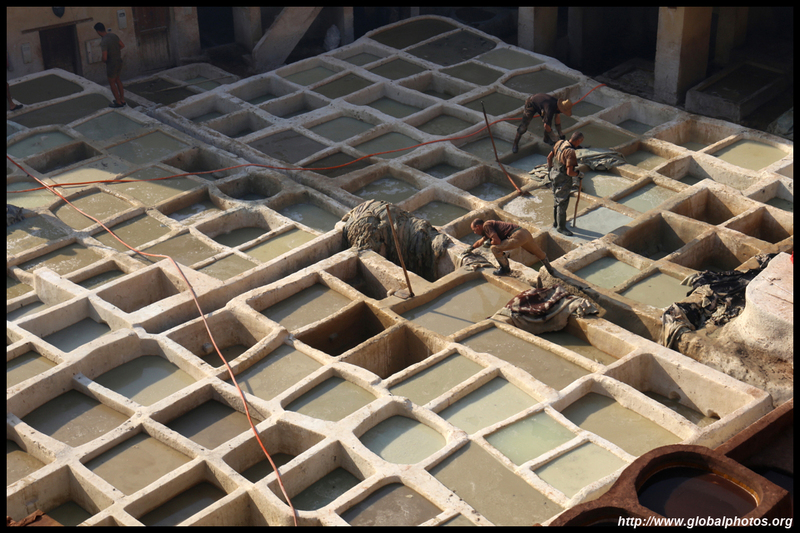 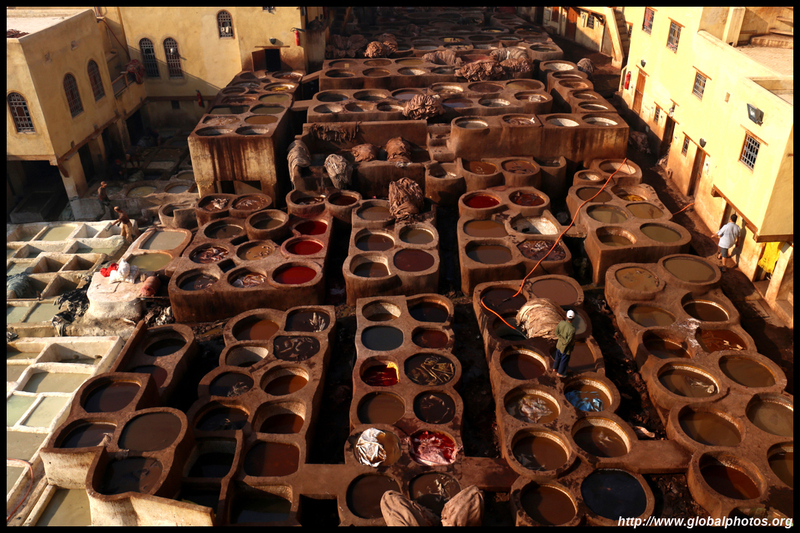 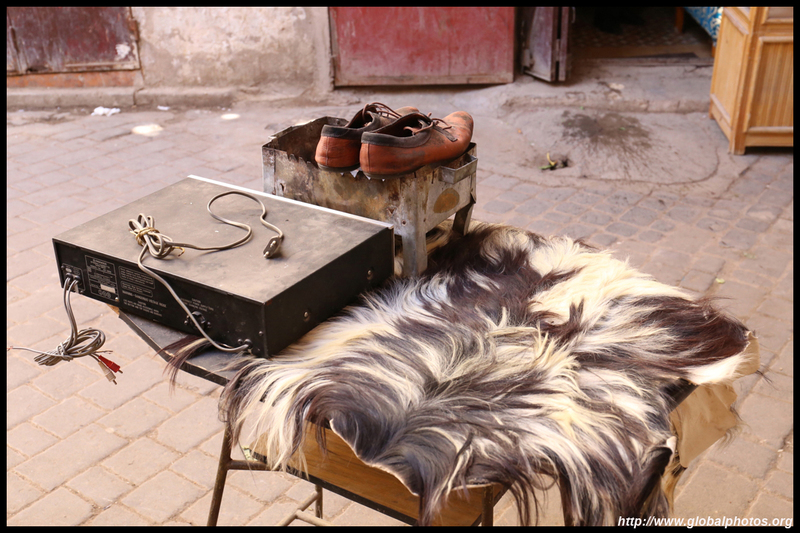 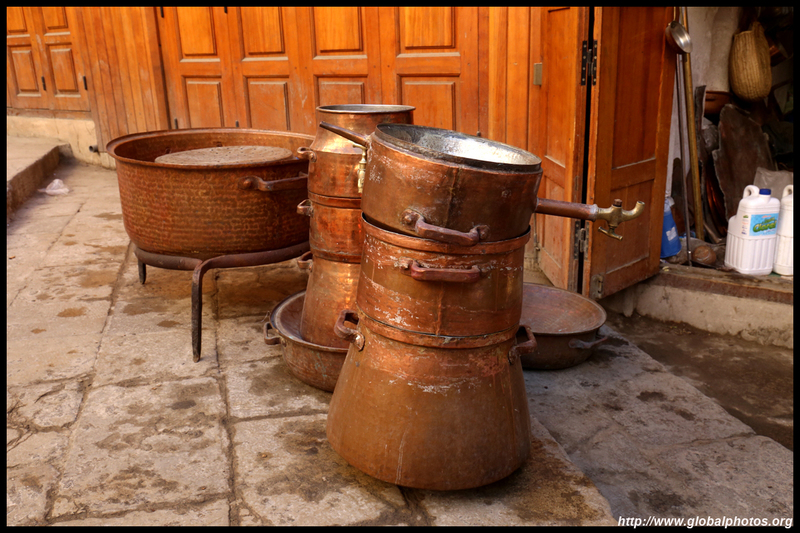 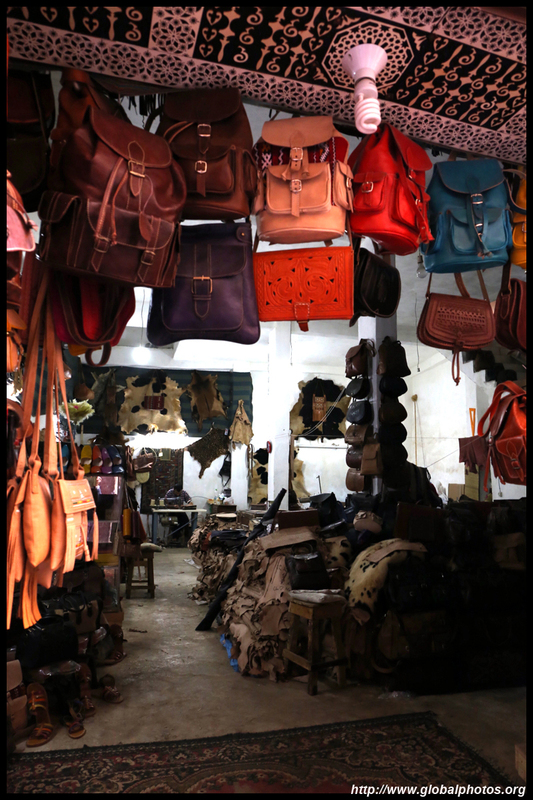 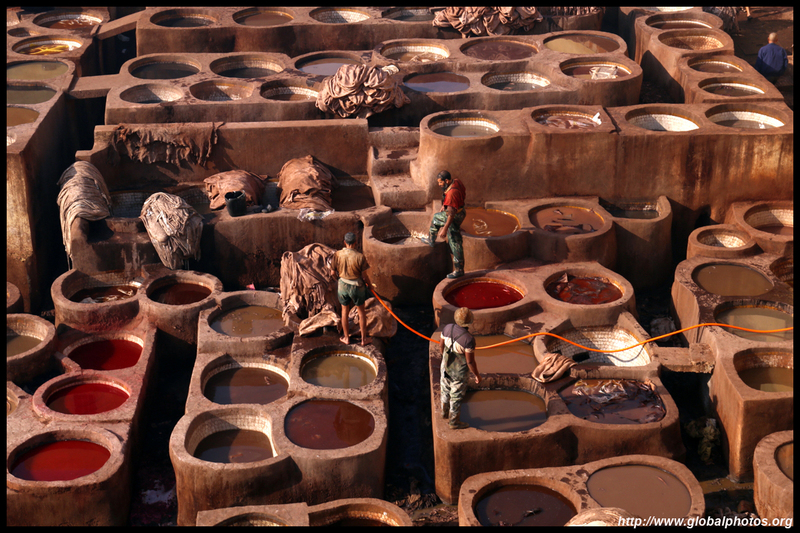 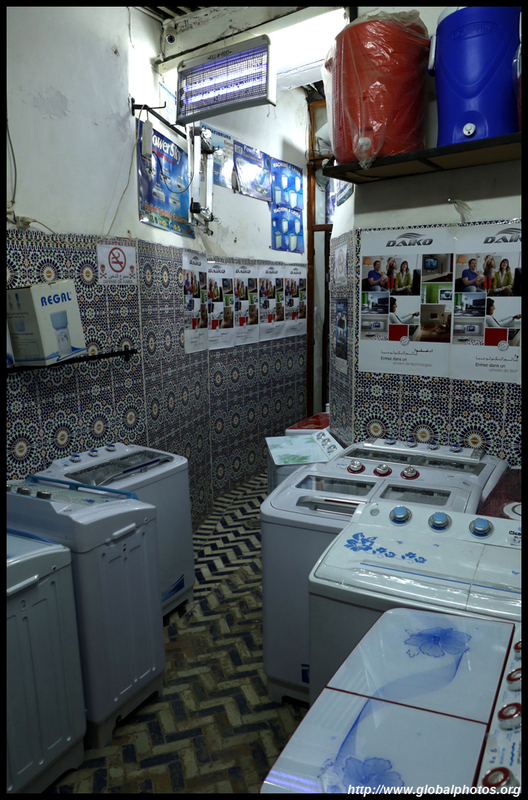 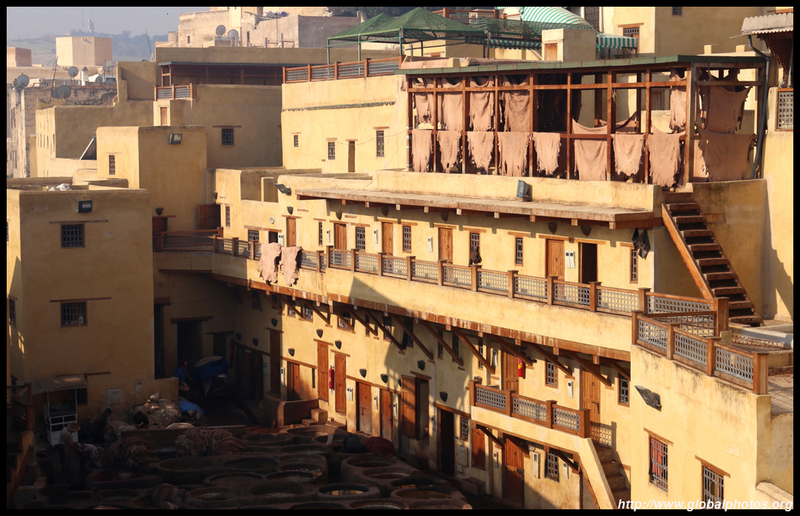 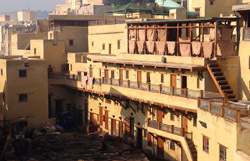 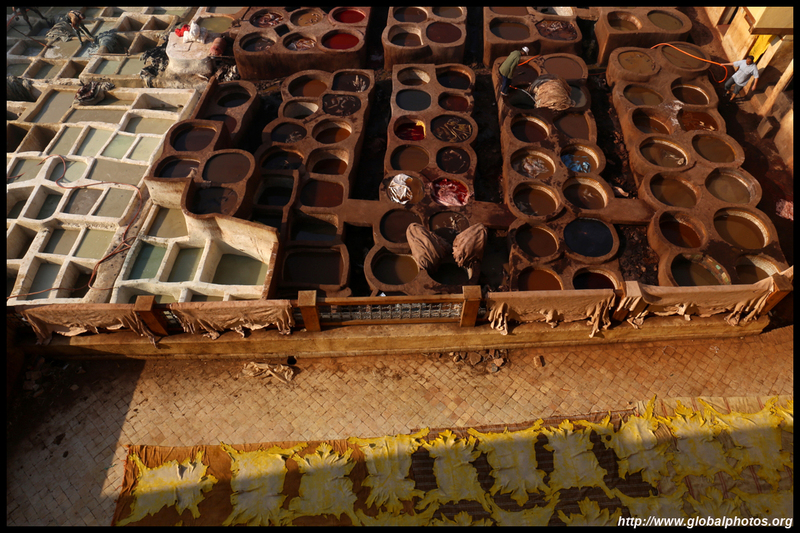 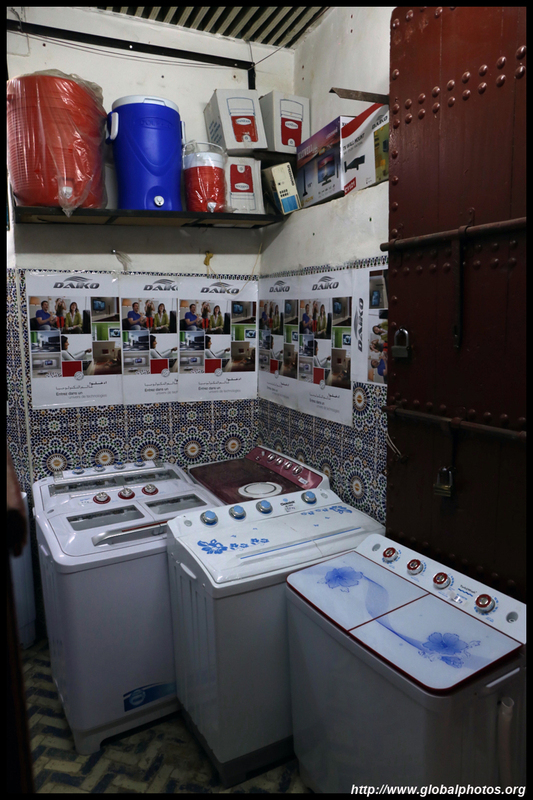 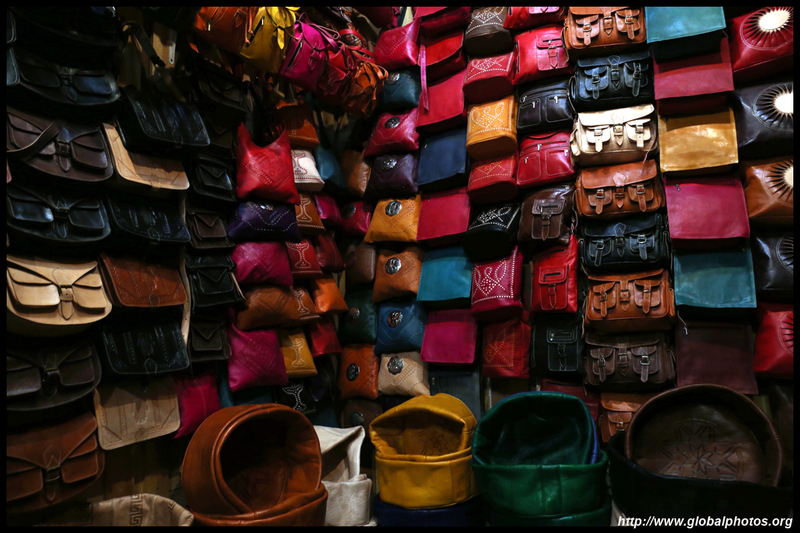 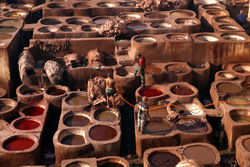 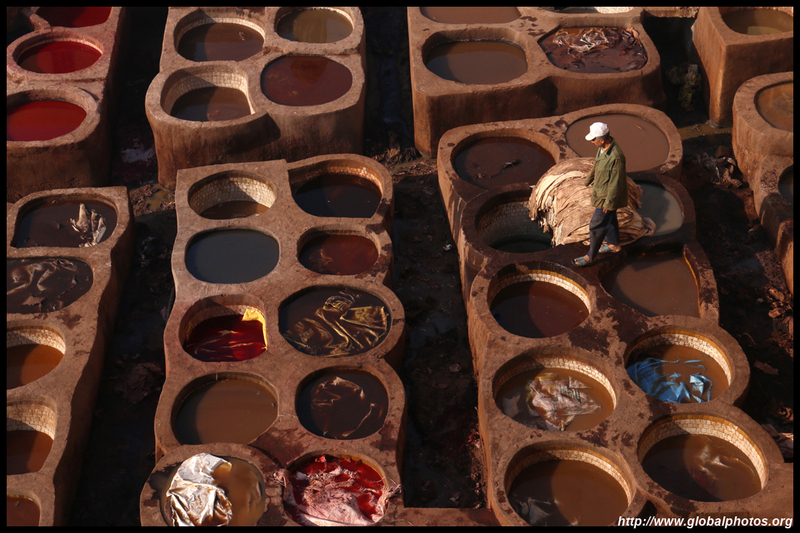 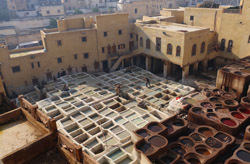 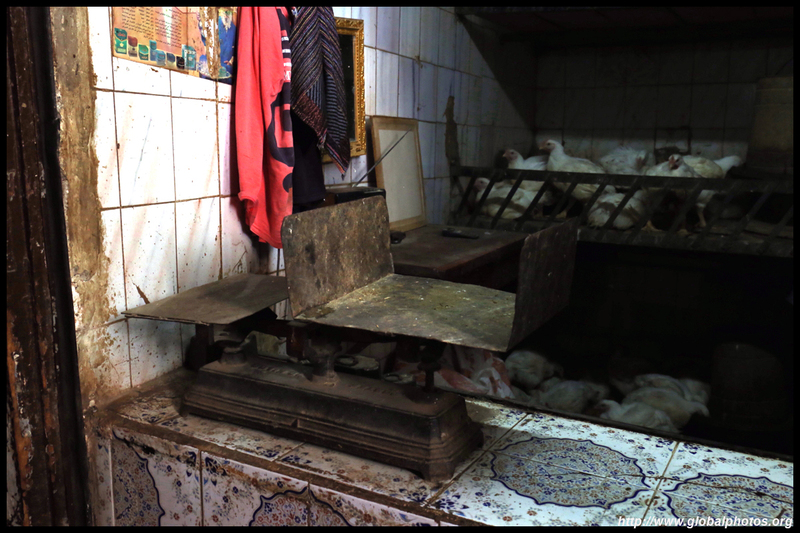 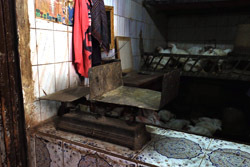 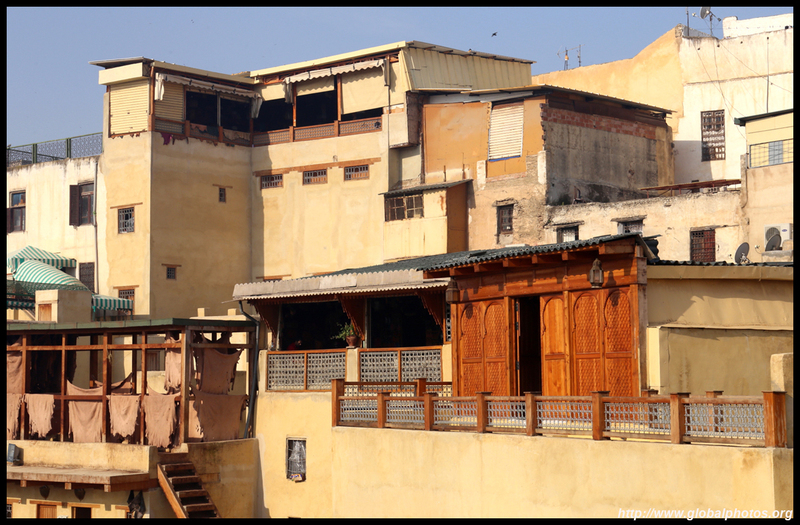 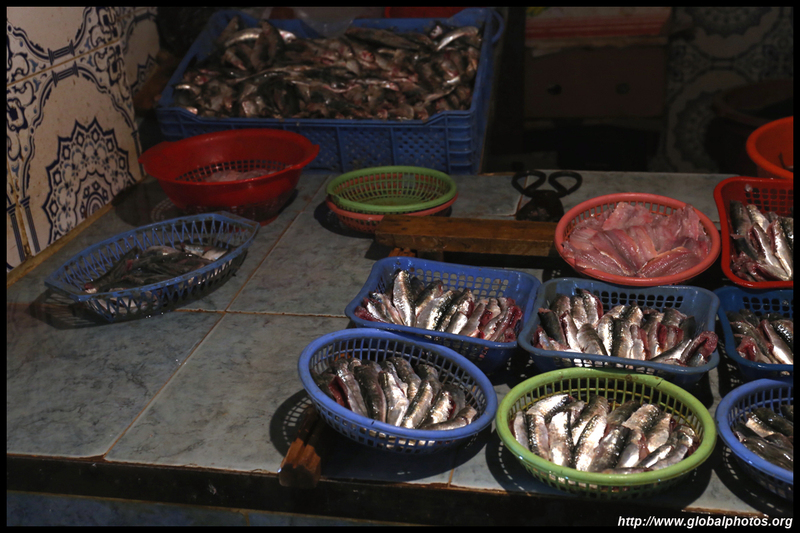 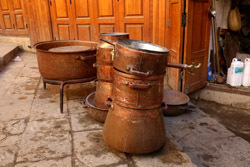 Tanneries are usually located near water and away from residential areas due to the intense stench arising from leather production. 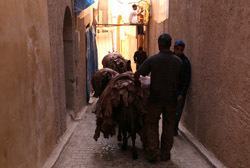 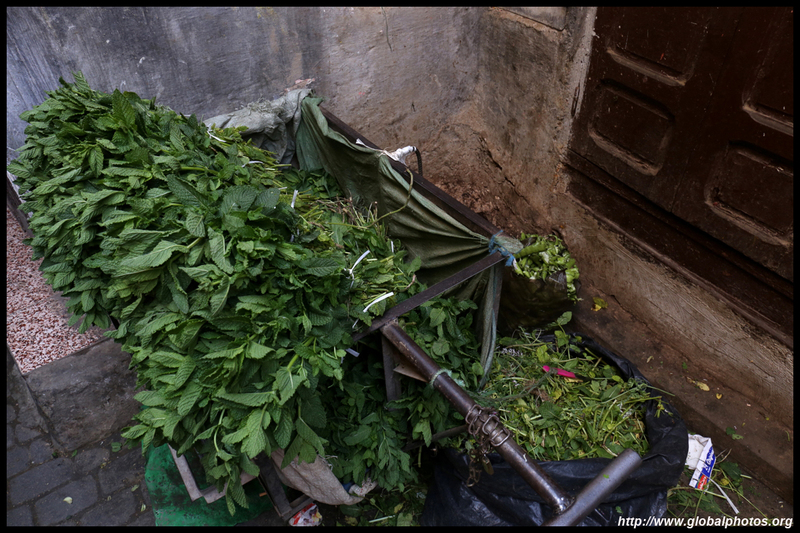 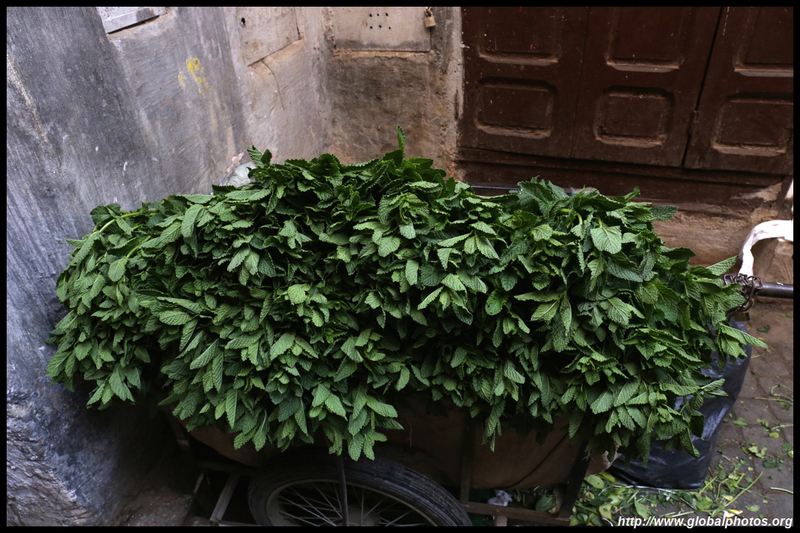 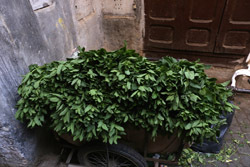 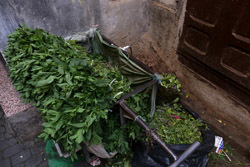 Luckily, I didn't need a mint leaf against my nose to see the workers treating animal hides in such treacherous conditions. 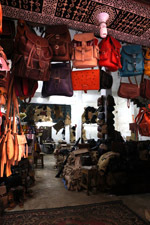 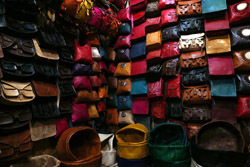 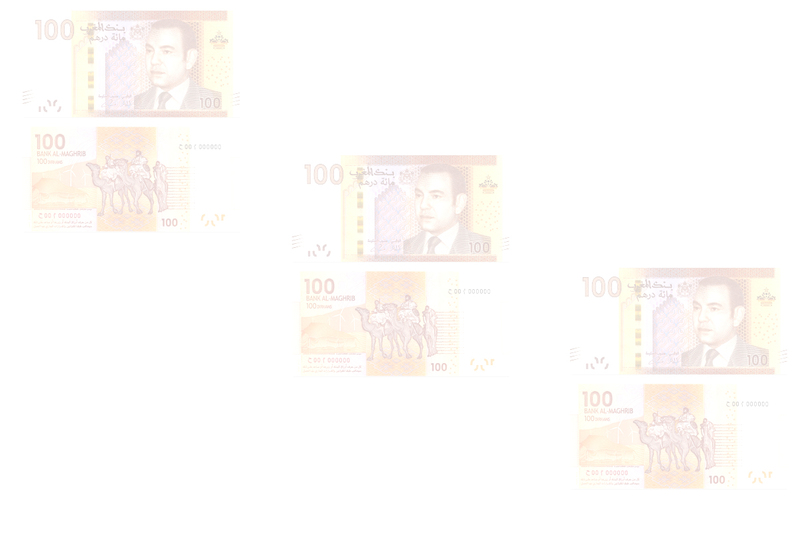 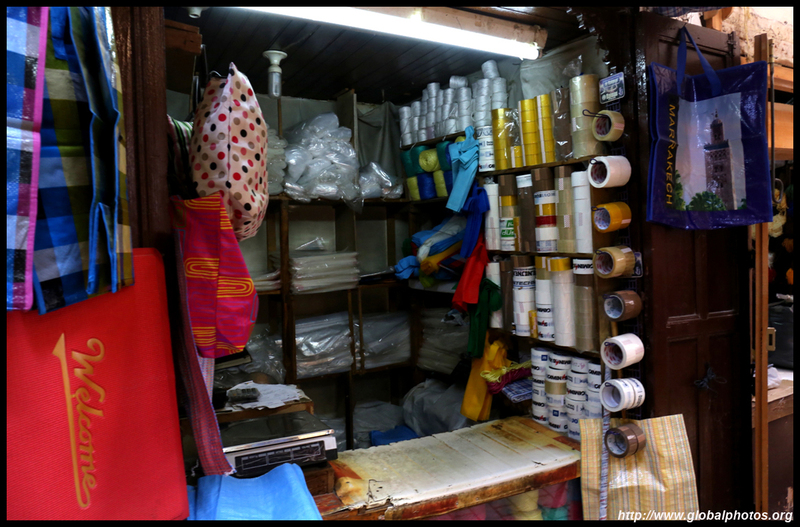 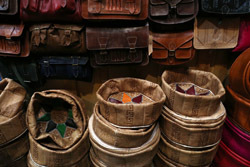 So, now do you want to buy a leather product? 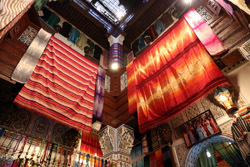 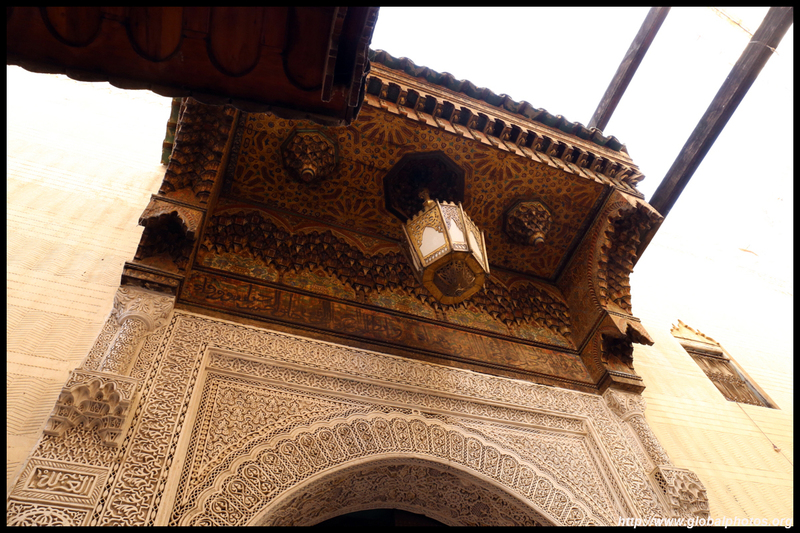 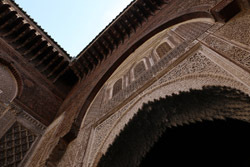 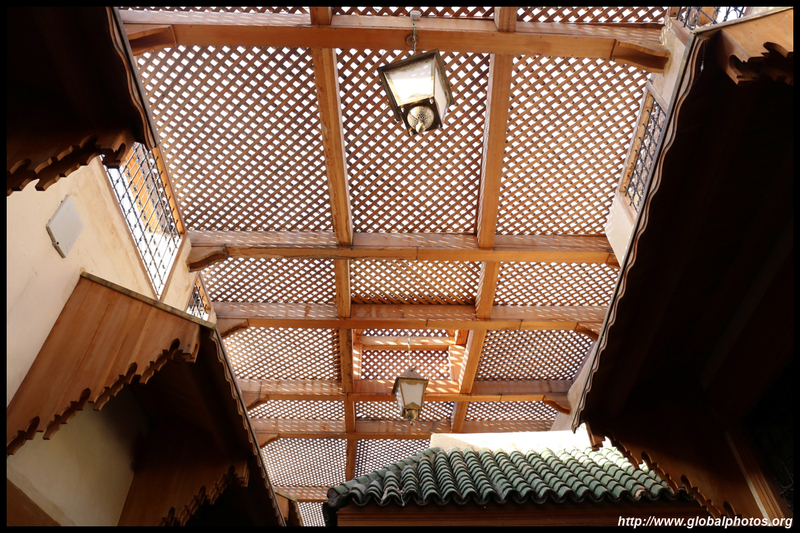 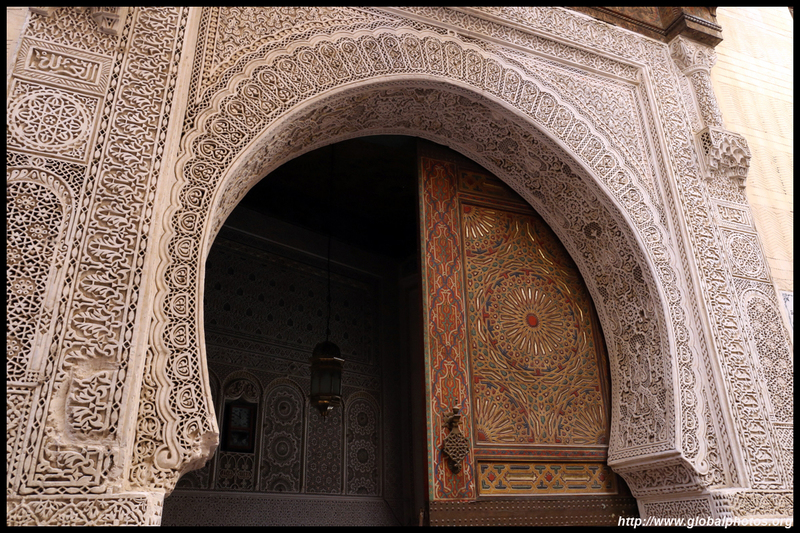 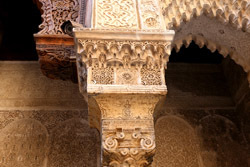 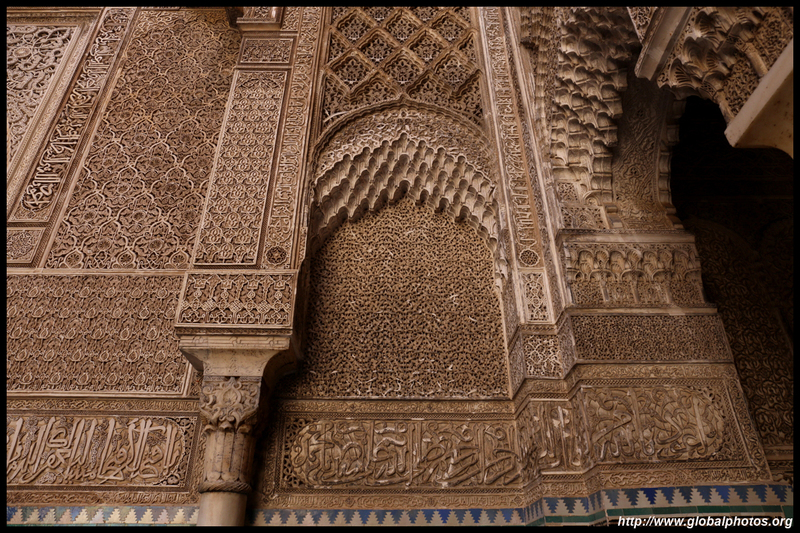 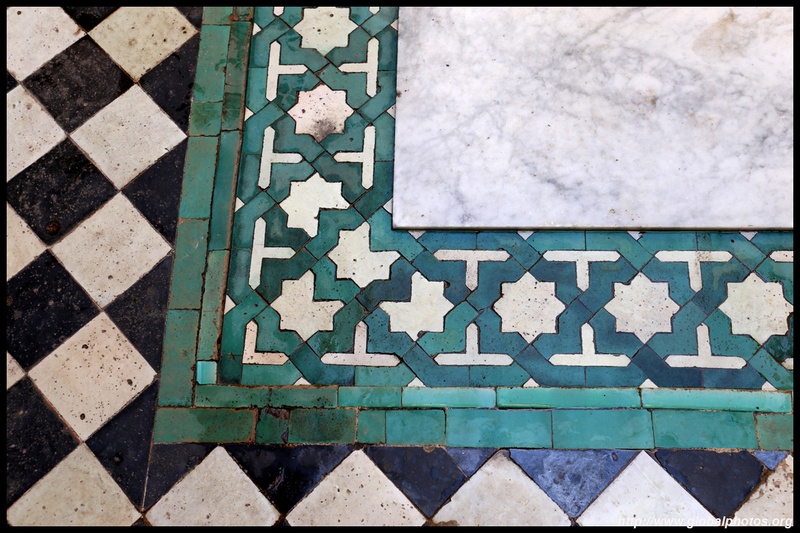 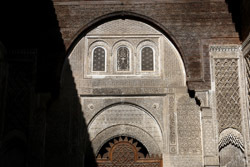 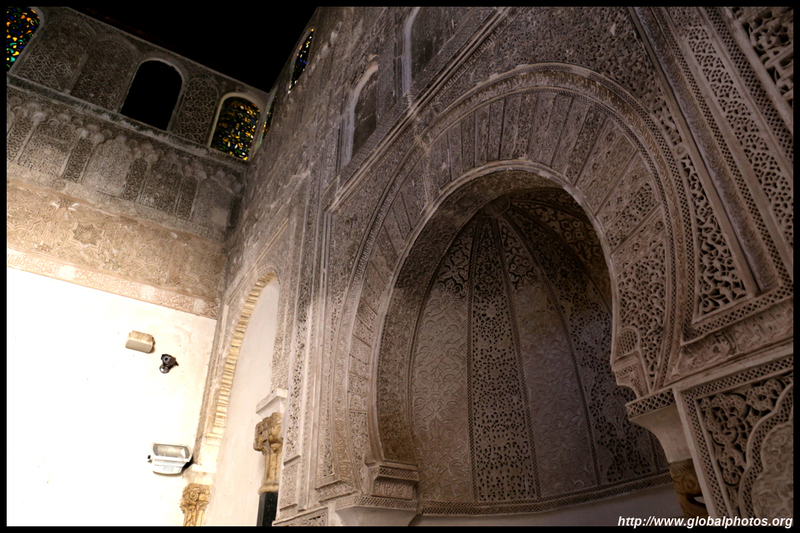 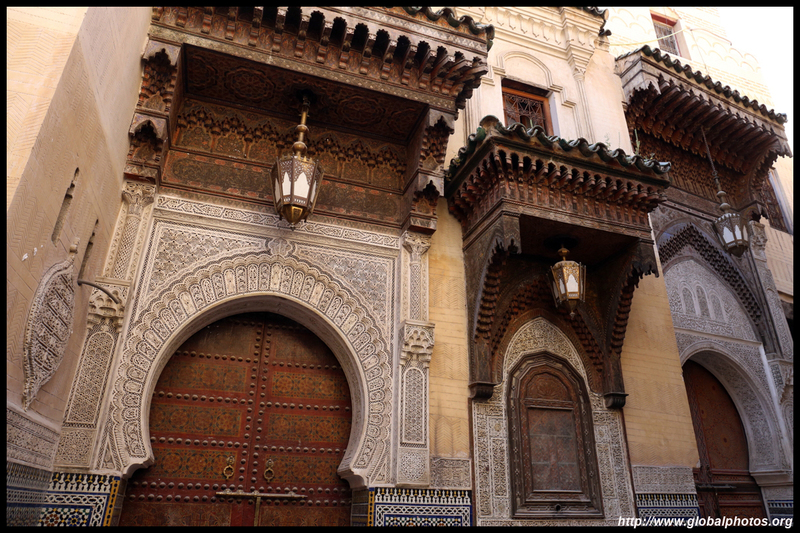 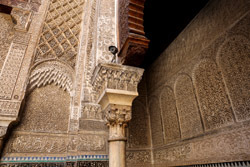 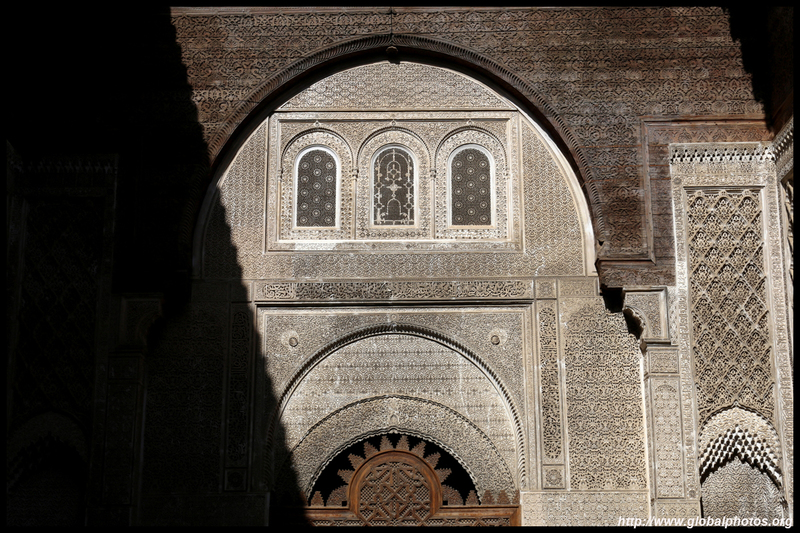 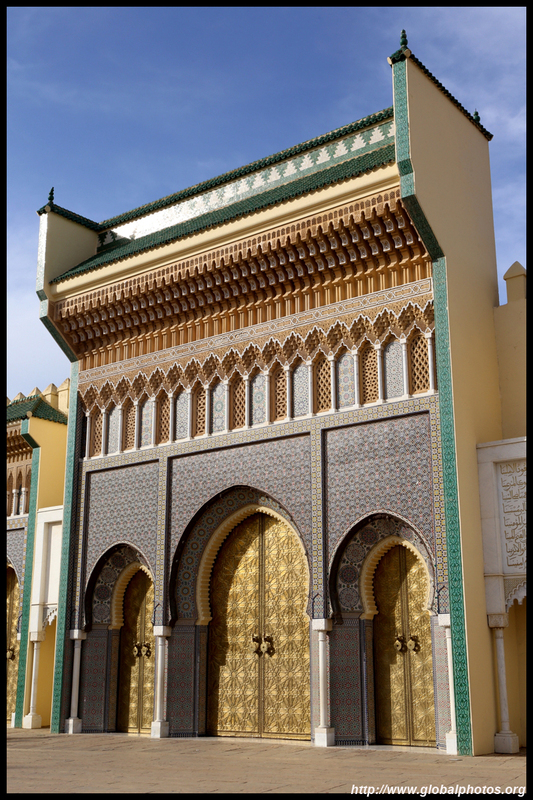 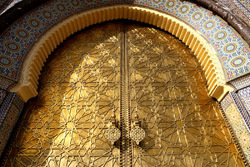 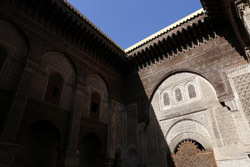 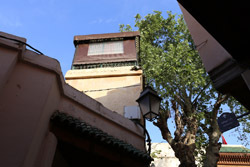 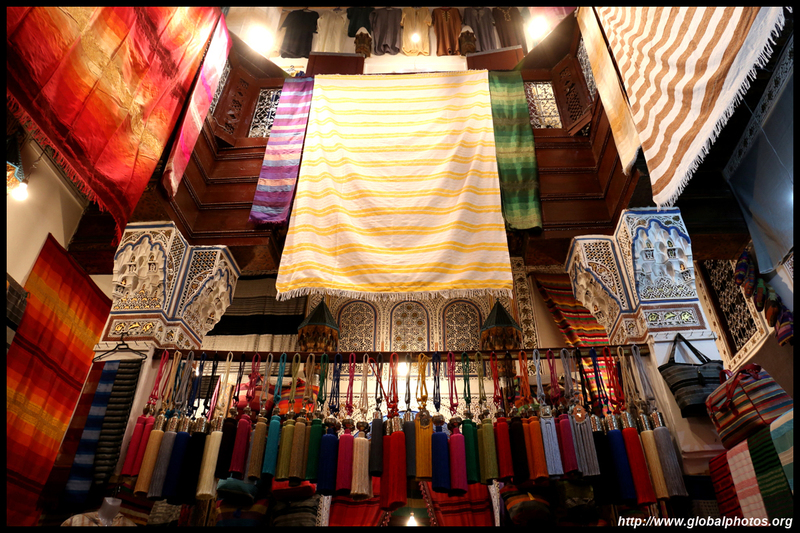 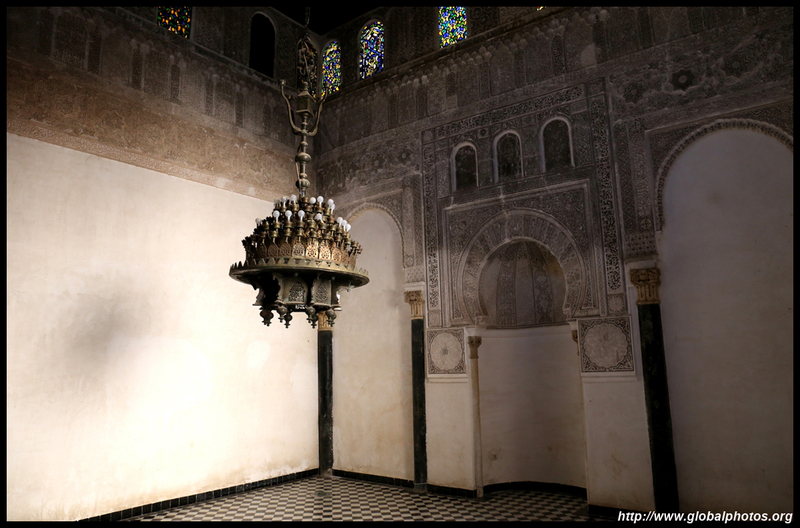 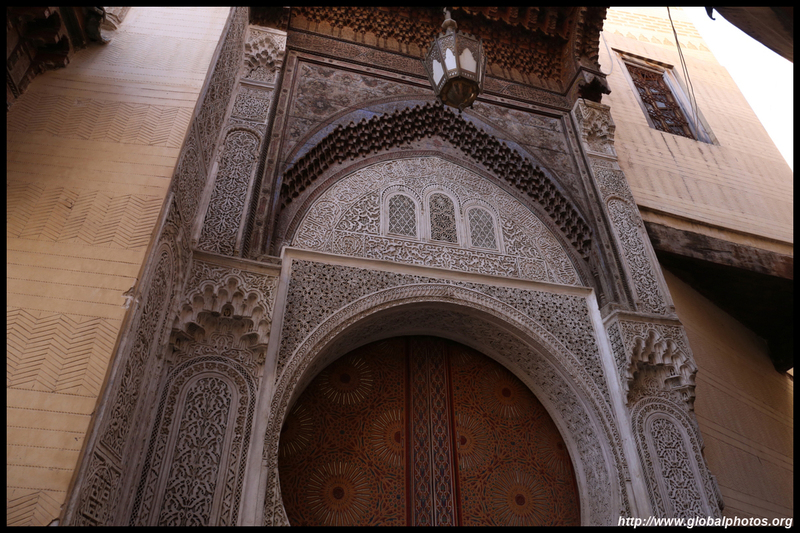 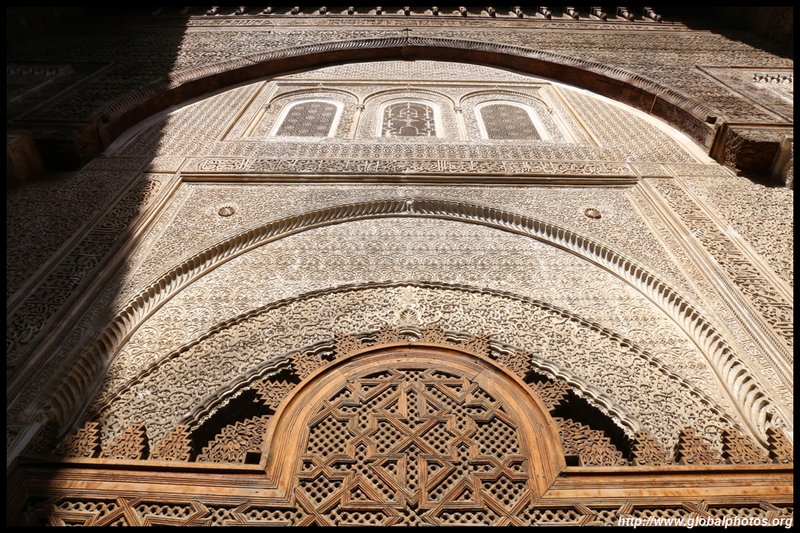 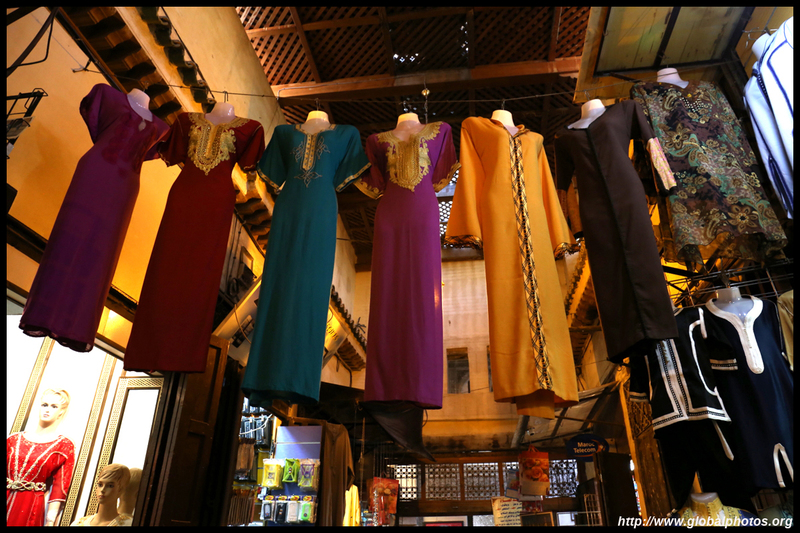 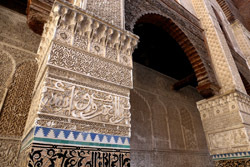 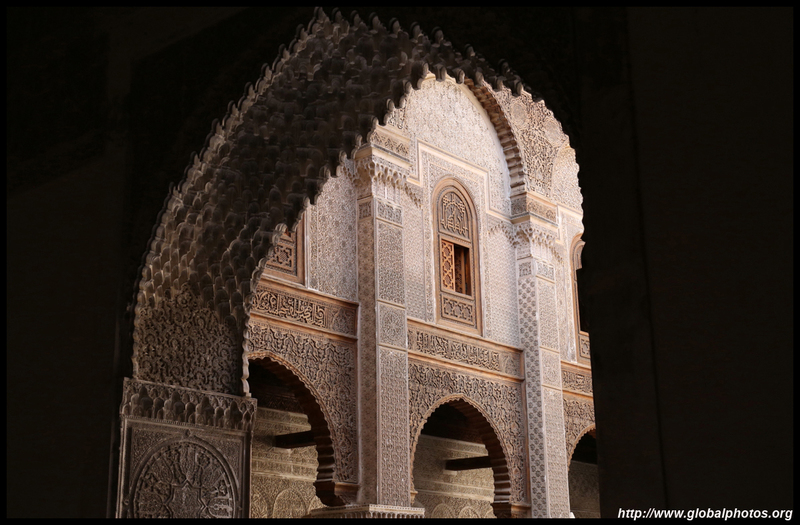 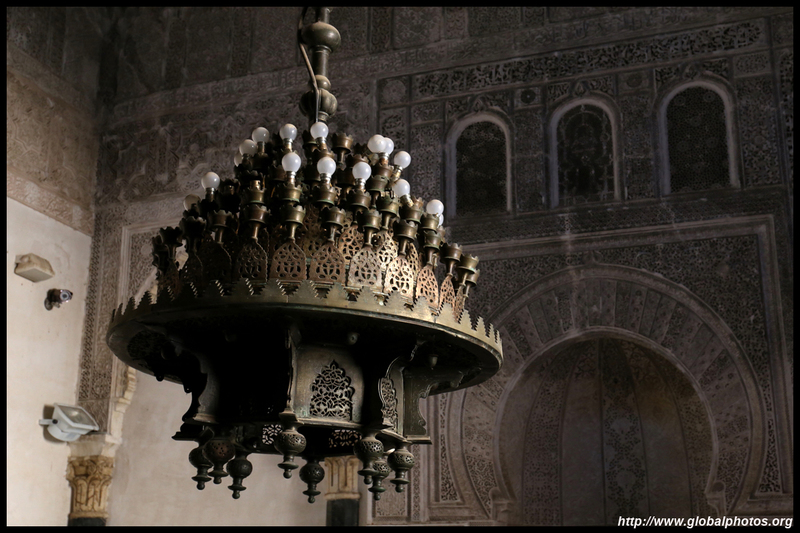 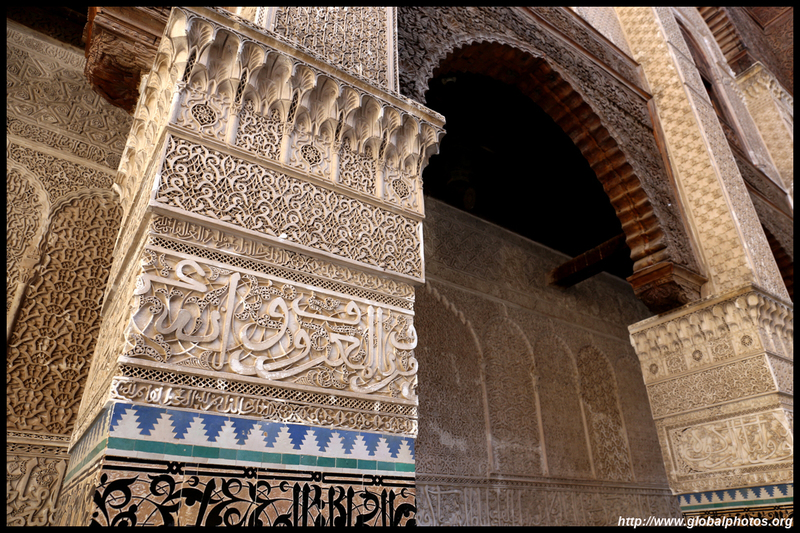 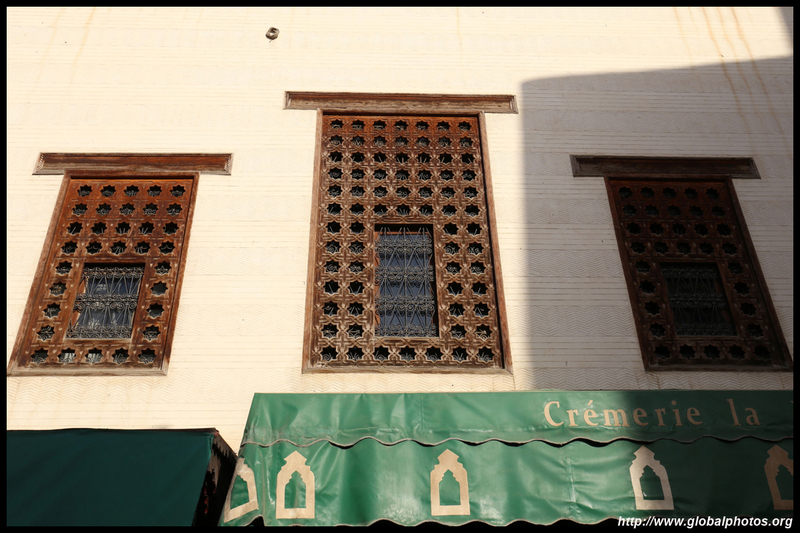 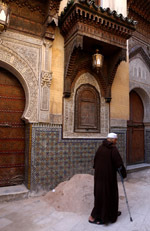 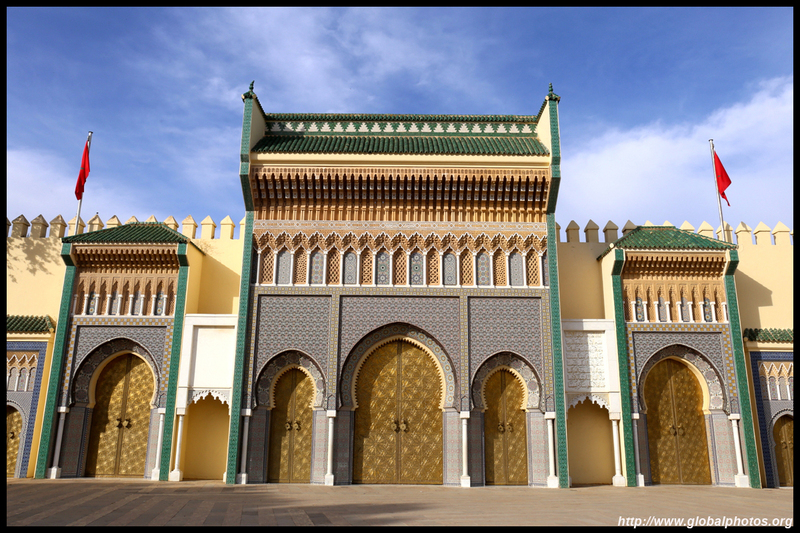 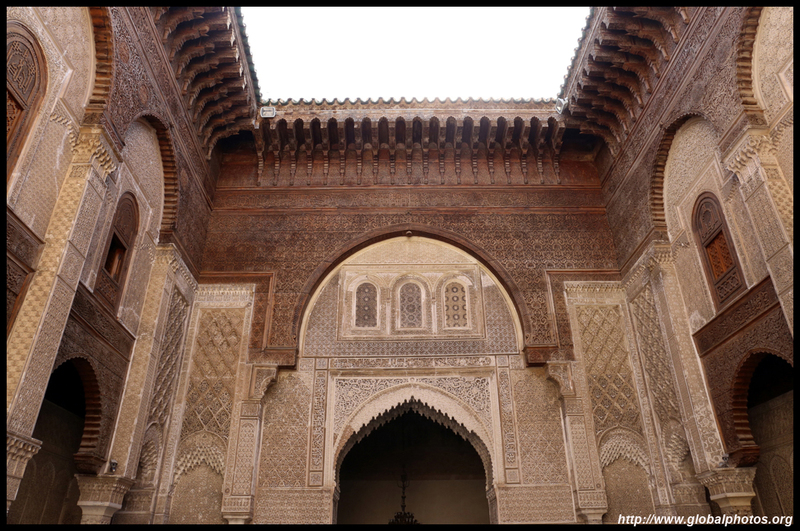 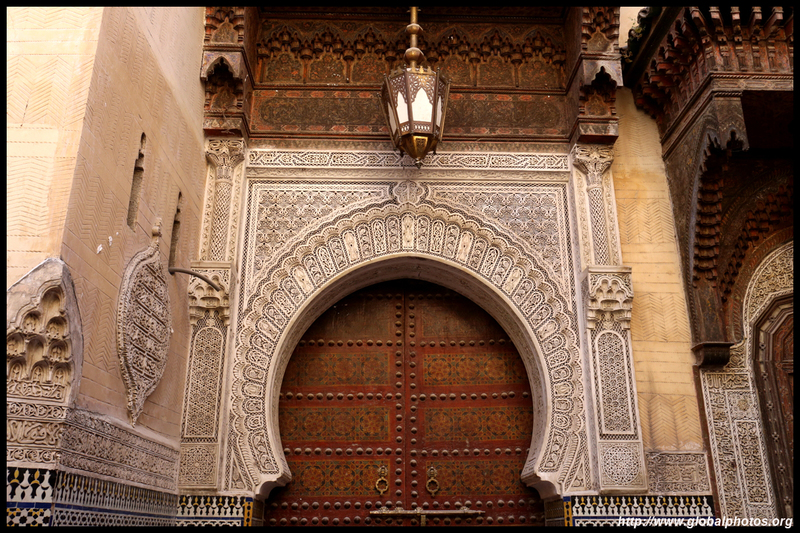 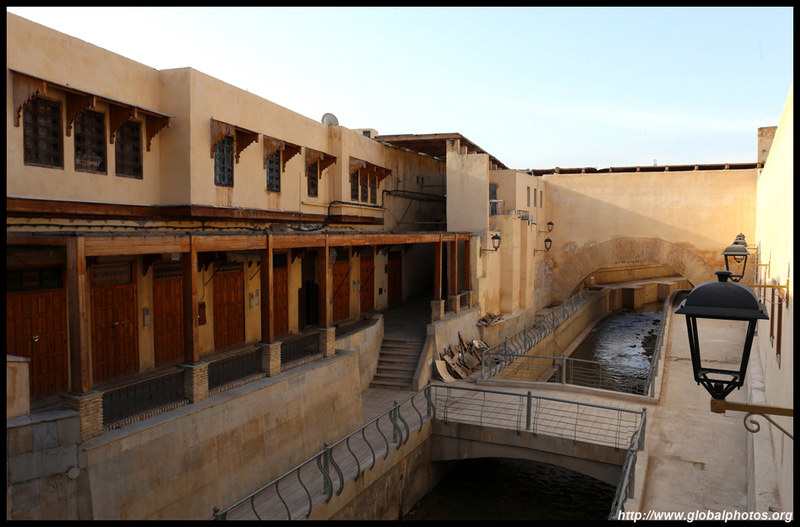 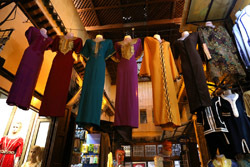 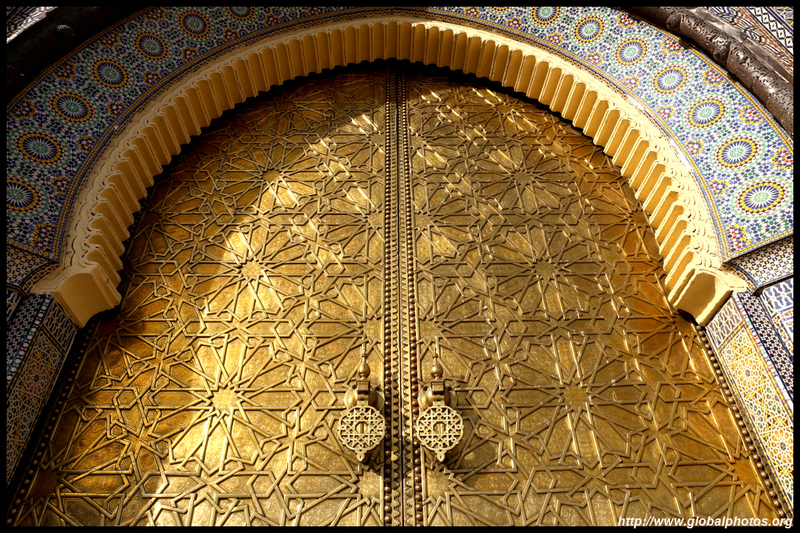 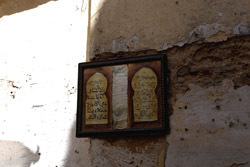 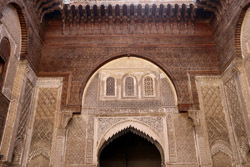 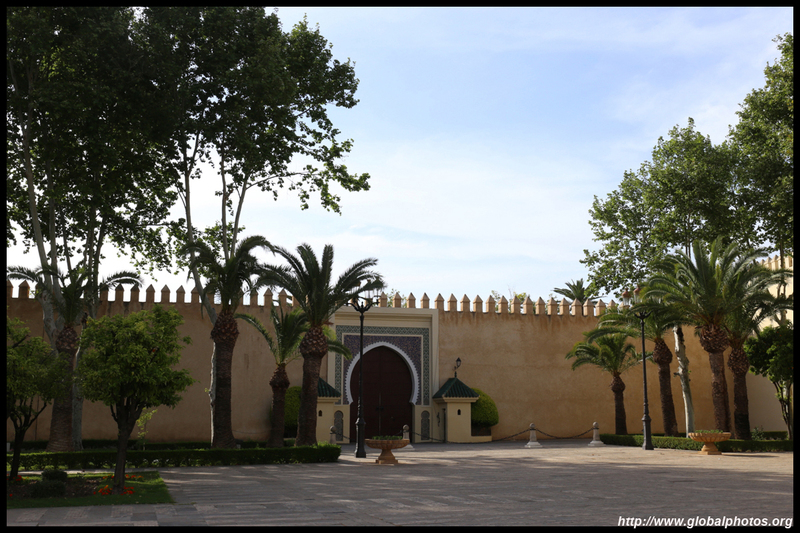 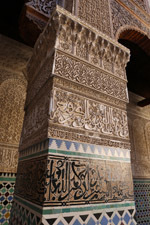 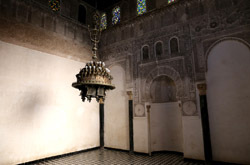 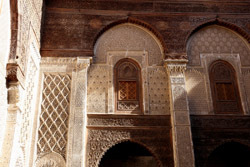 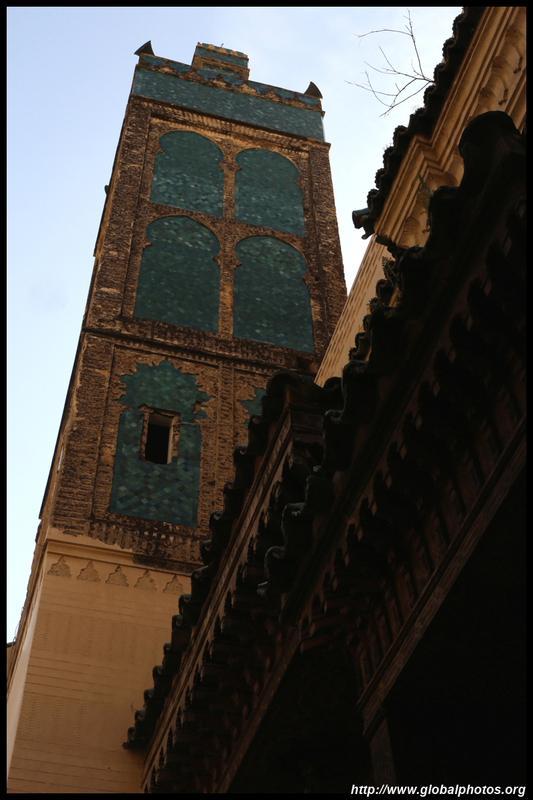 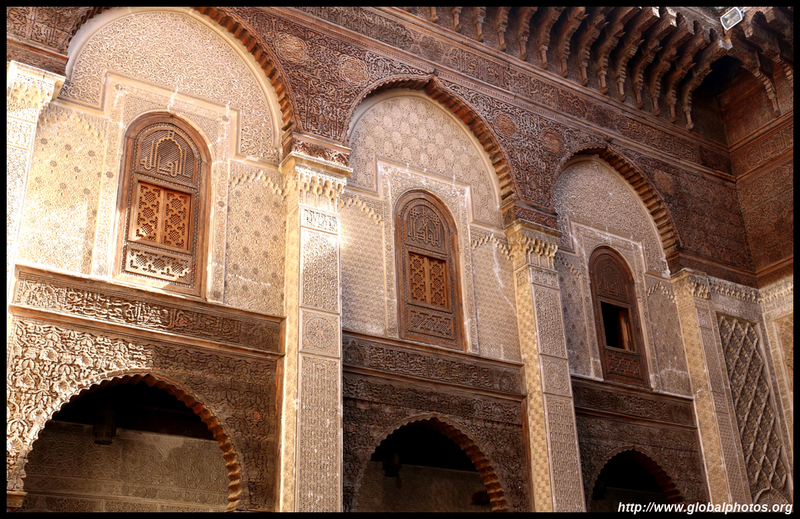 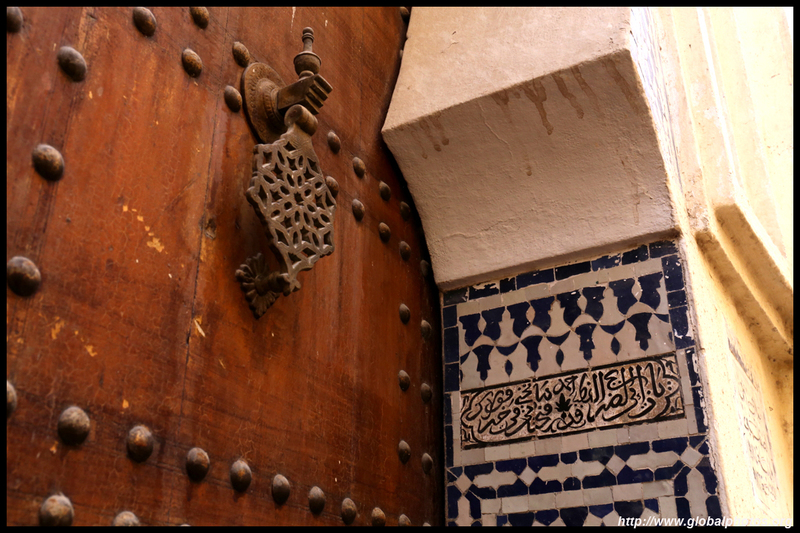 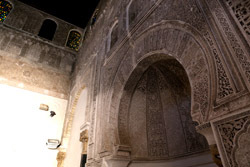 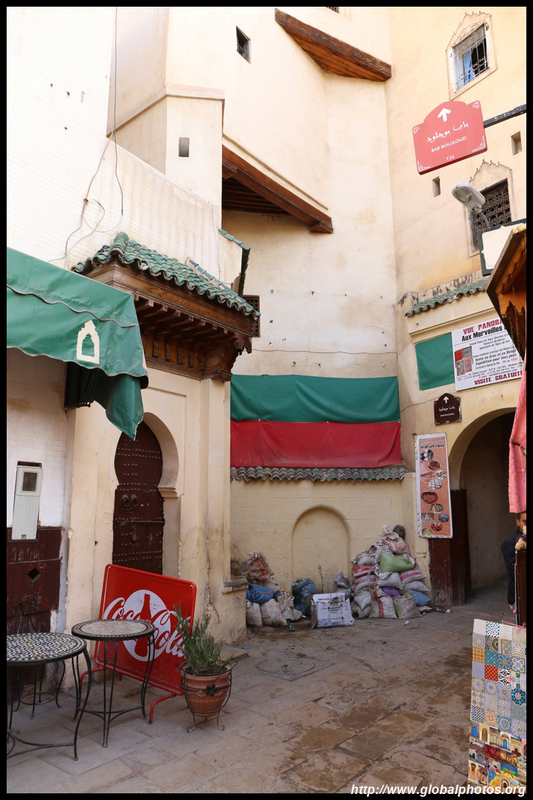 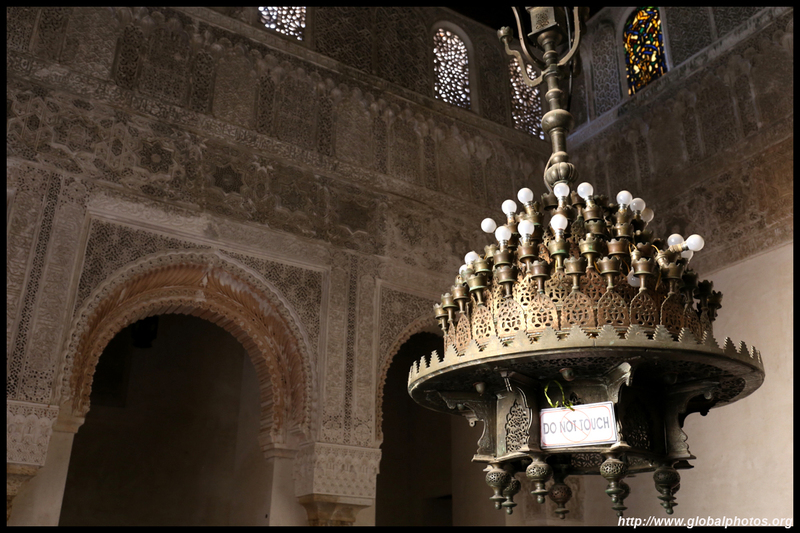 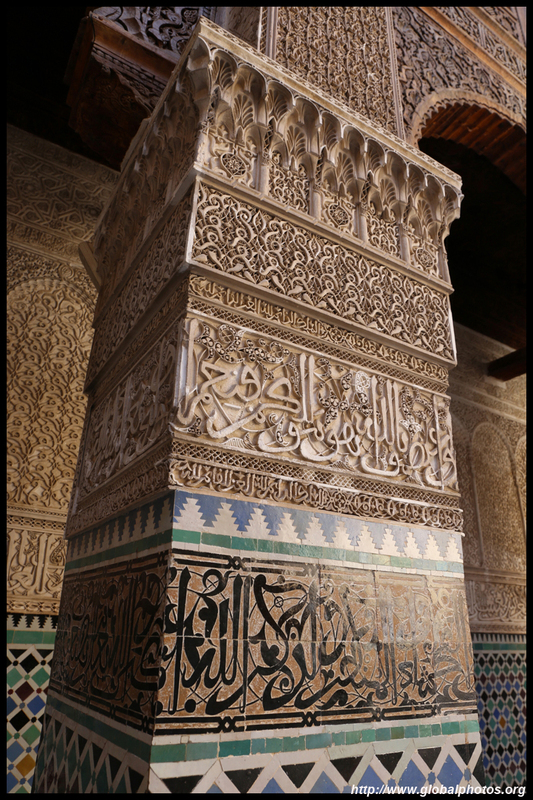 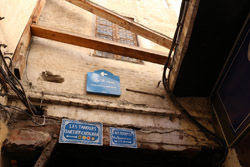 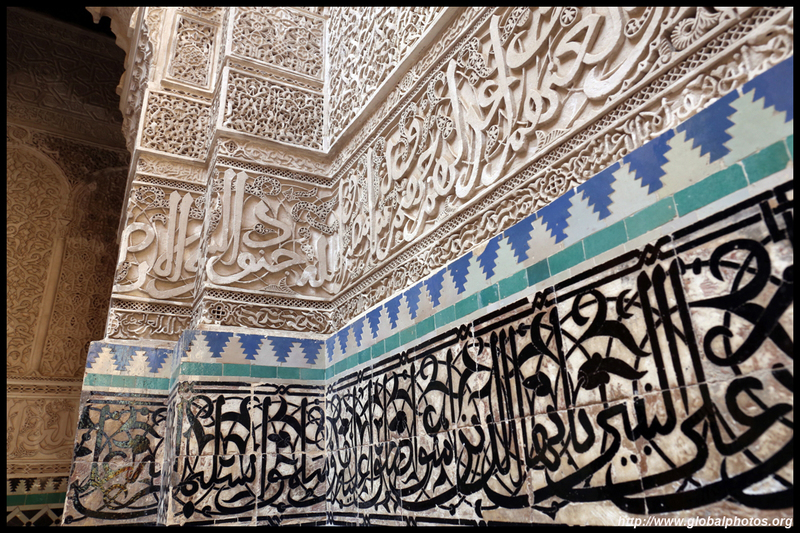 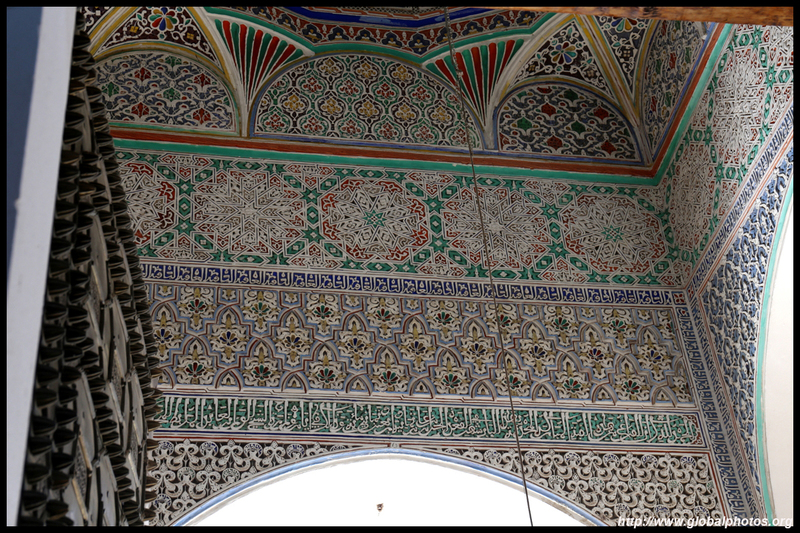 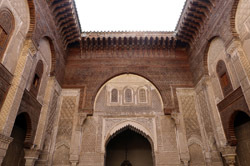 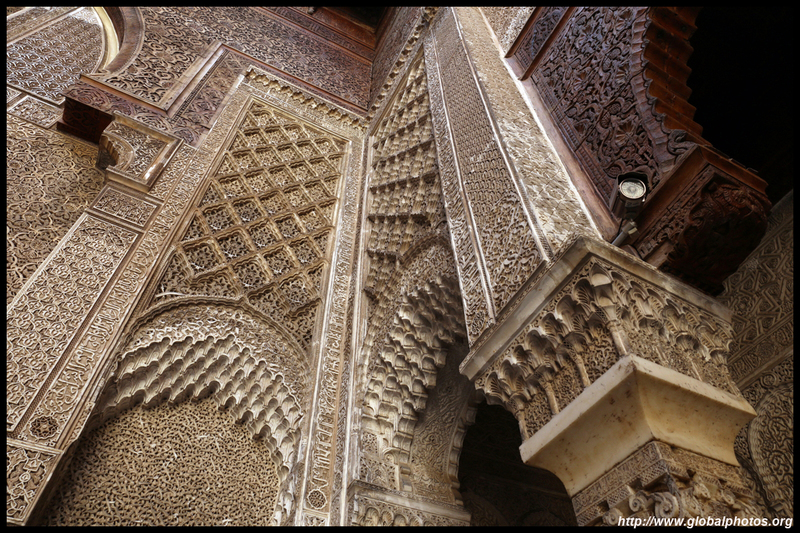 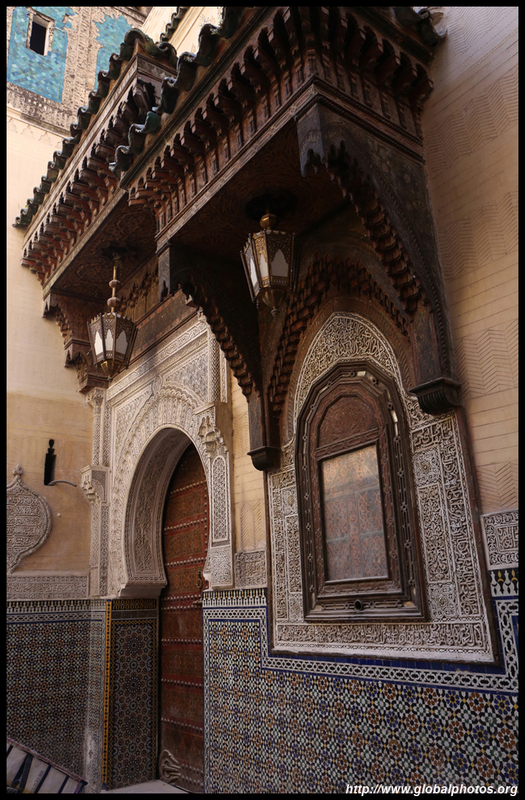 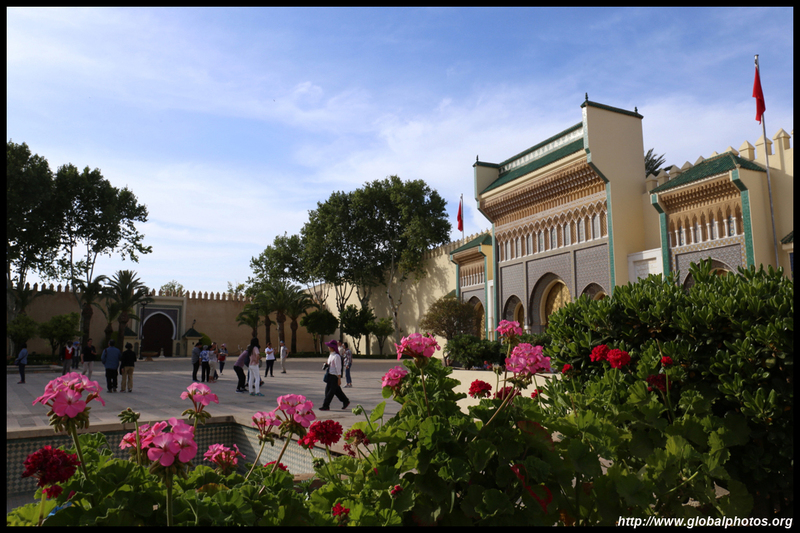 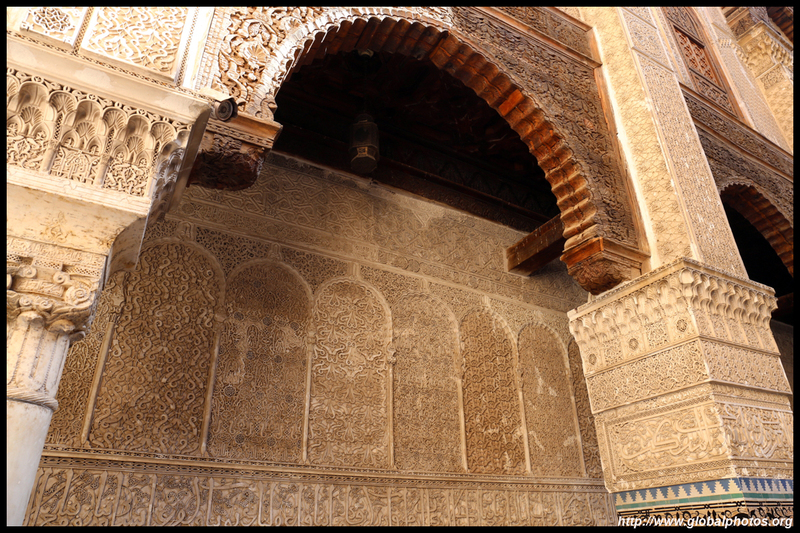 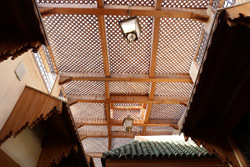 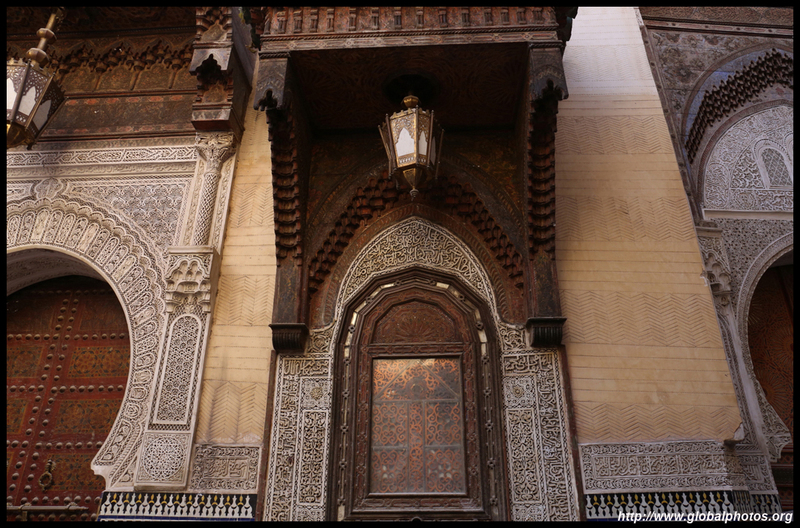 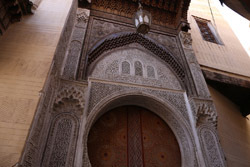 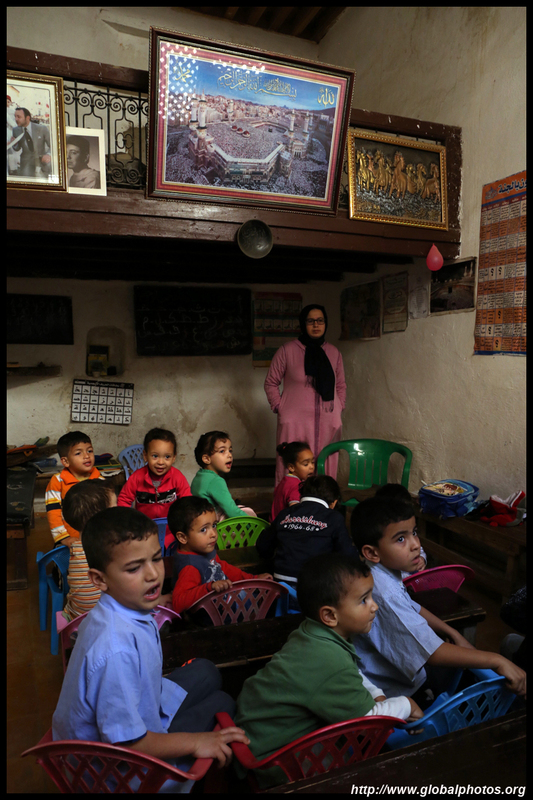 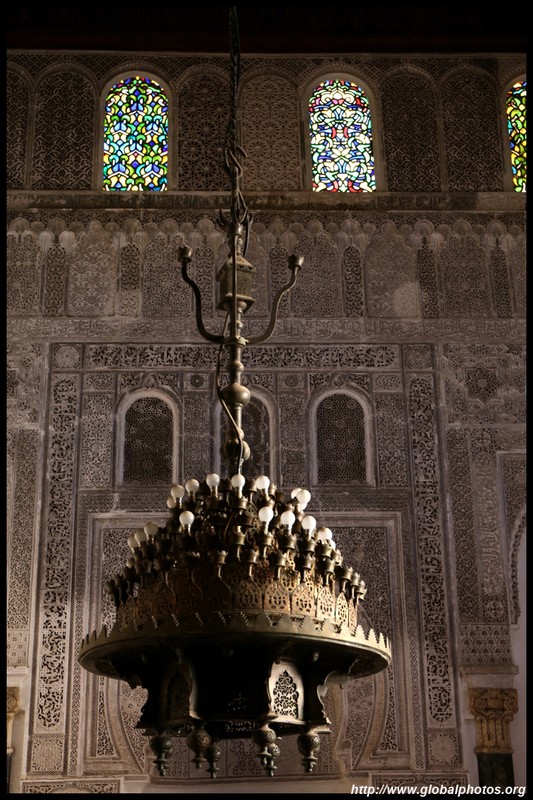 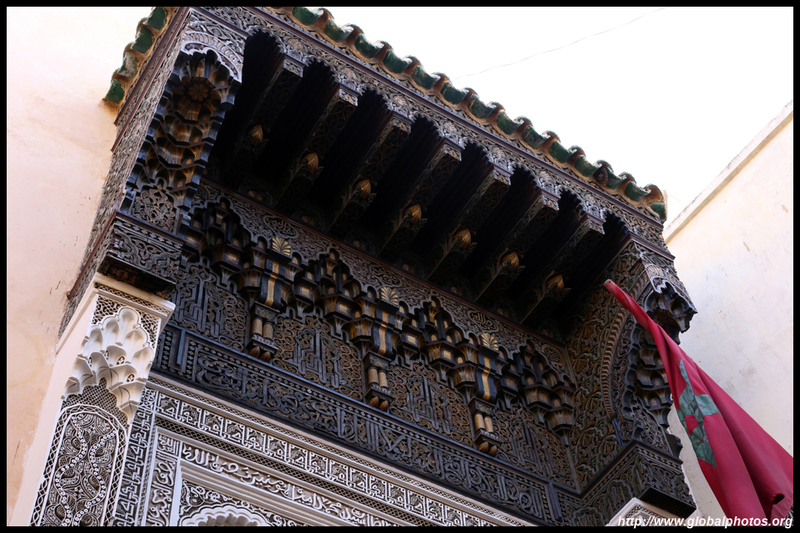 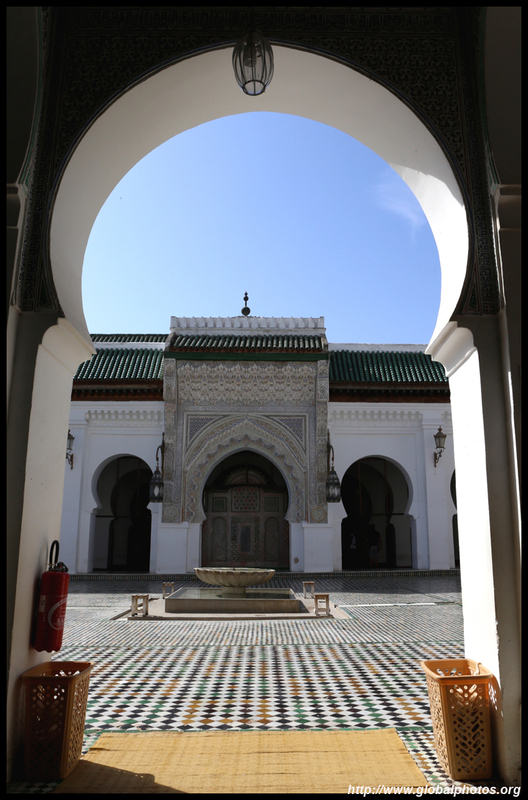 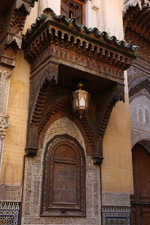 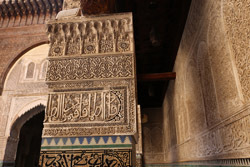 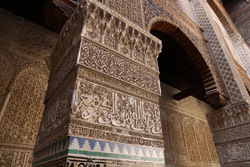 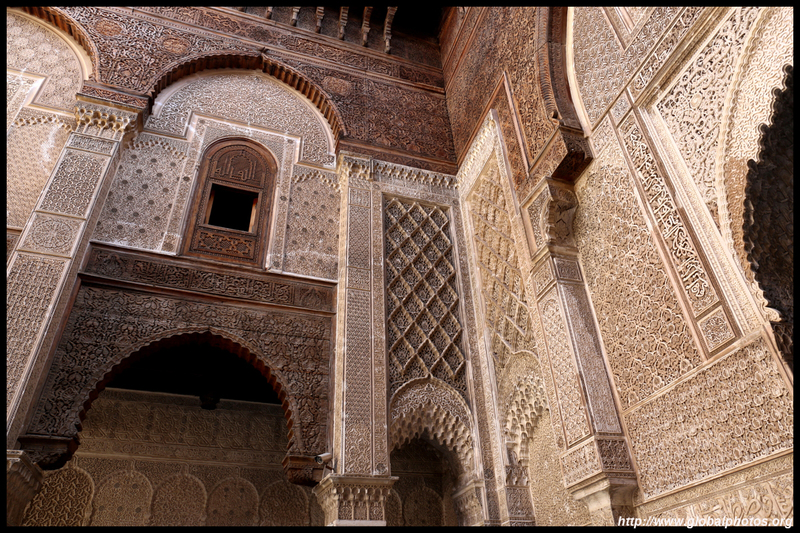 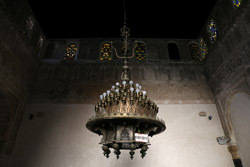 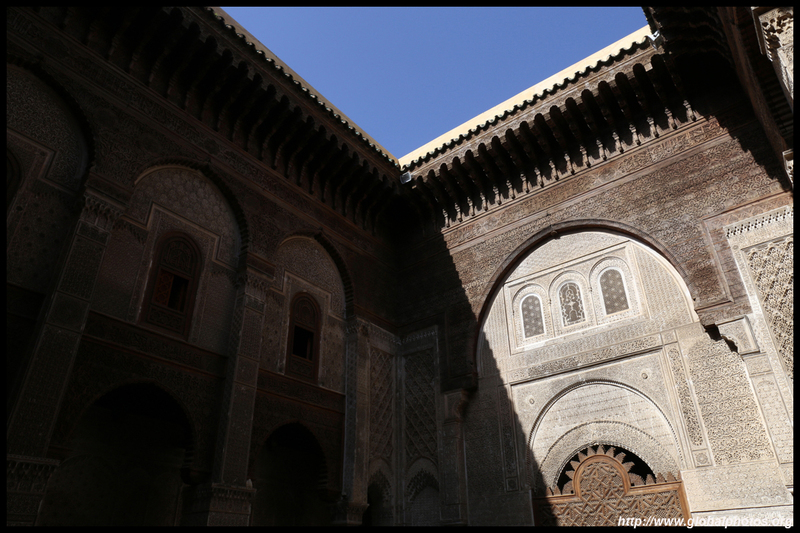 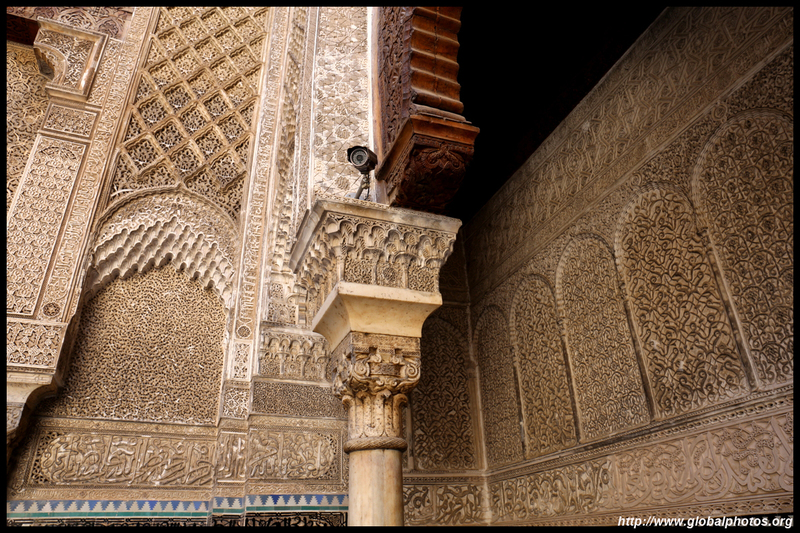 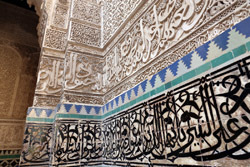 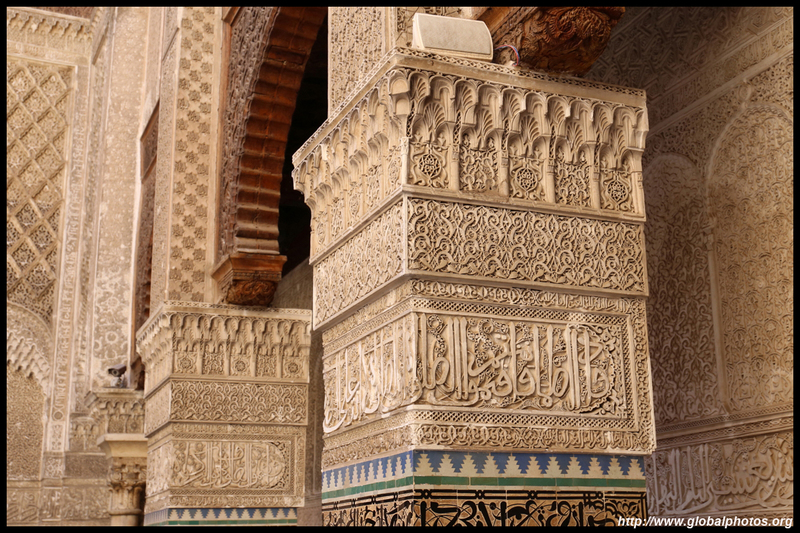 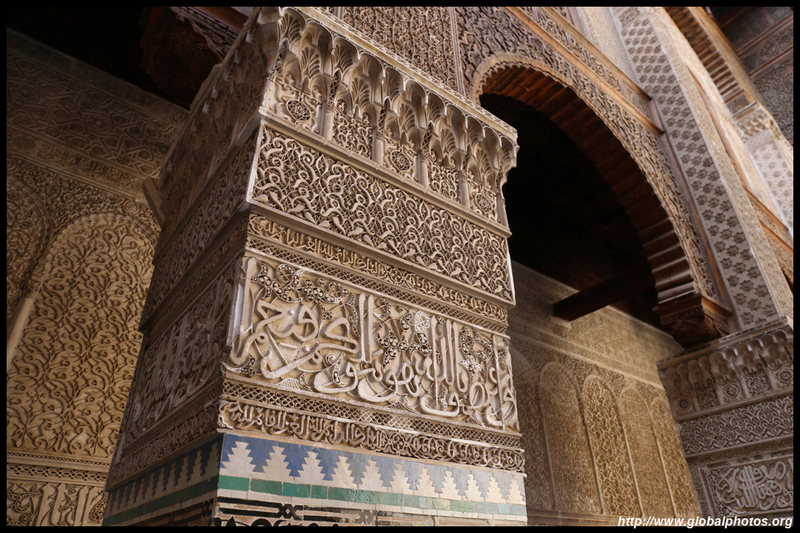 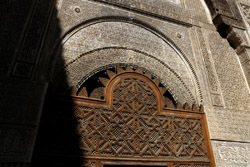 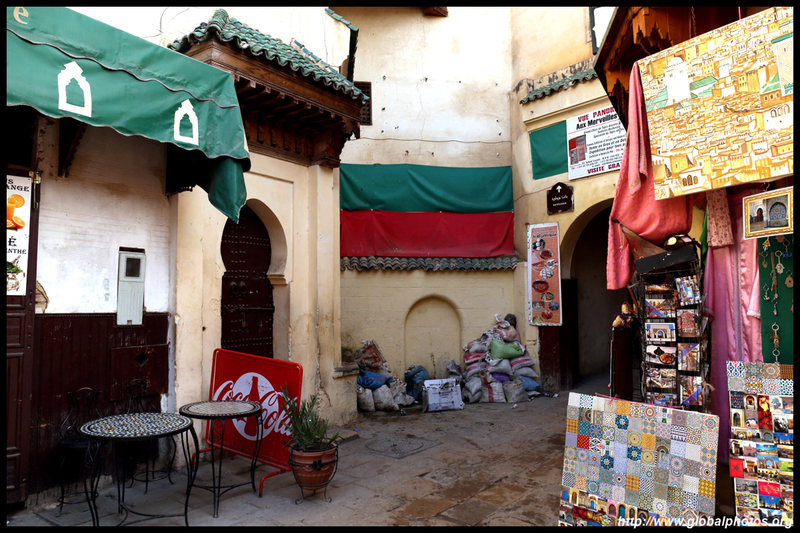 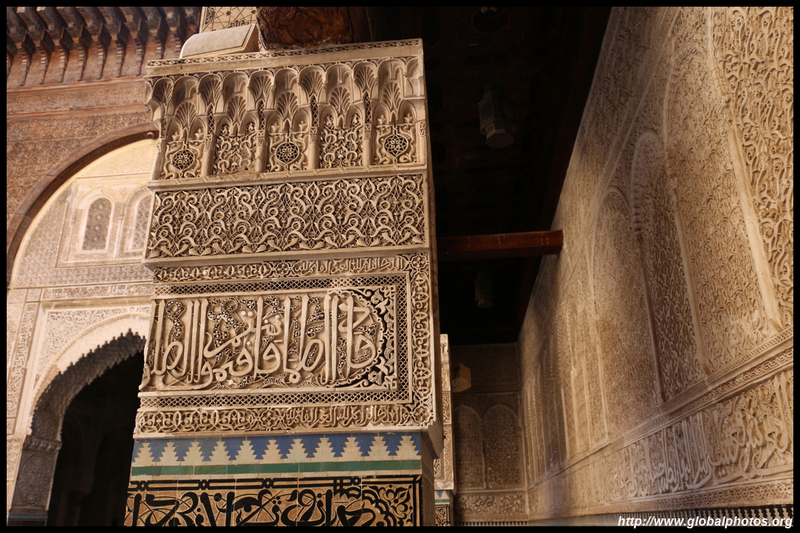 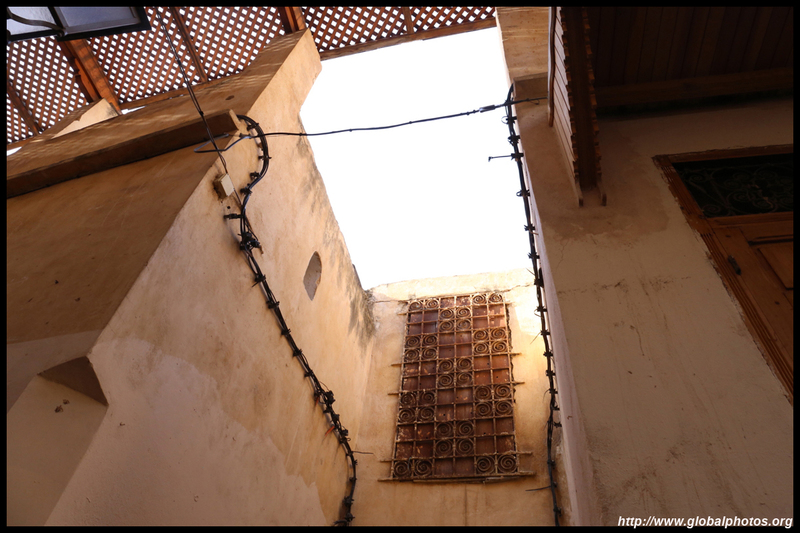 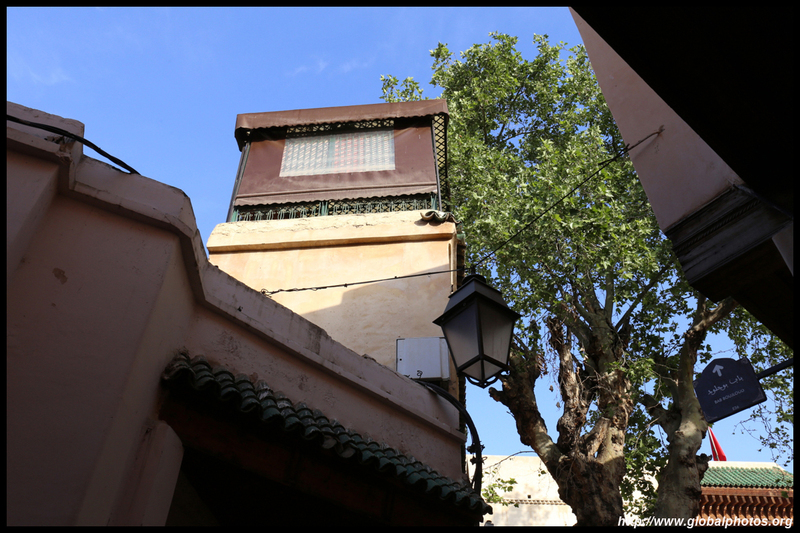 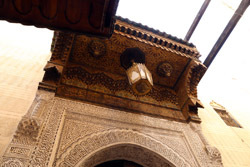 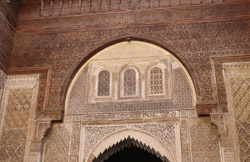 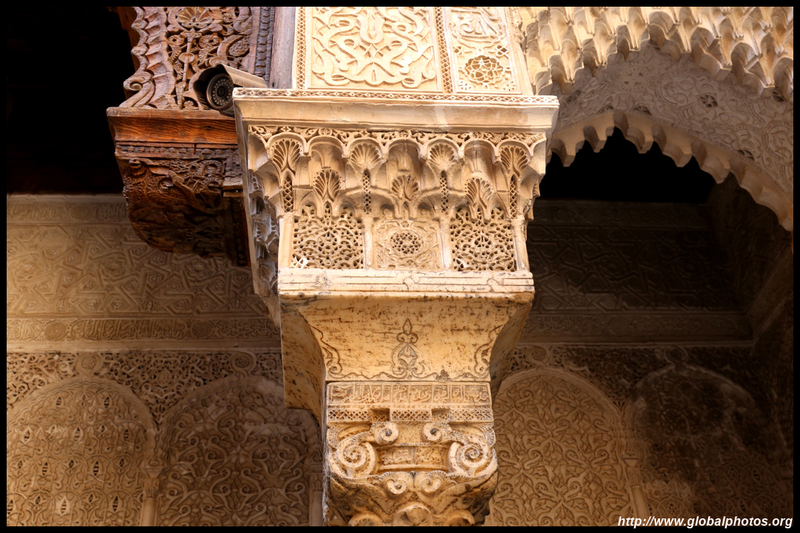 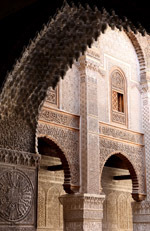 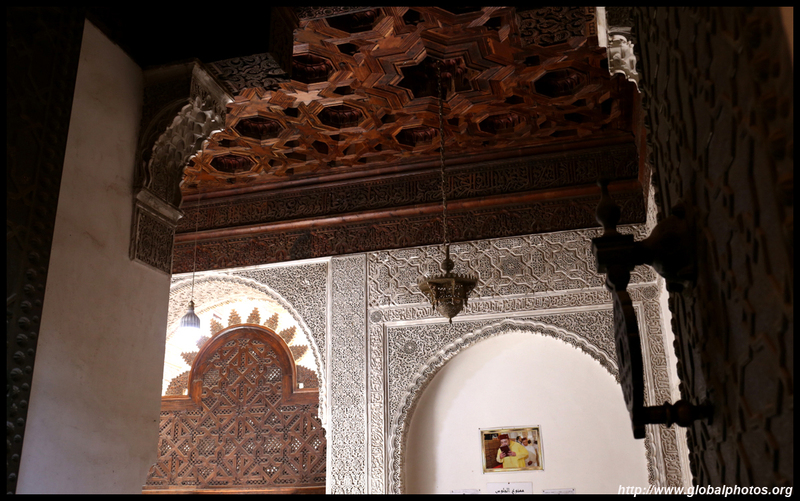 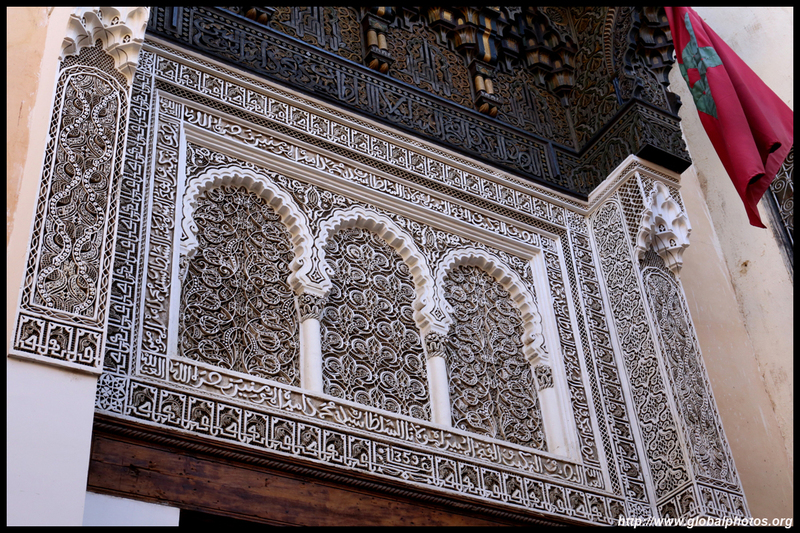 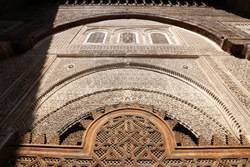 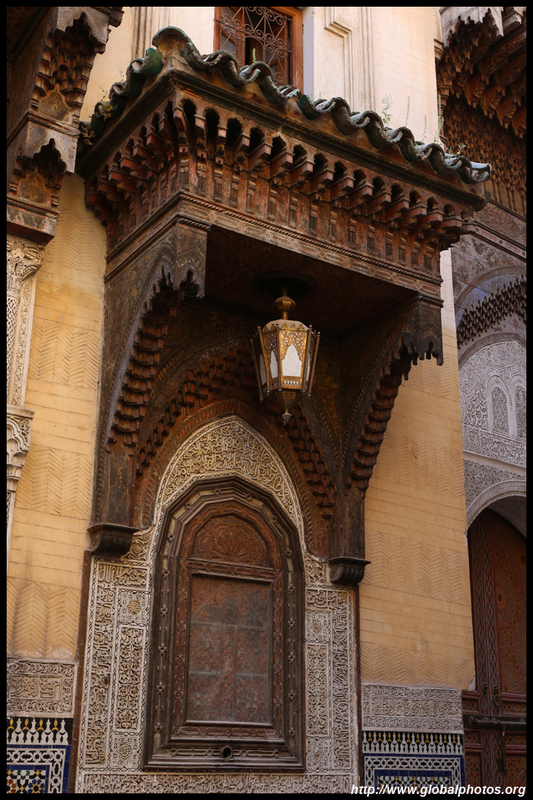 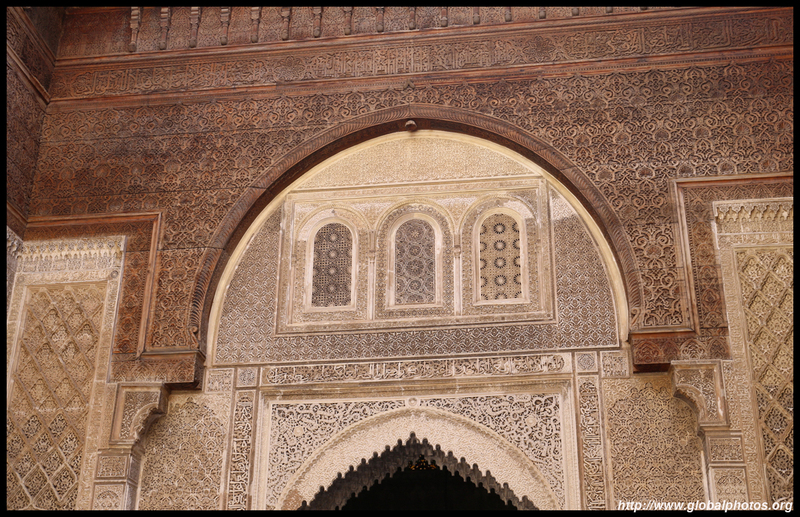 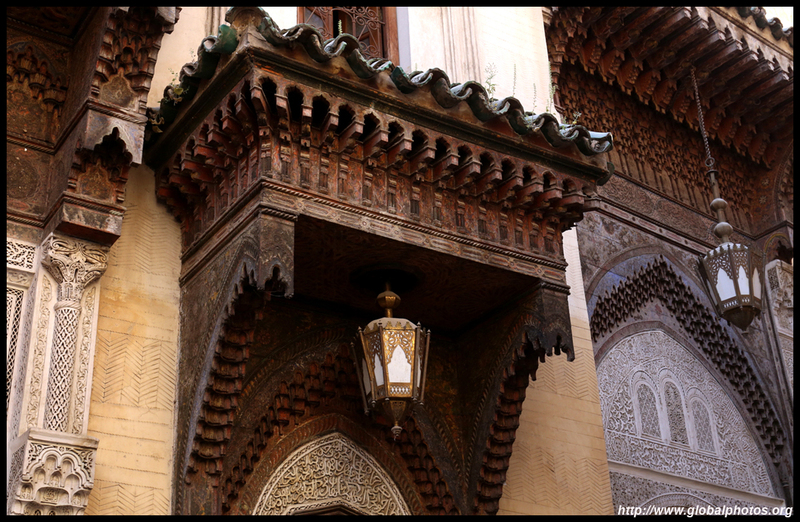 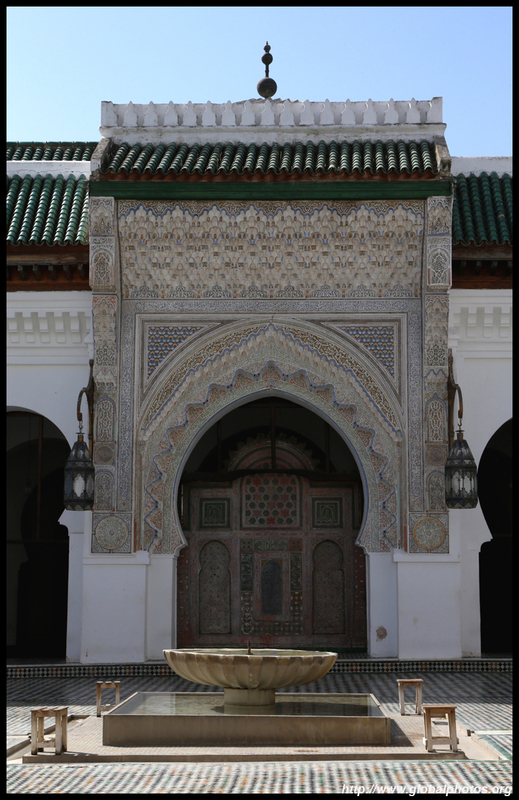 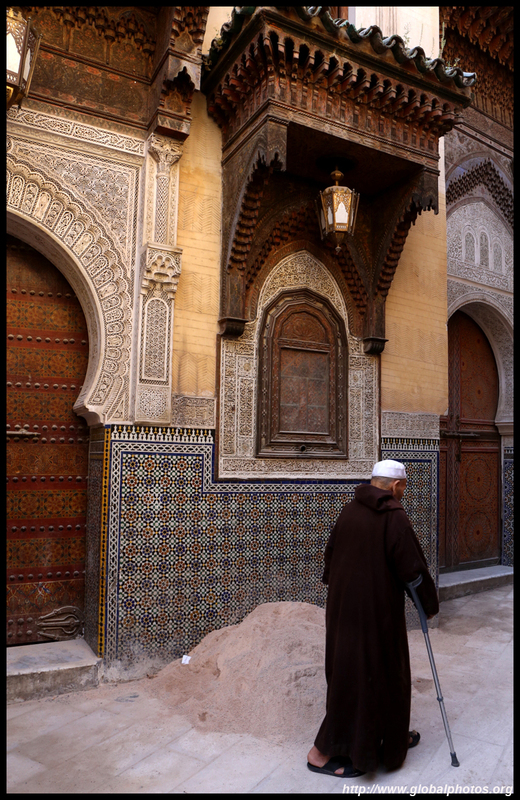 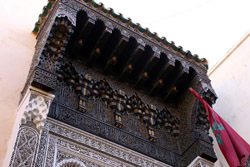 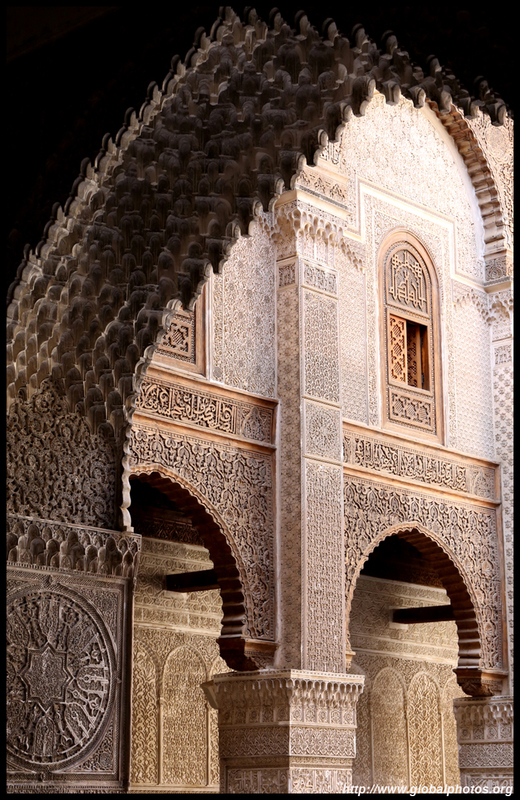 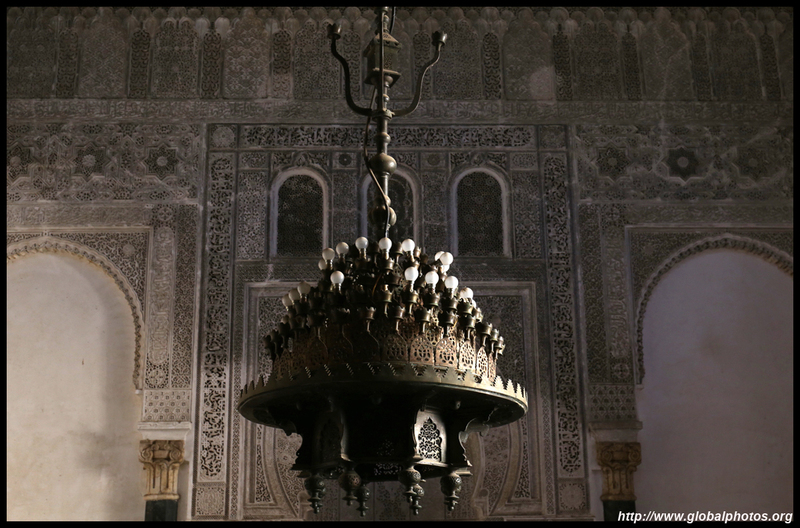 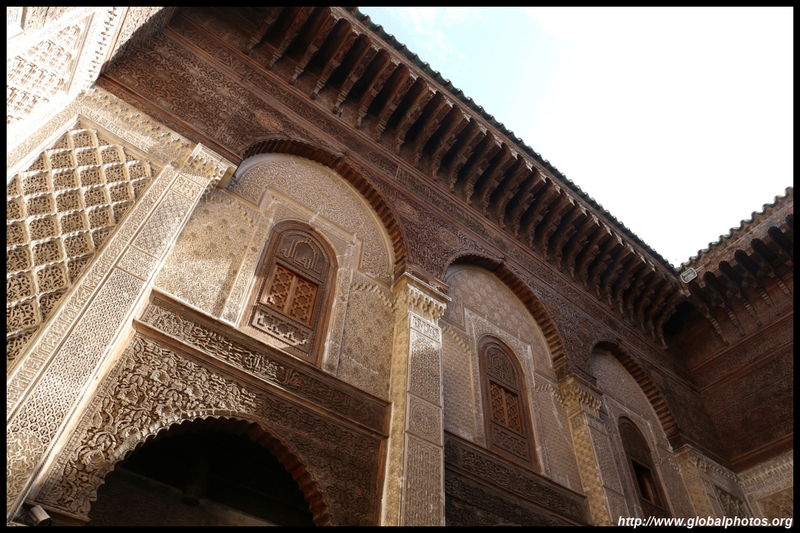 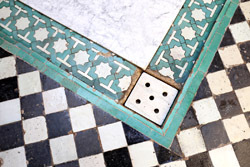 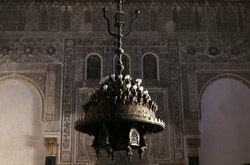 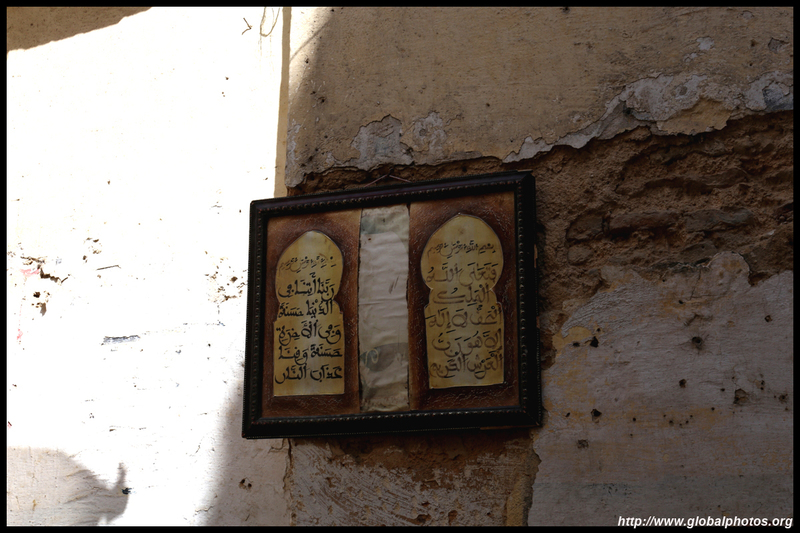 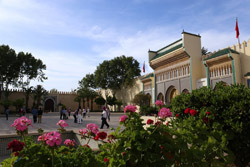 Established in the 9th century, Karaouiyine Mosque is also one of the oldest universities in the world. 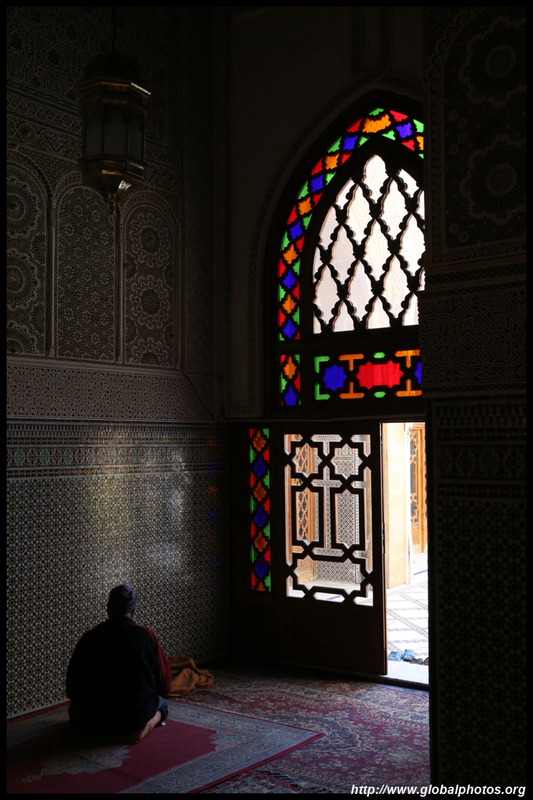 Unfortunately, non-Muslims are not allowed to enter, so I had to peek through the door for a view of the spacious interior. 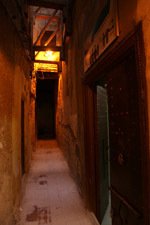 Meanwhile, there are plenty more alleys in this maze to explore. 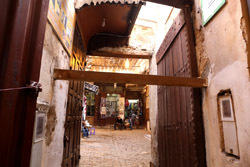 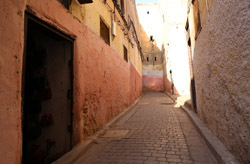 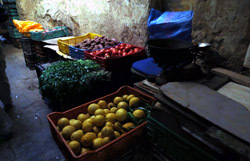 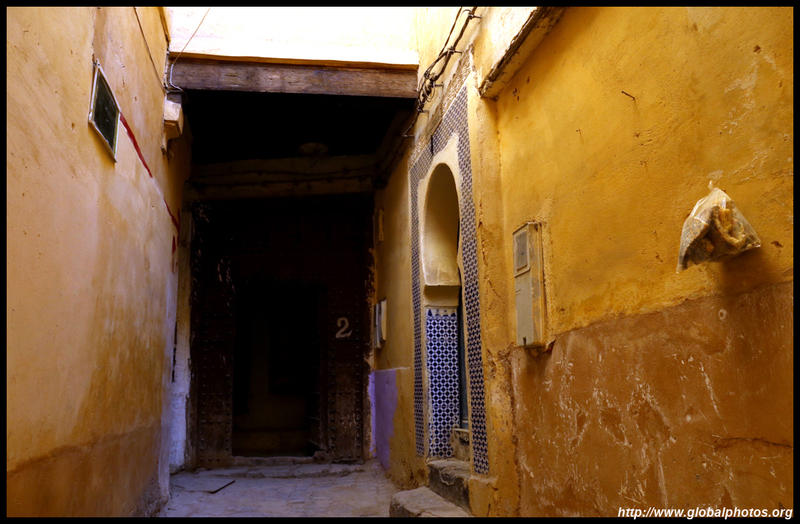 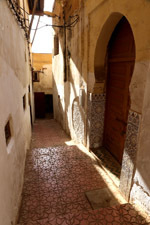 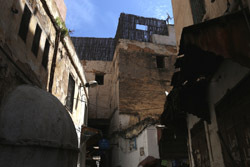 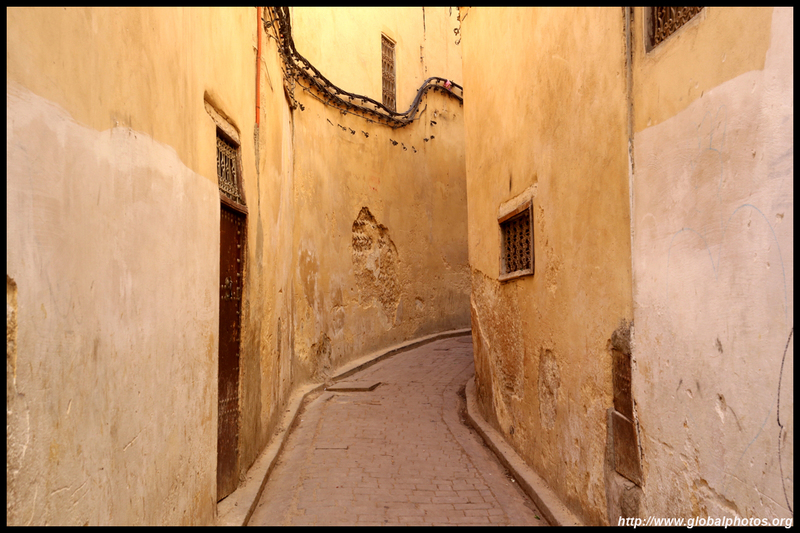 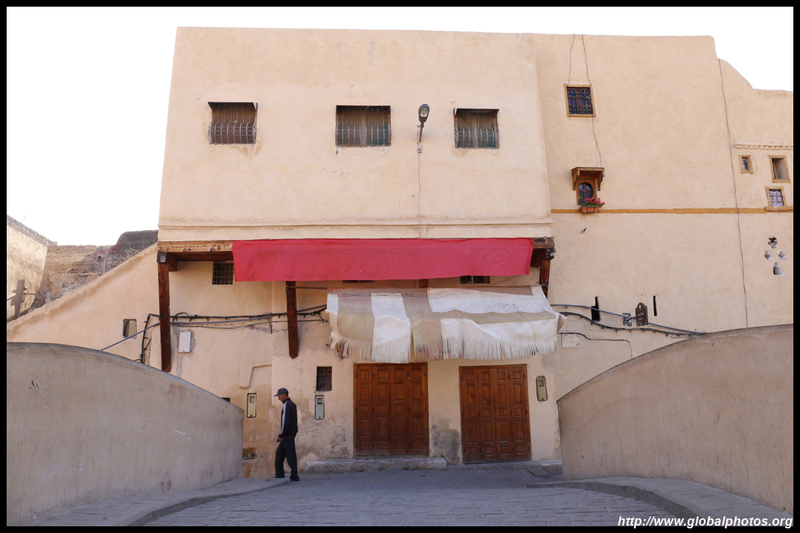 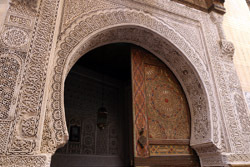 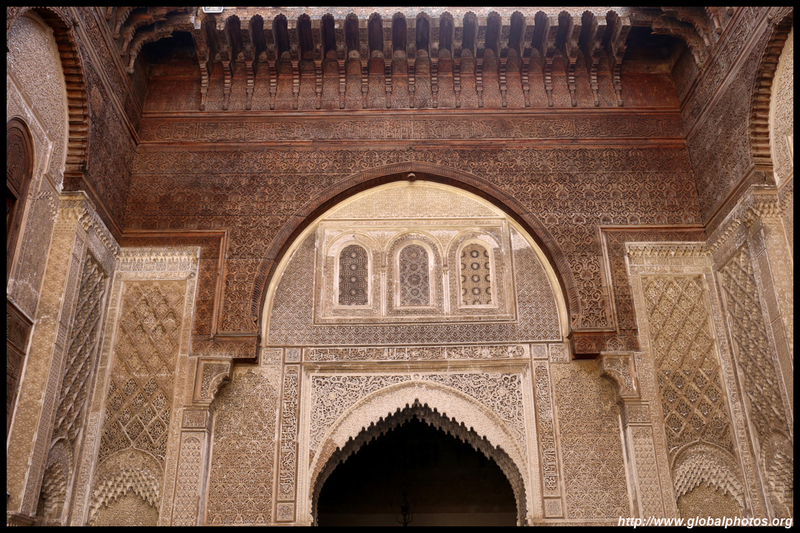 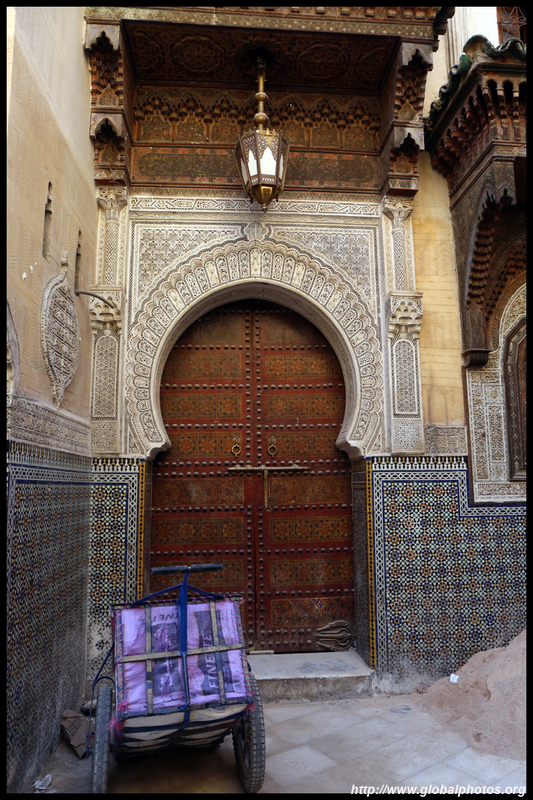 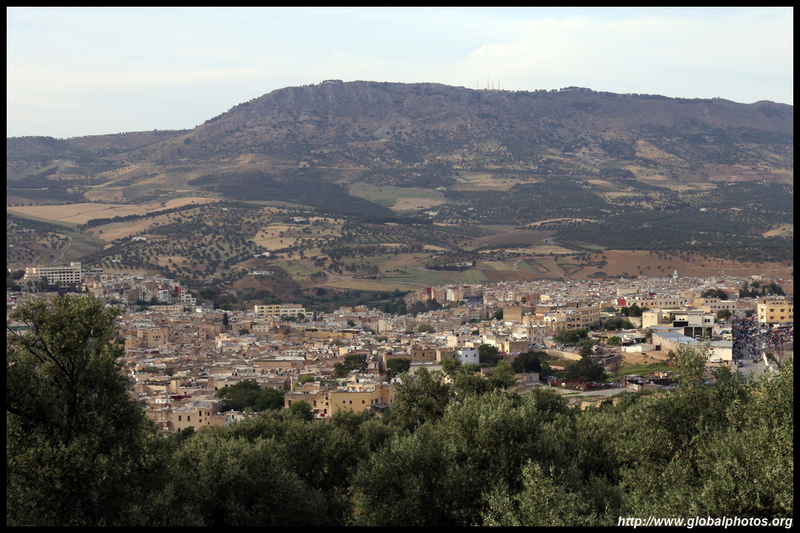 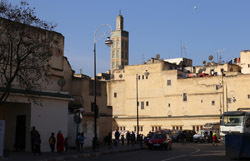 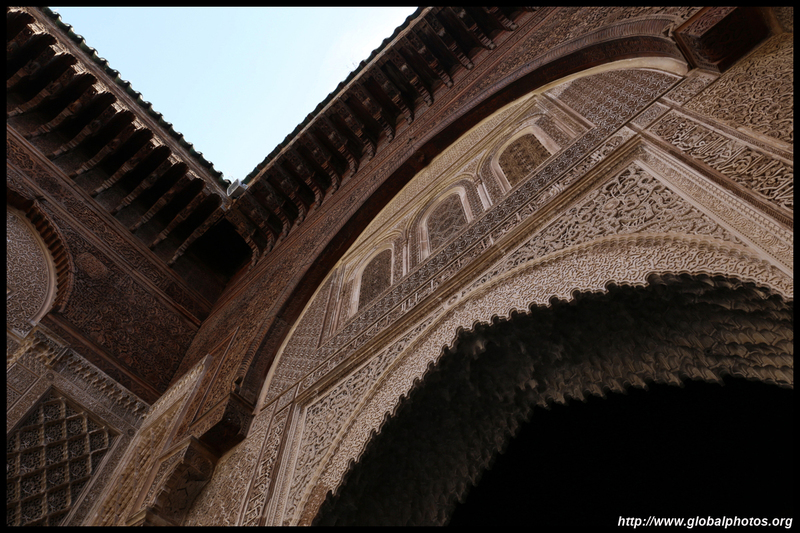 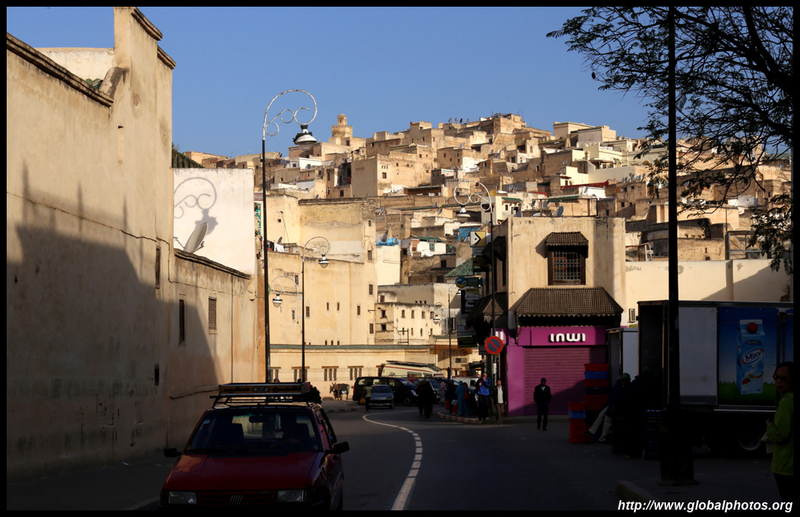 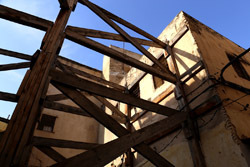 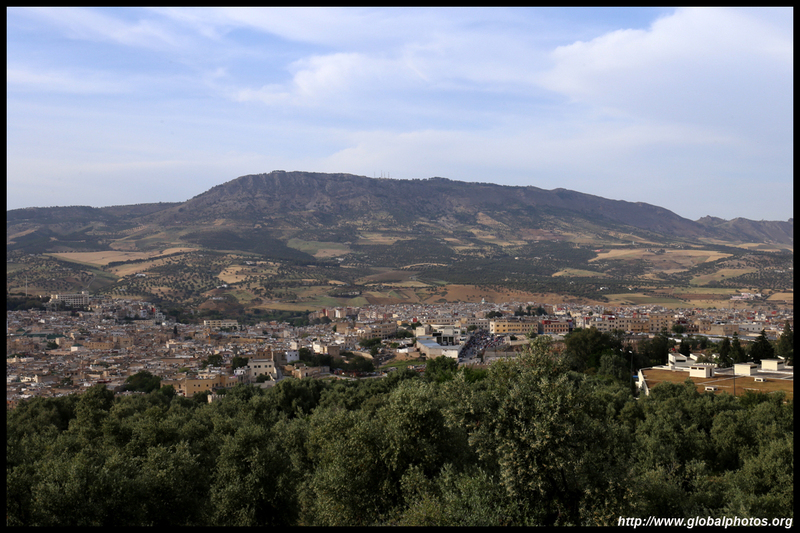 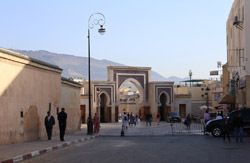 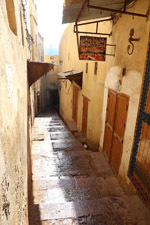 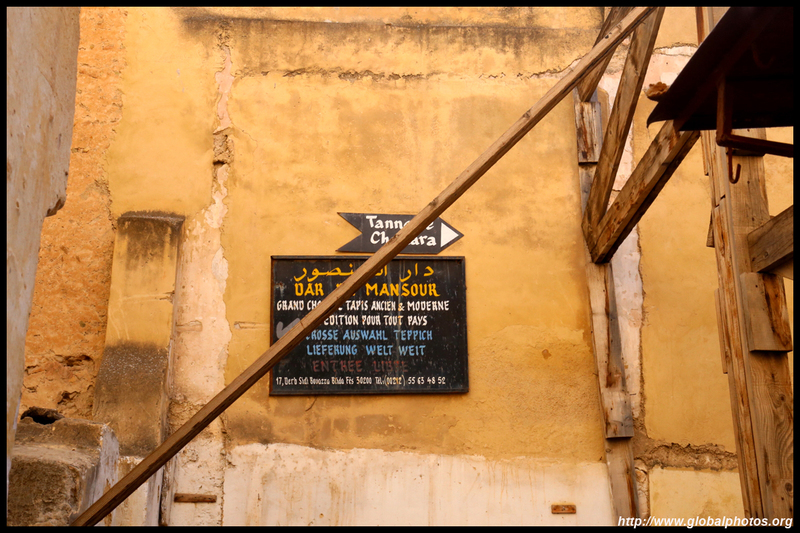 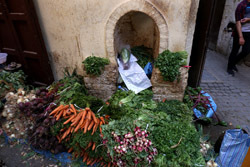 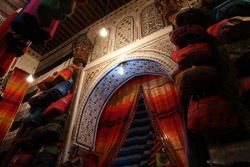 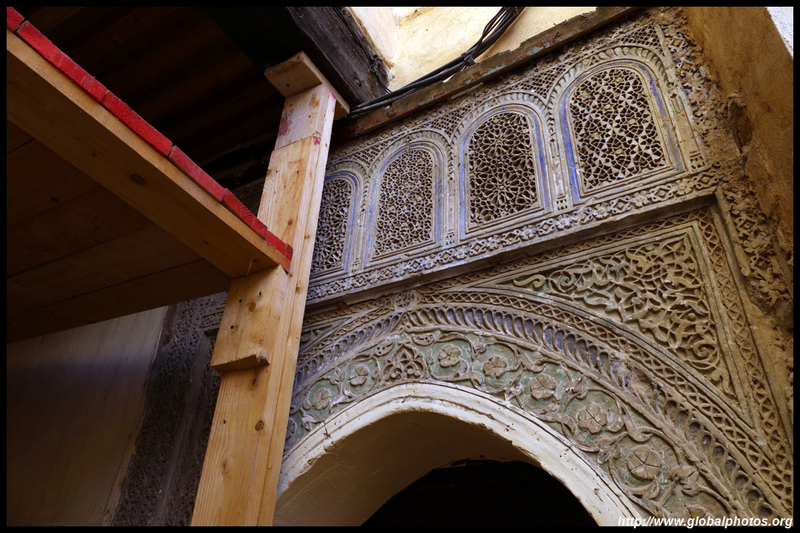 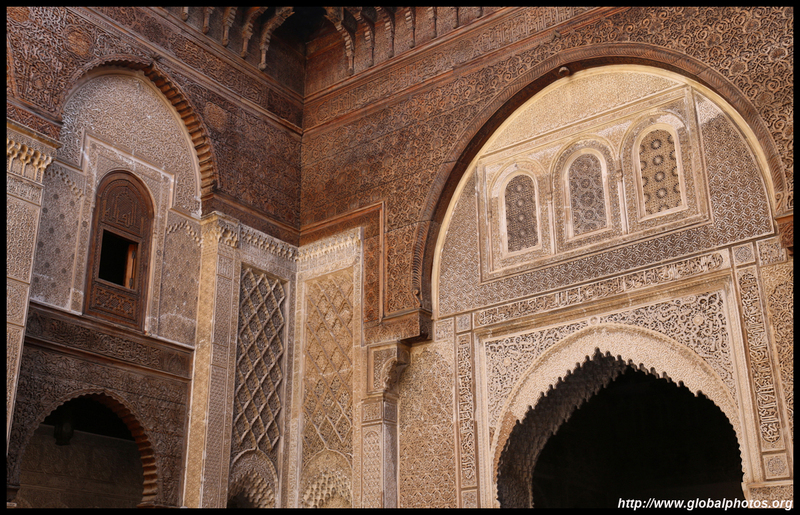 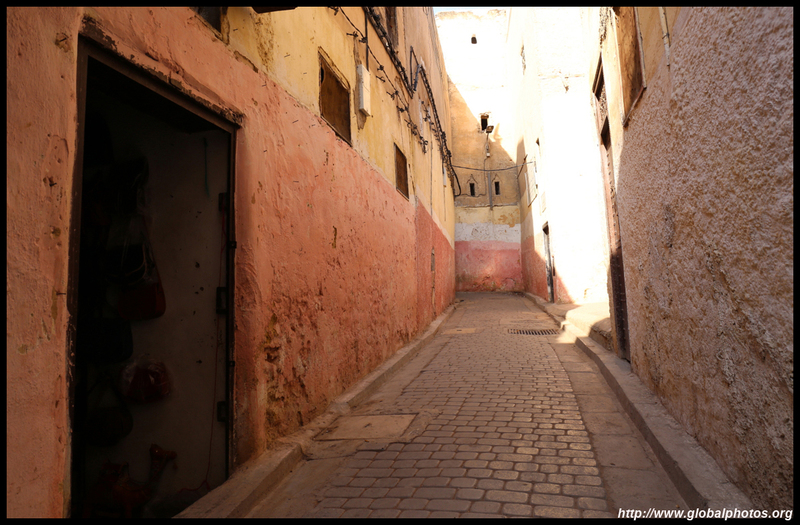 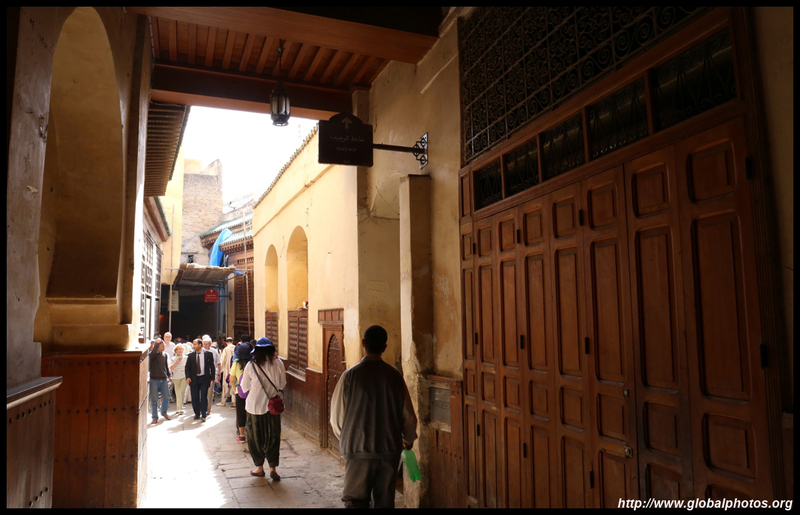 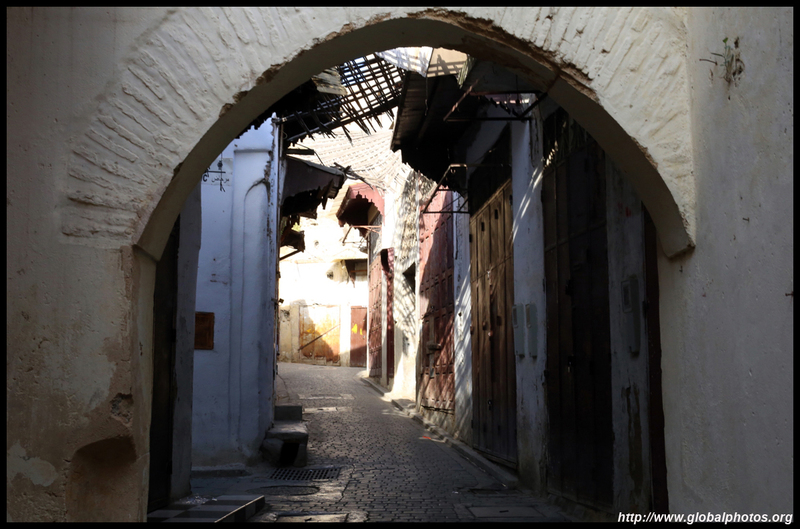 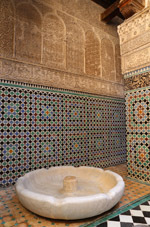 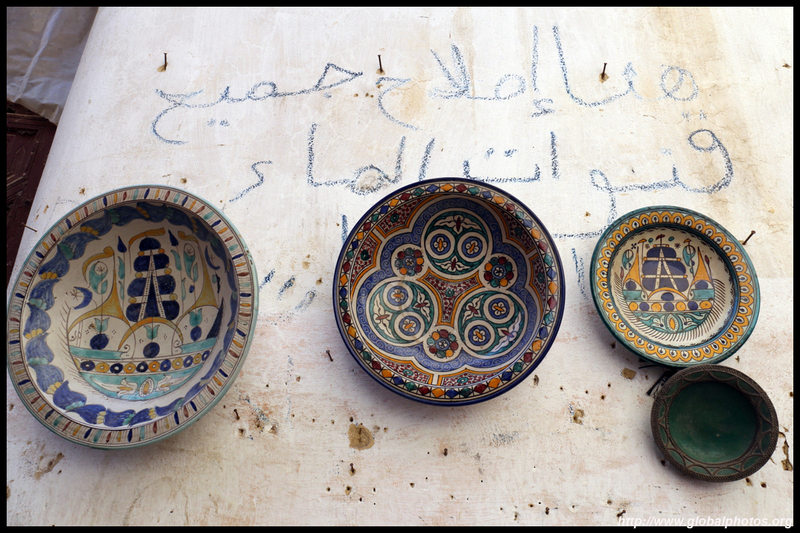 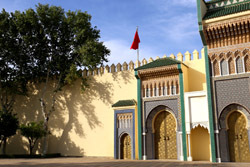 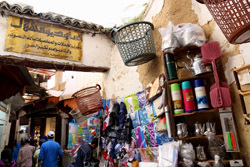 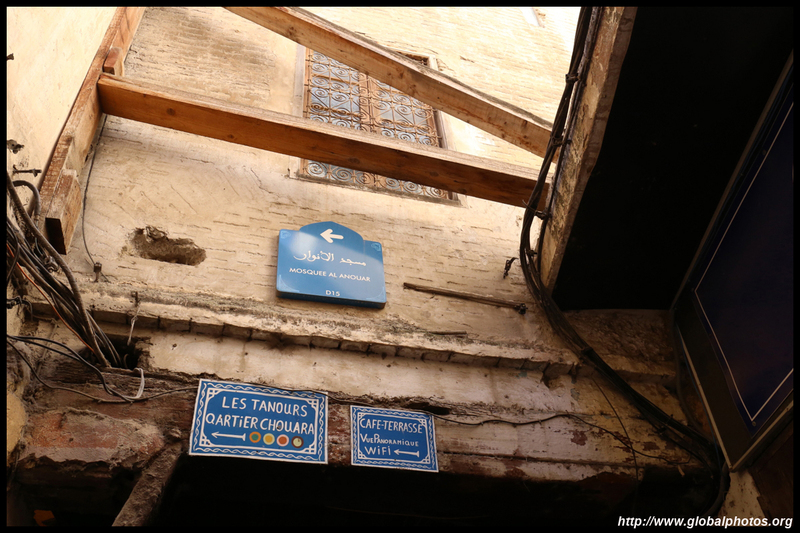 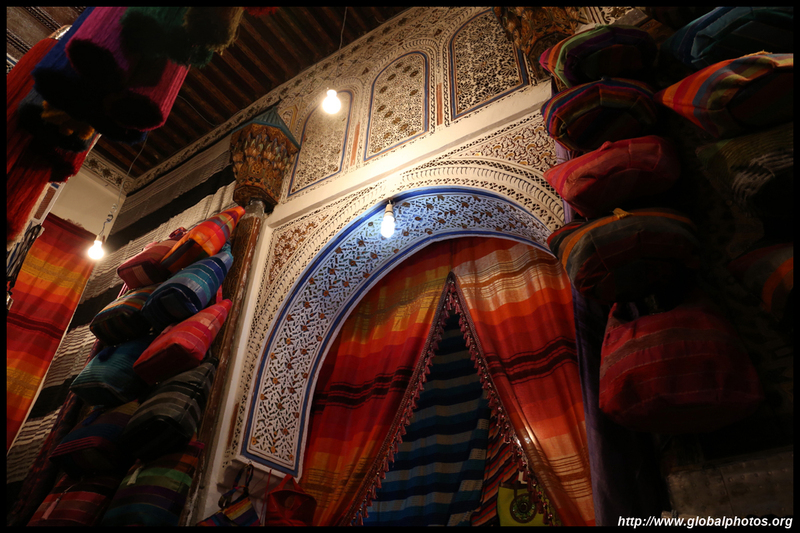 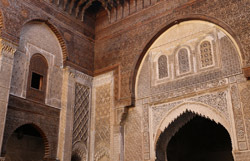 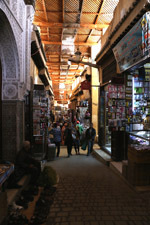 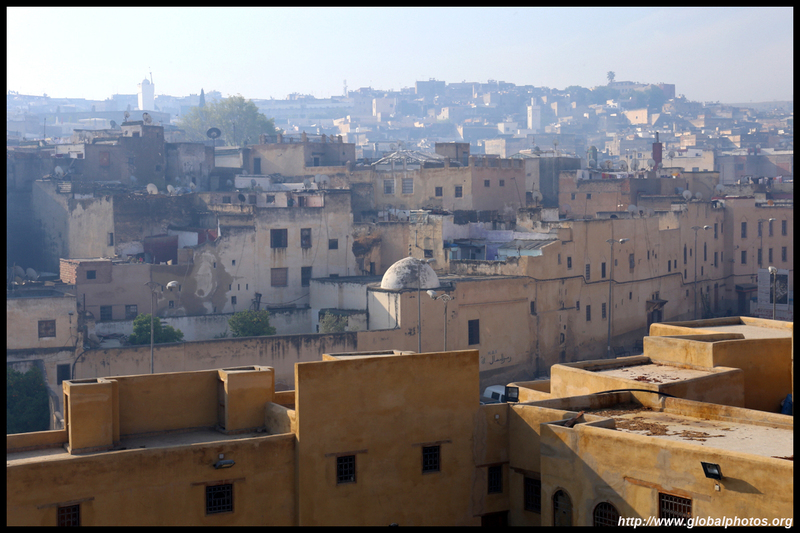 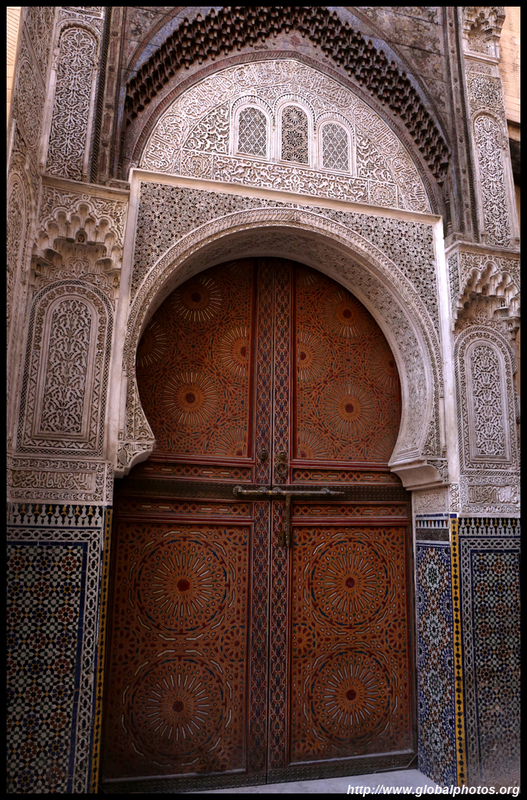 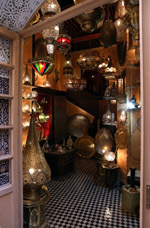 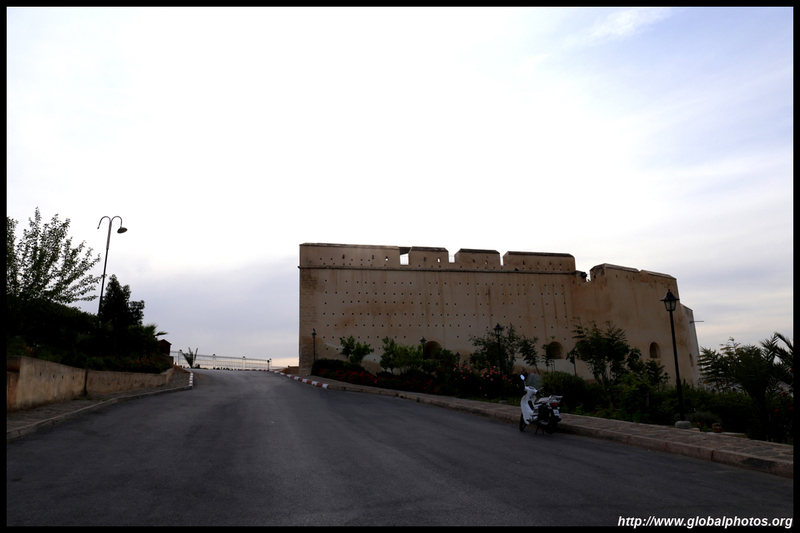 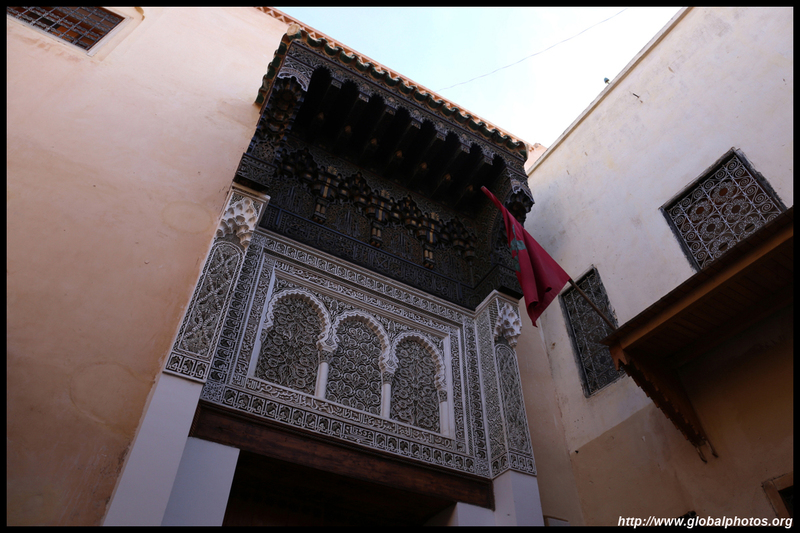 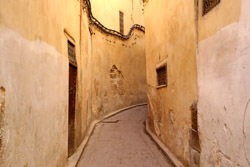 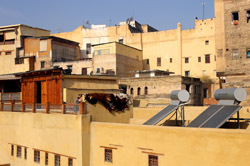 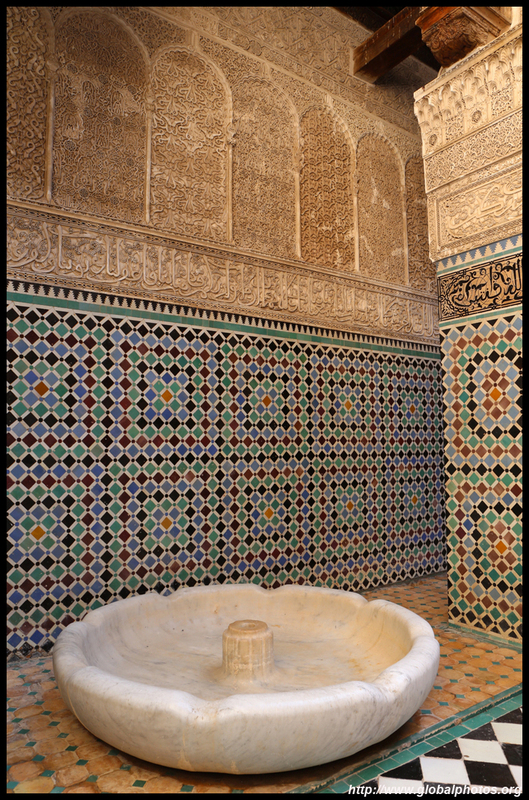 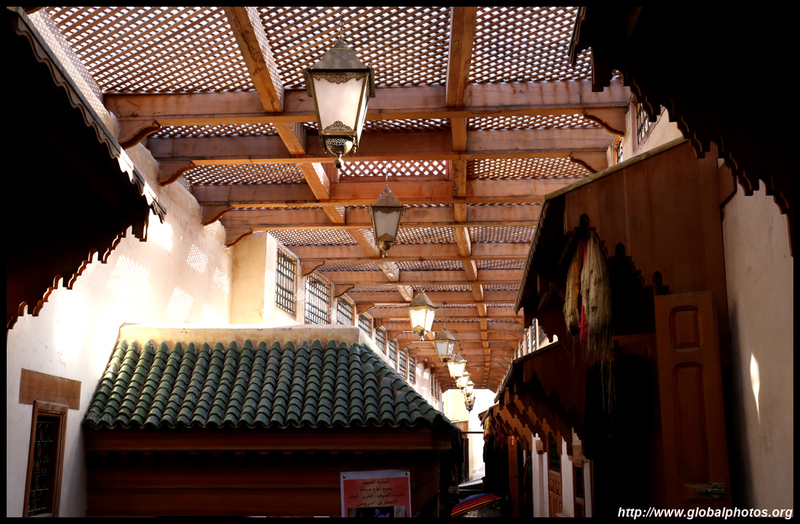 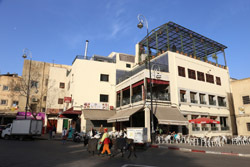 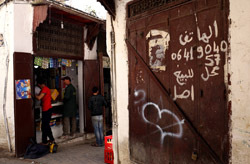 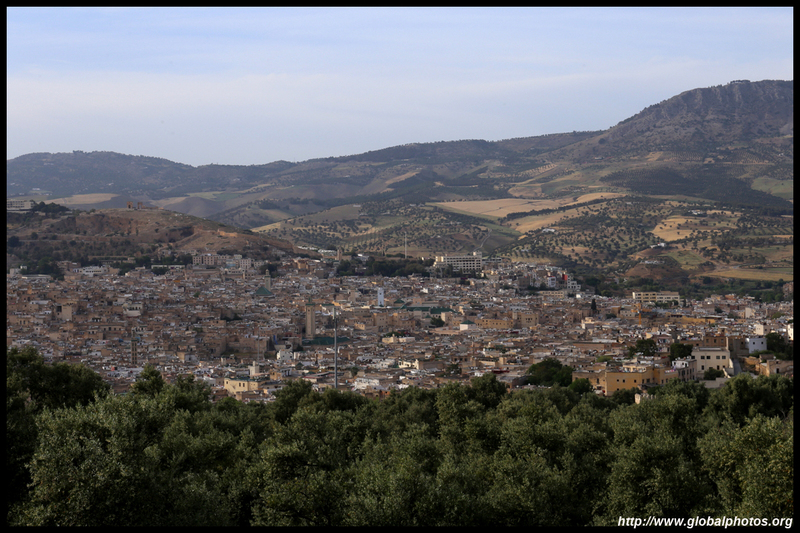 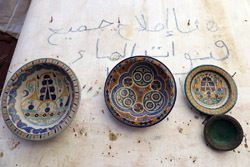 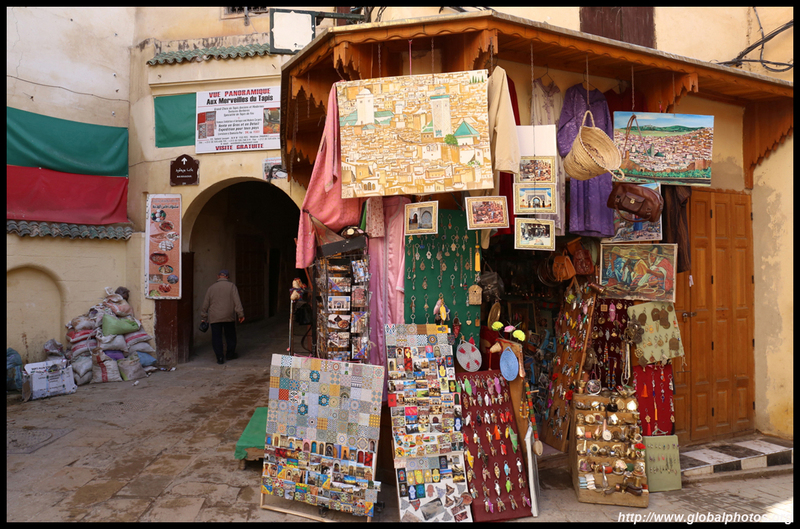 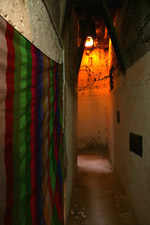 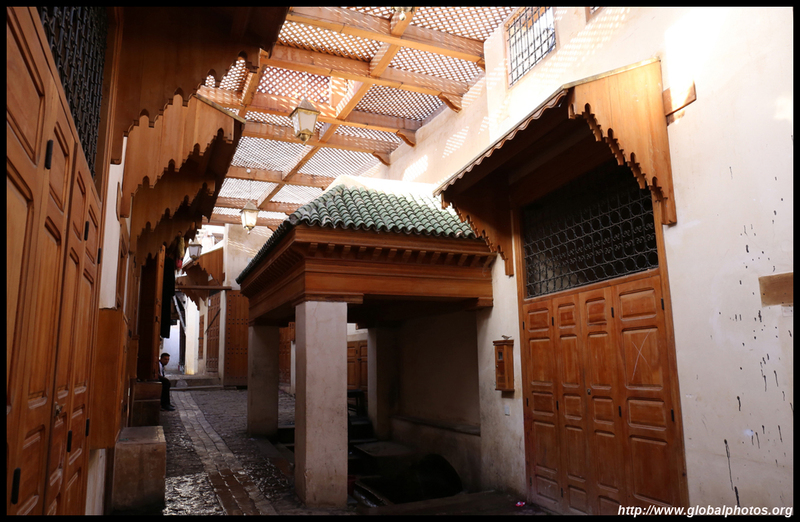 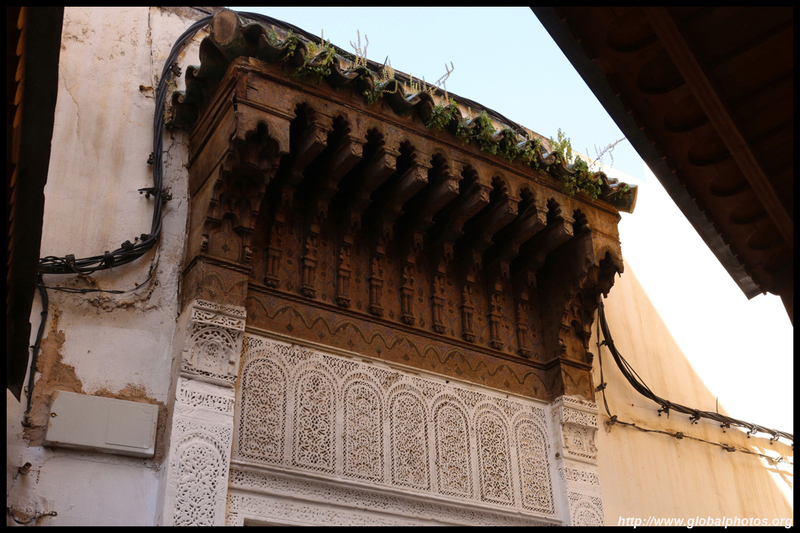 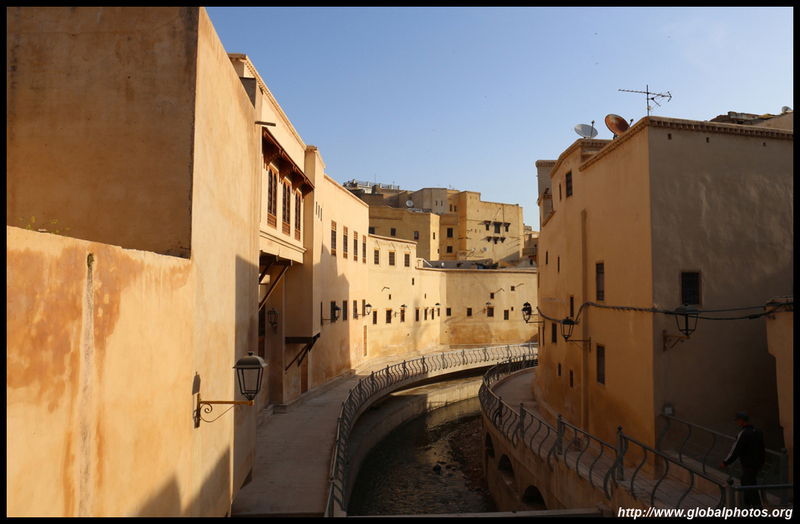 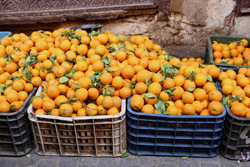 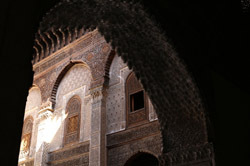 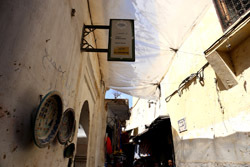 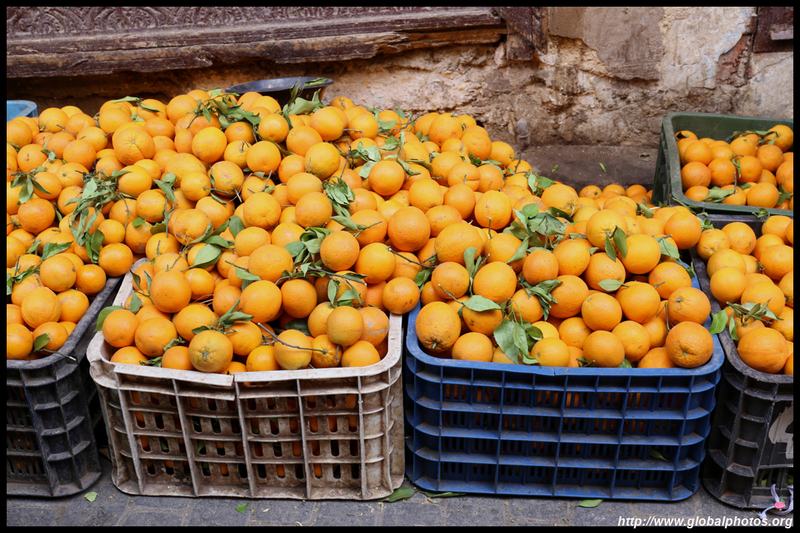 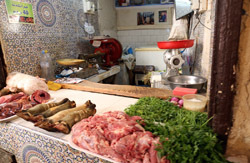 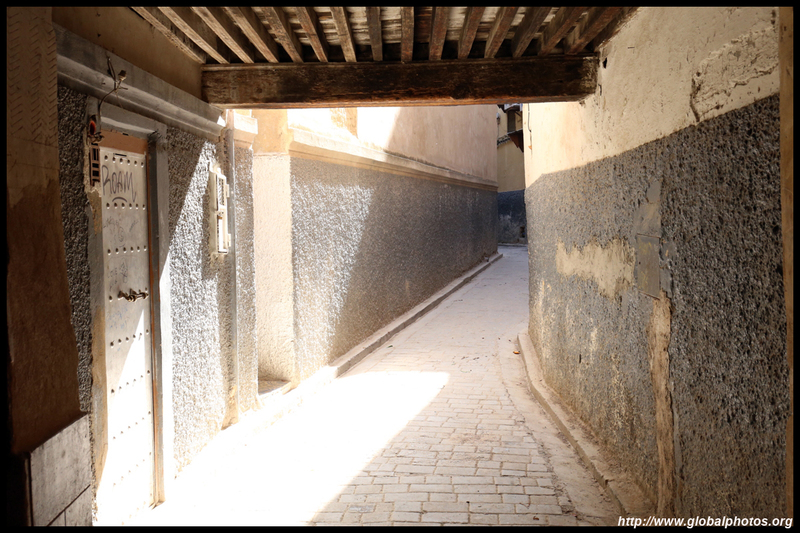 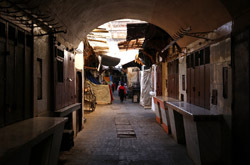 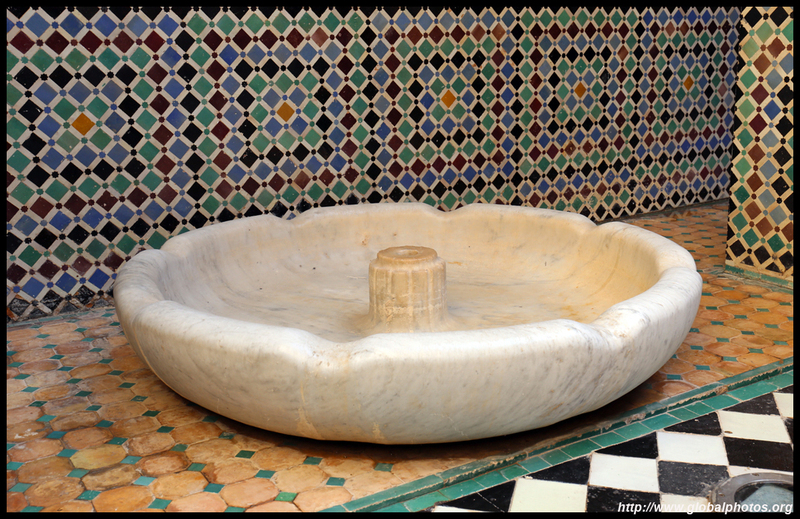 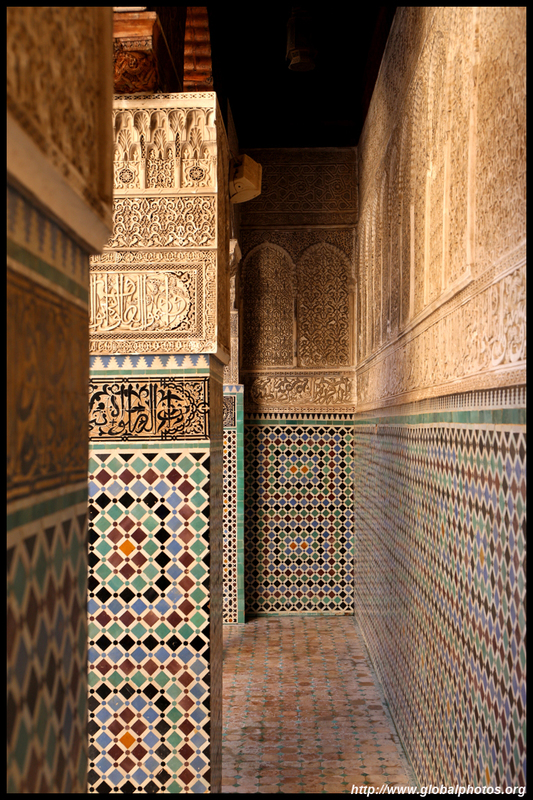 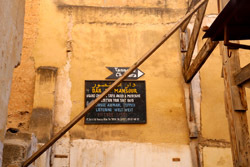 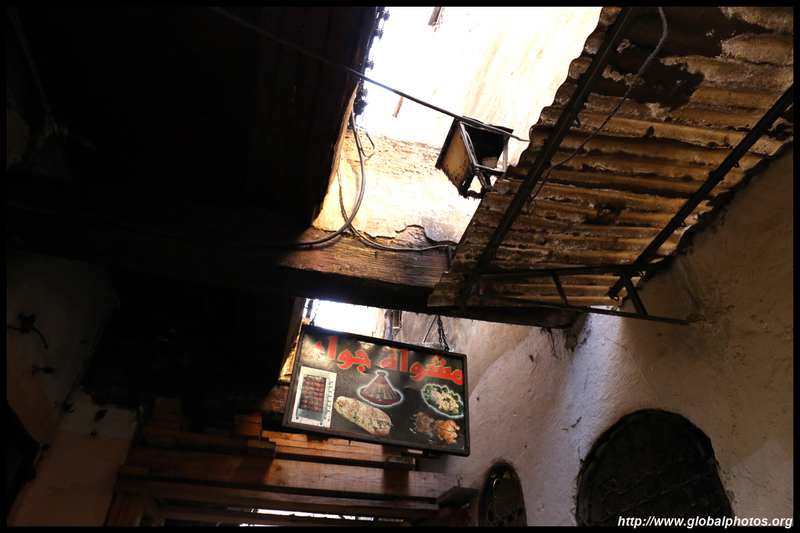 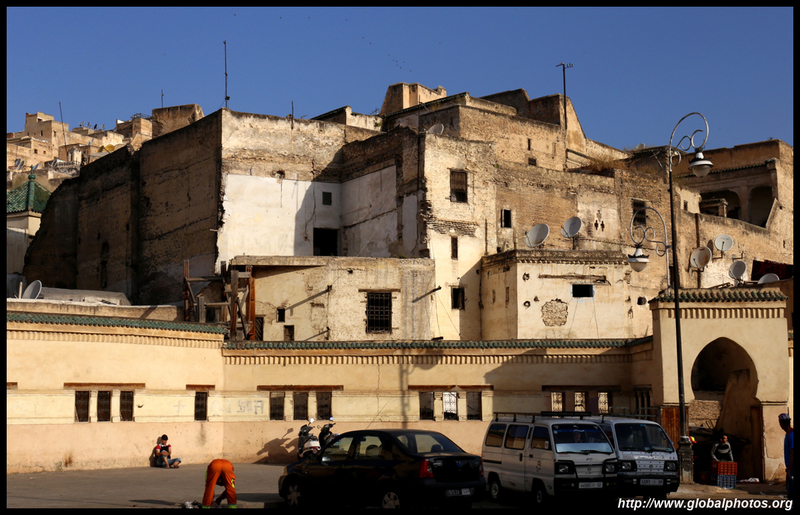 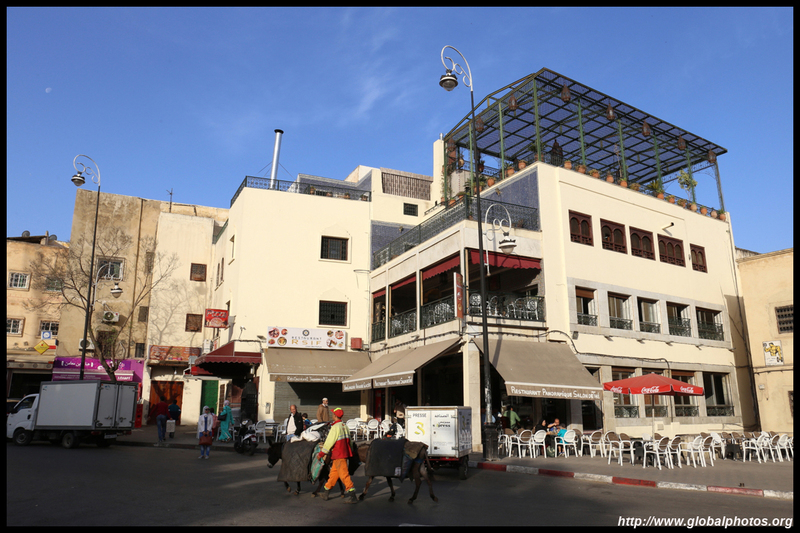 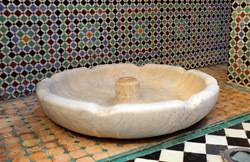 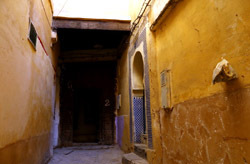 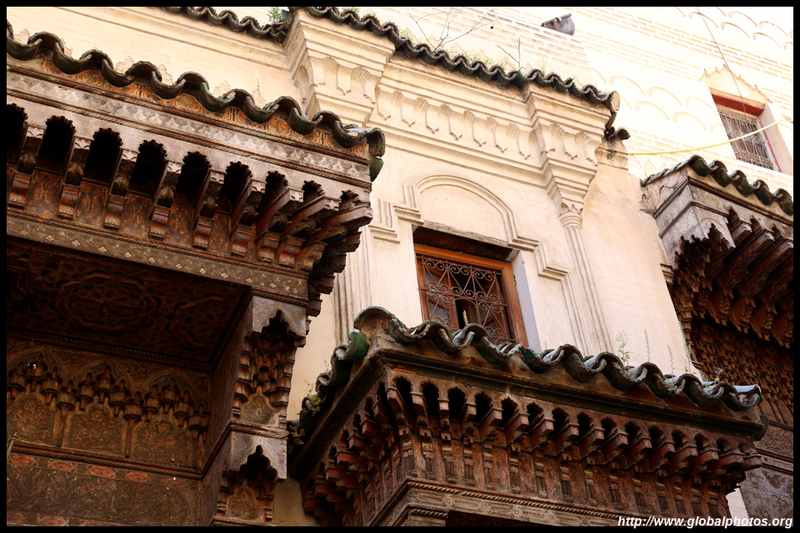 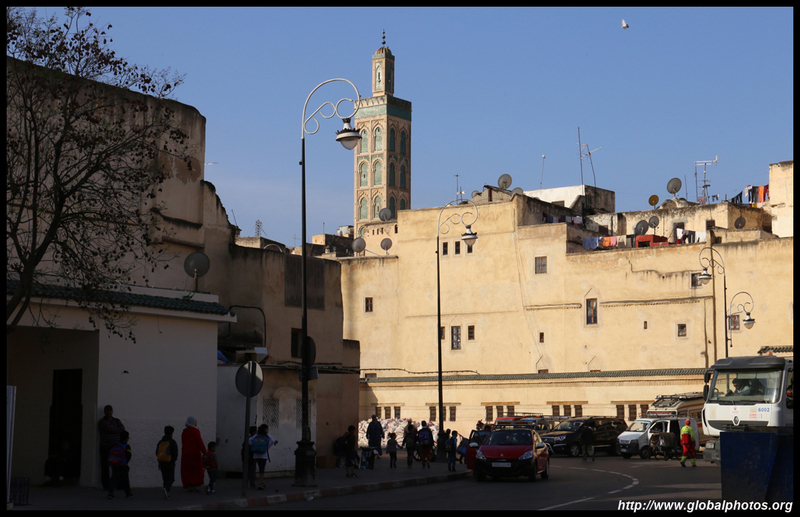 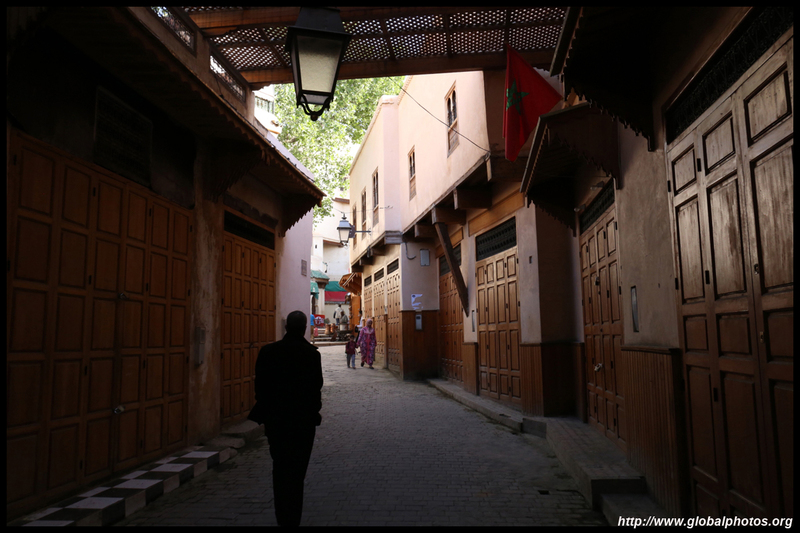 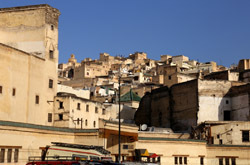 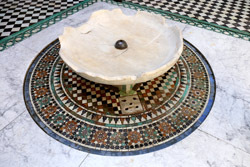 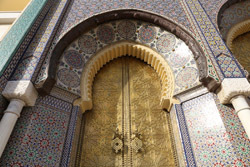 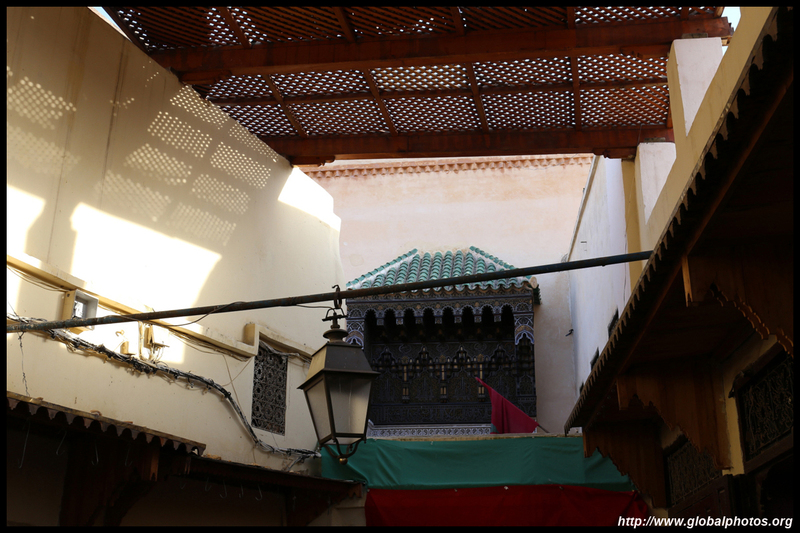 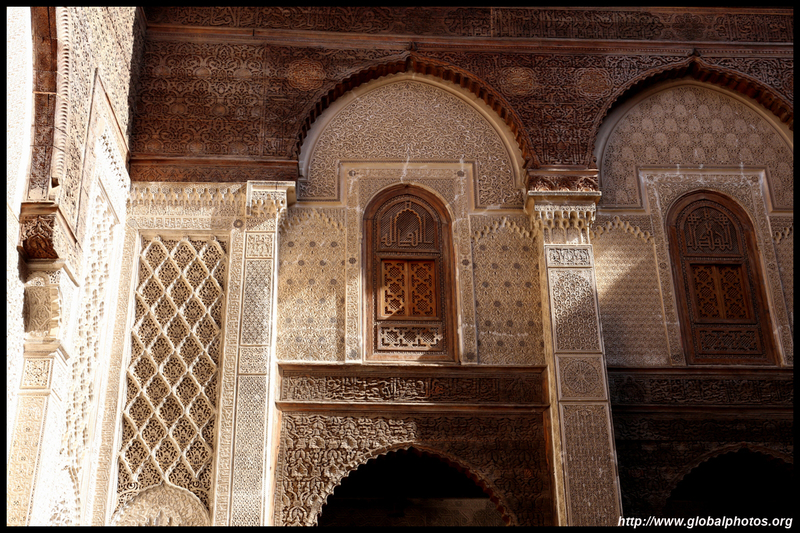 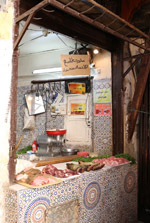 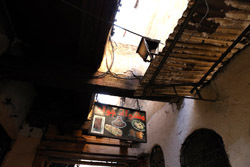 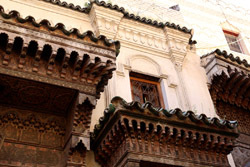 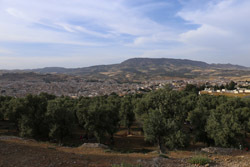 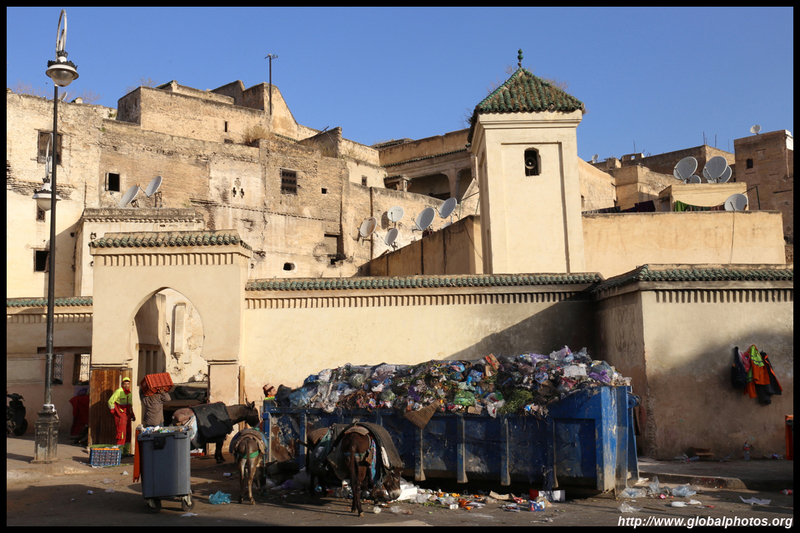 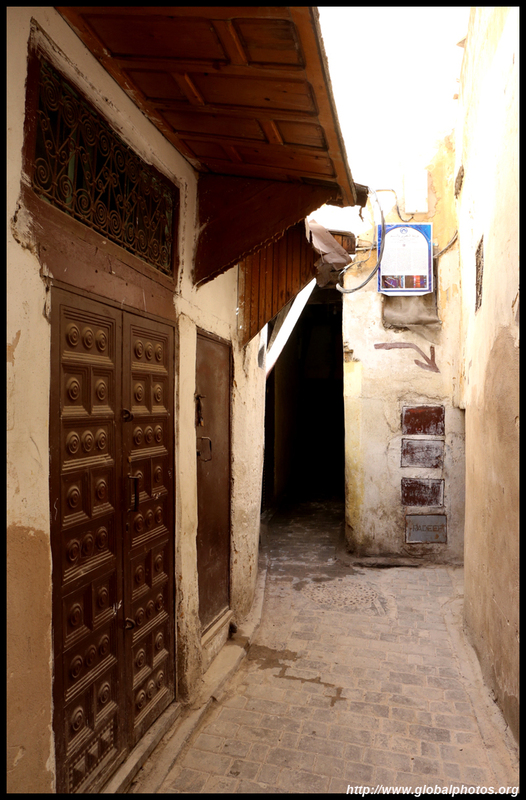 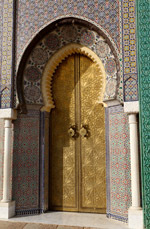 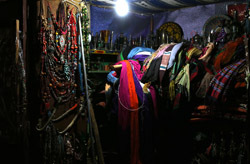 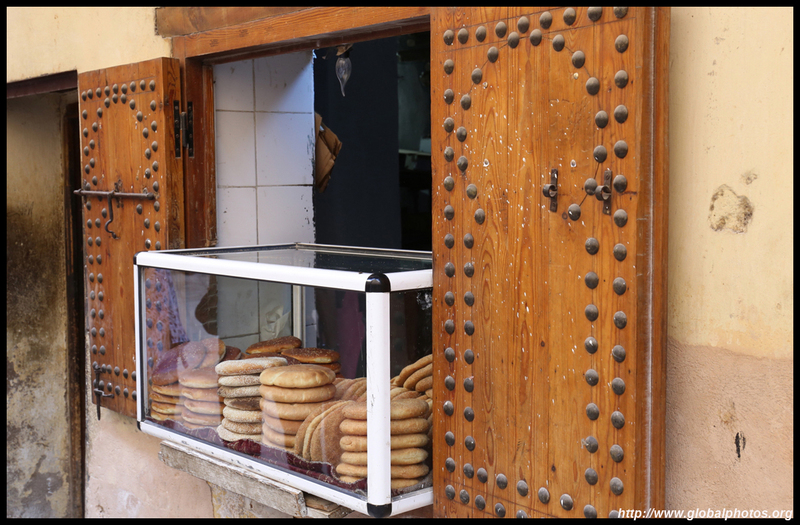 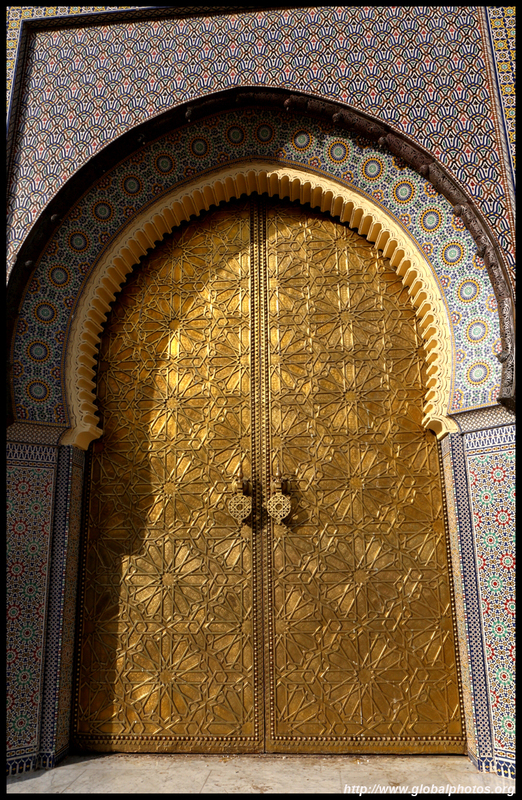 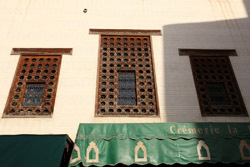 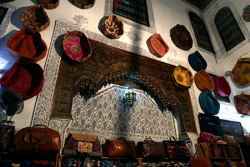 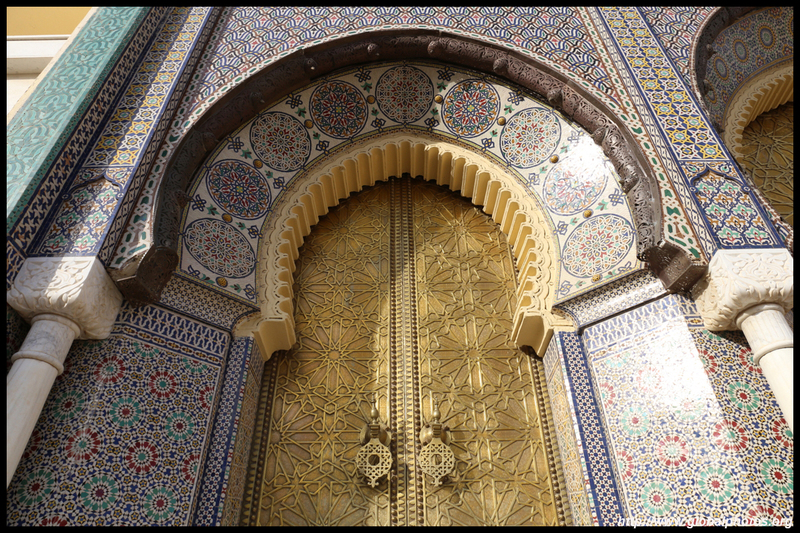 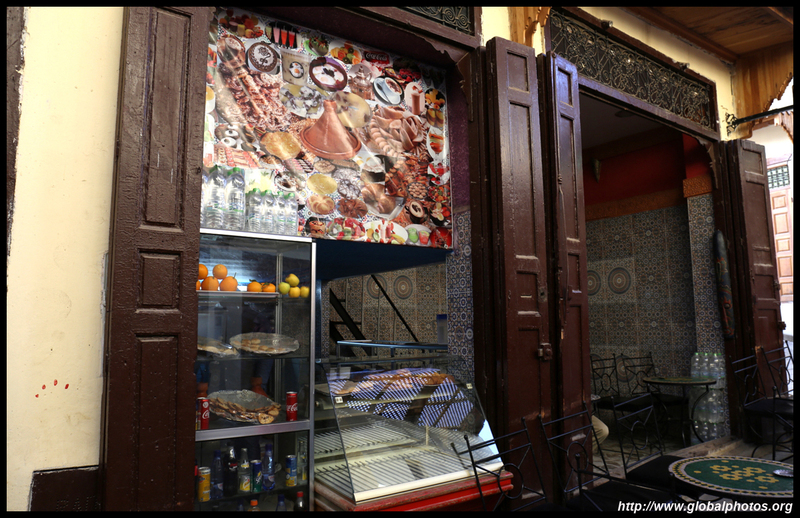 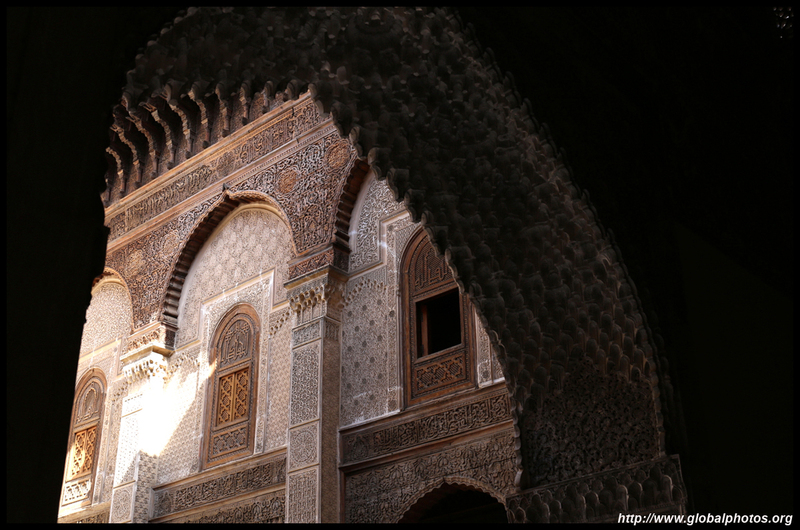 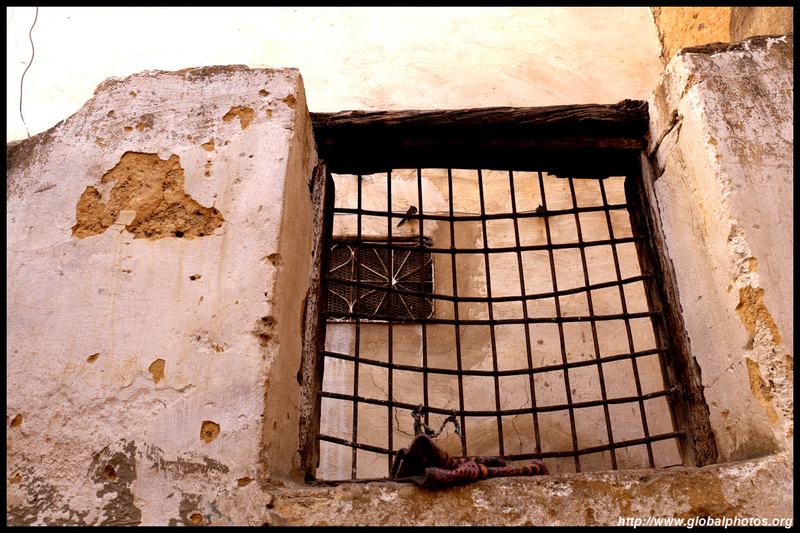 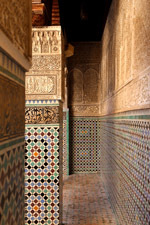 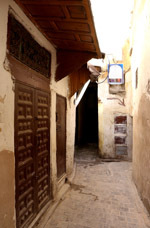 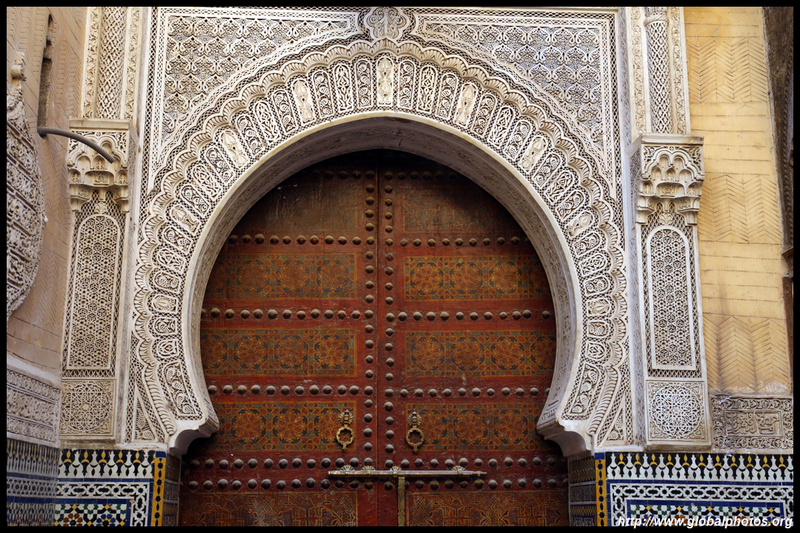 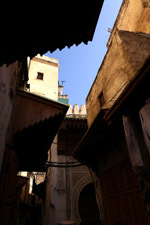 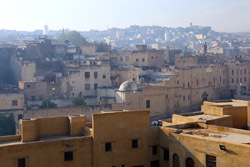 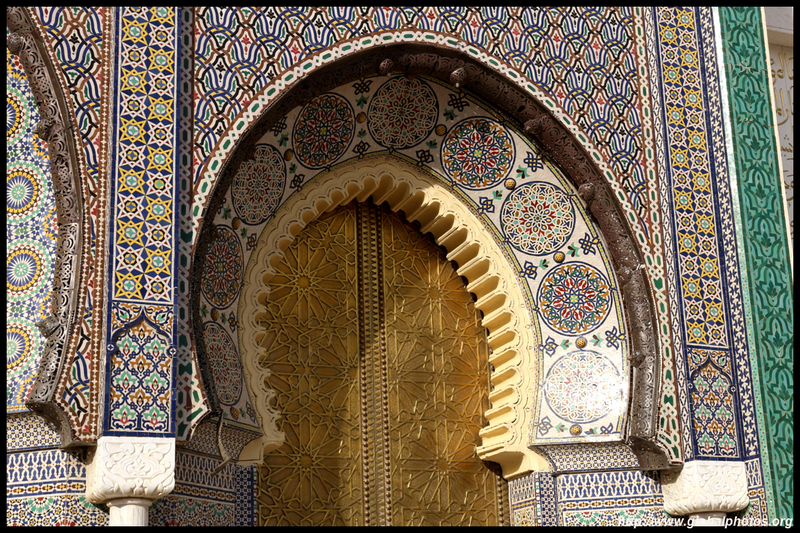 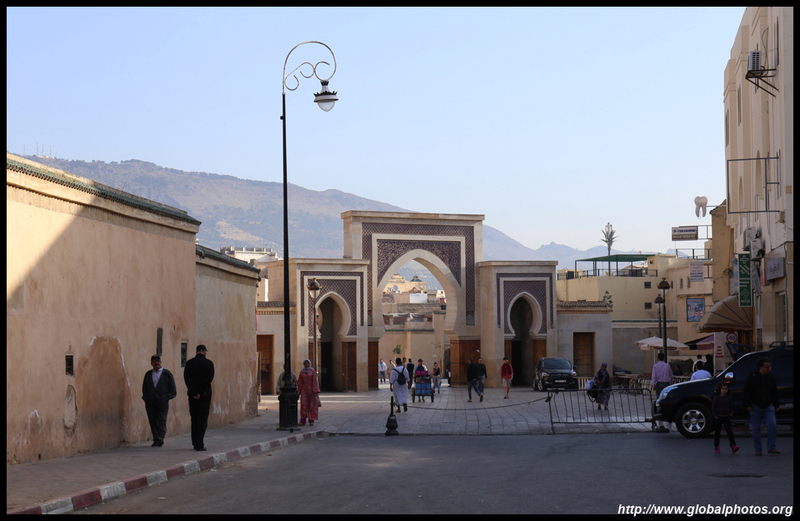 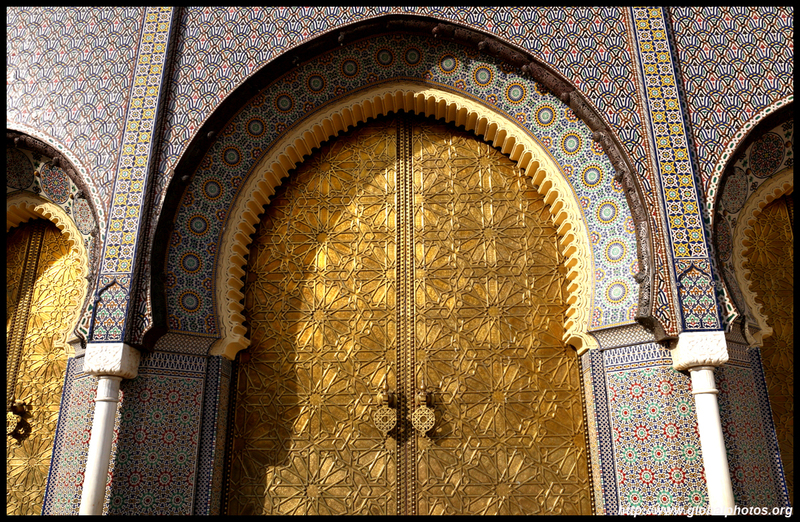 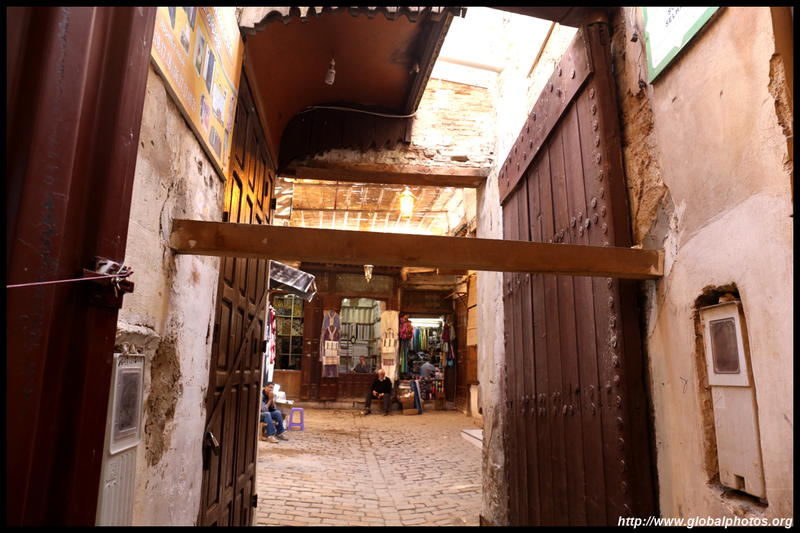 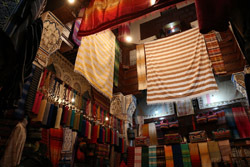 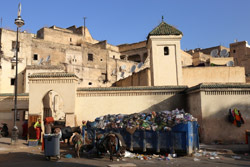 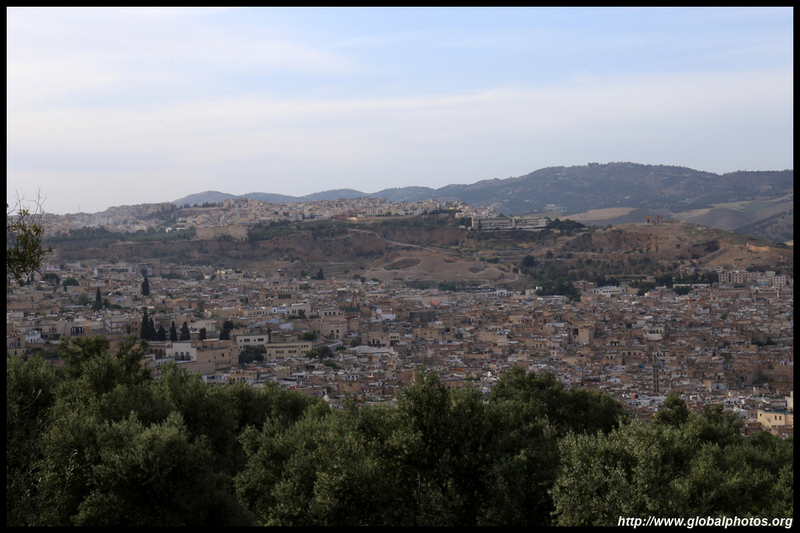 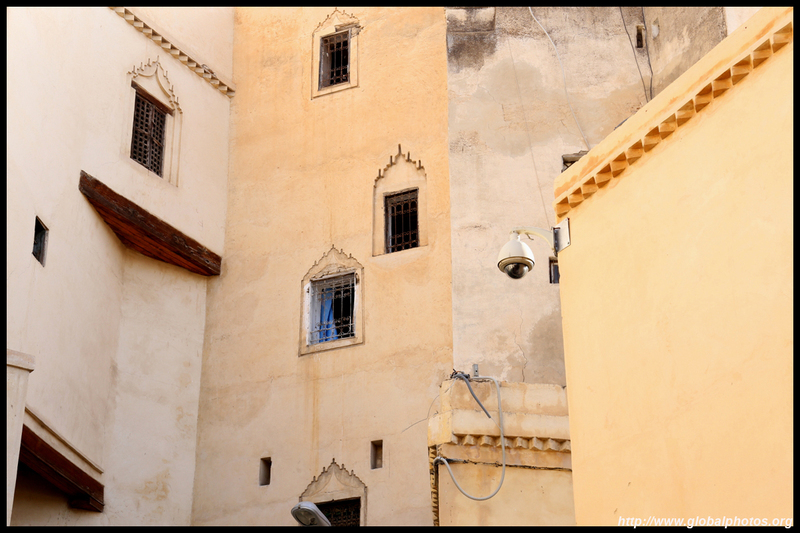 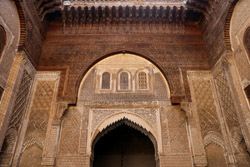 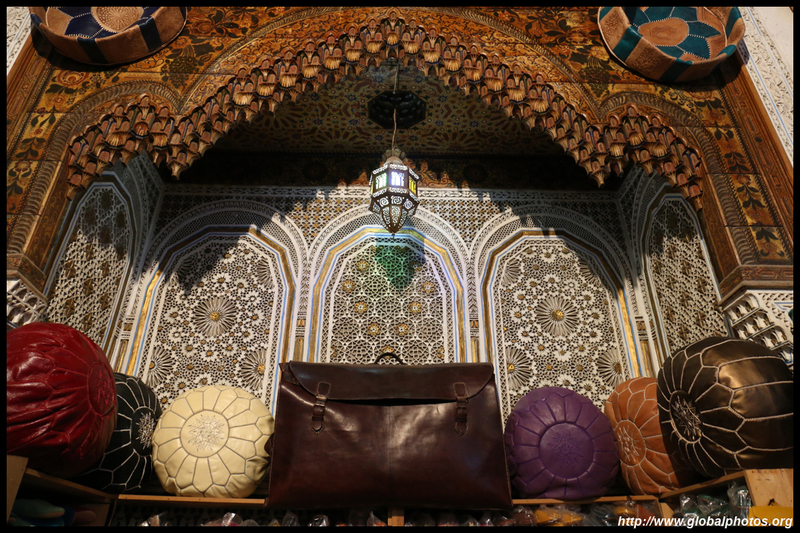 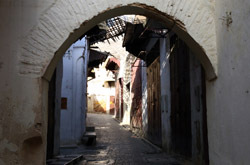 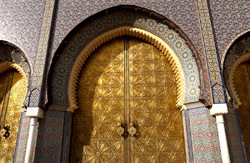 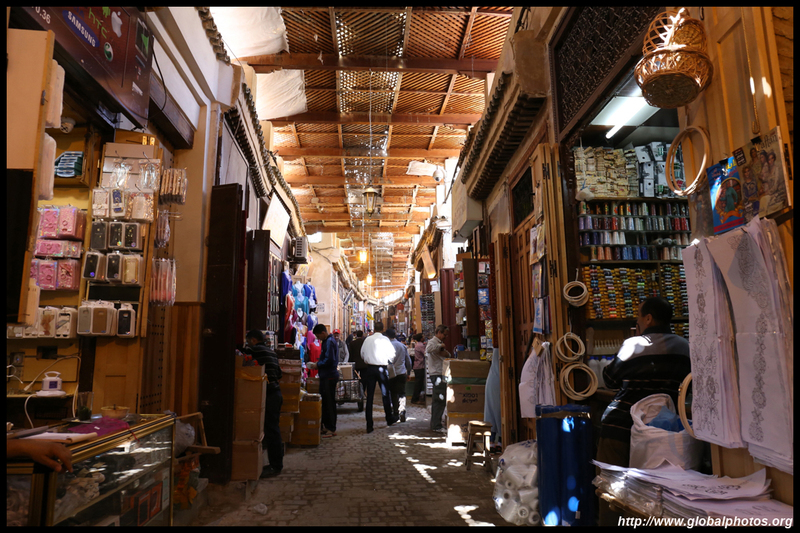 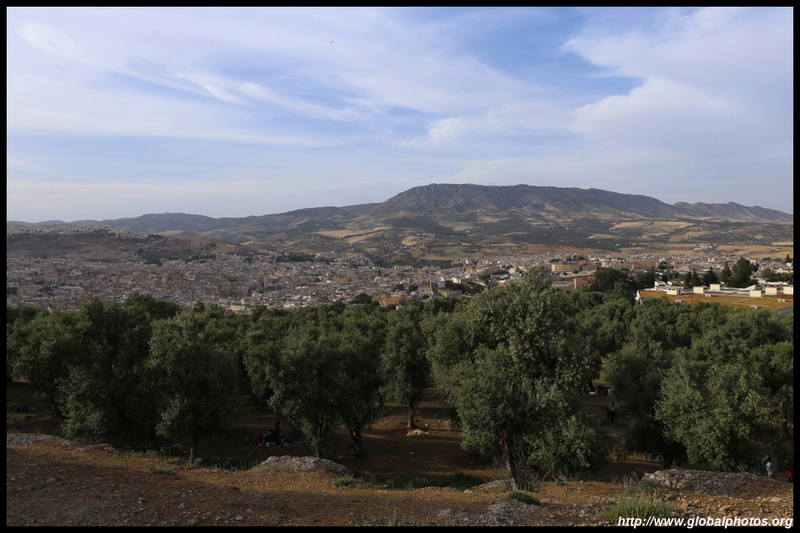 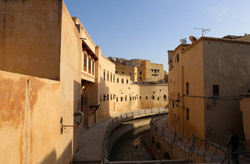 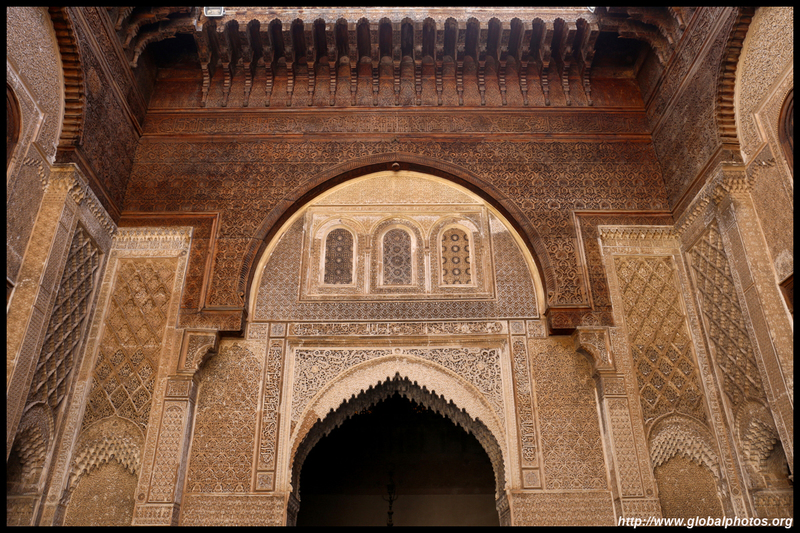 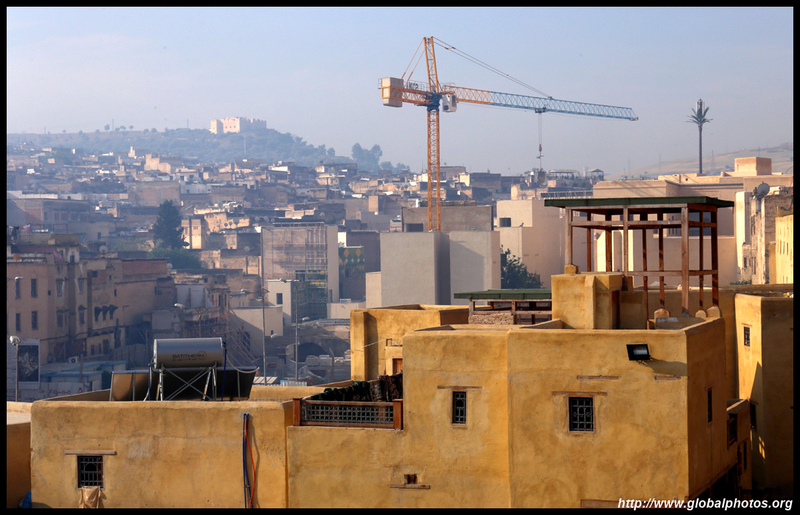 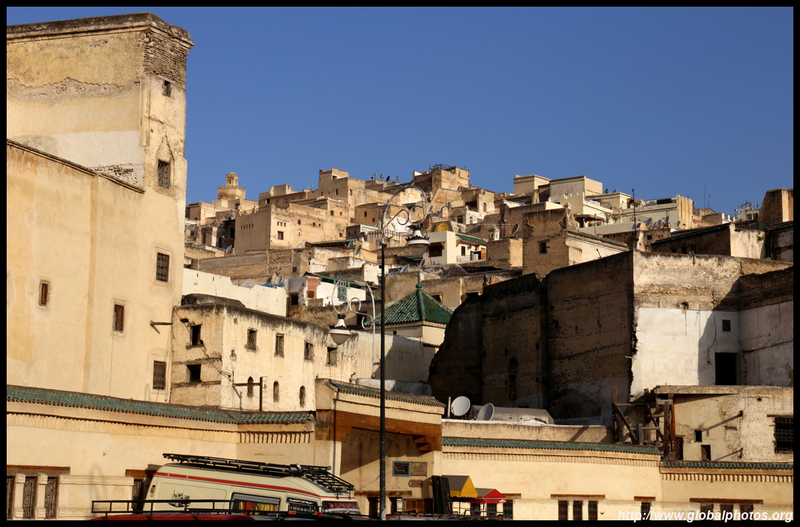 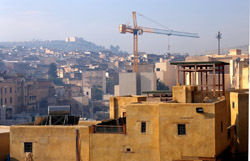 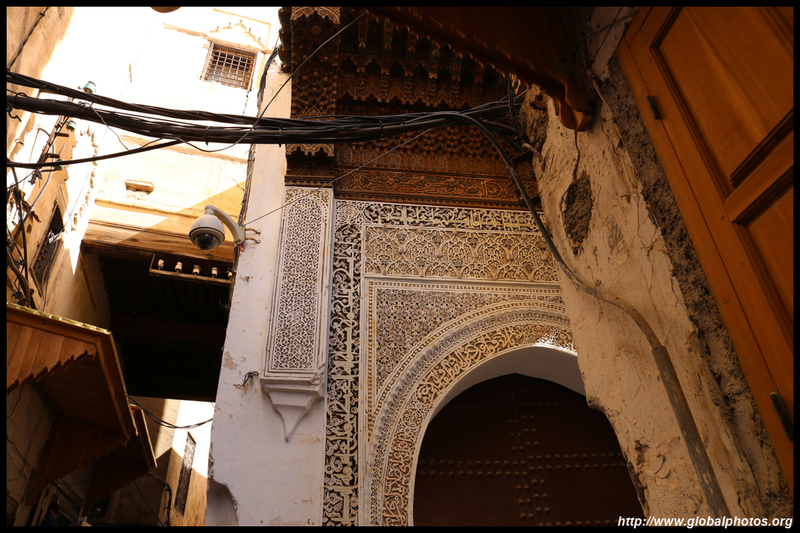 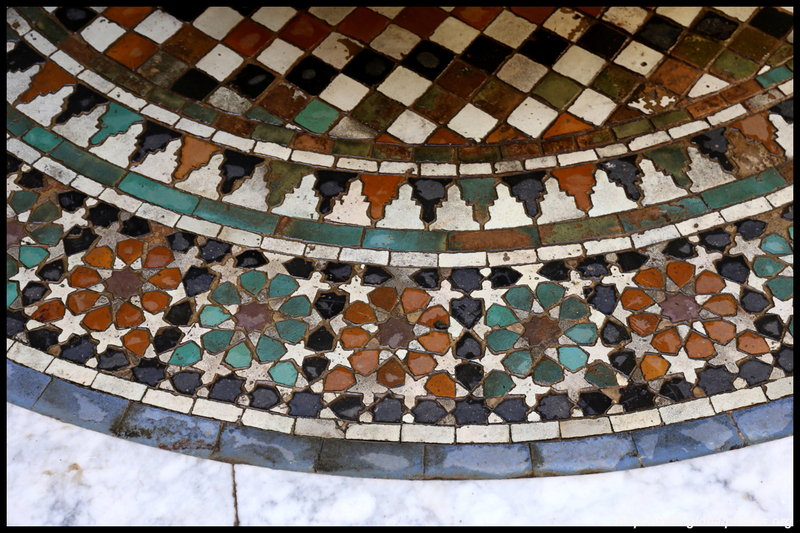 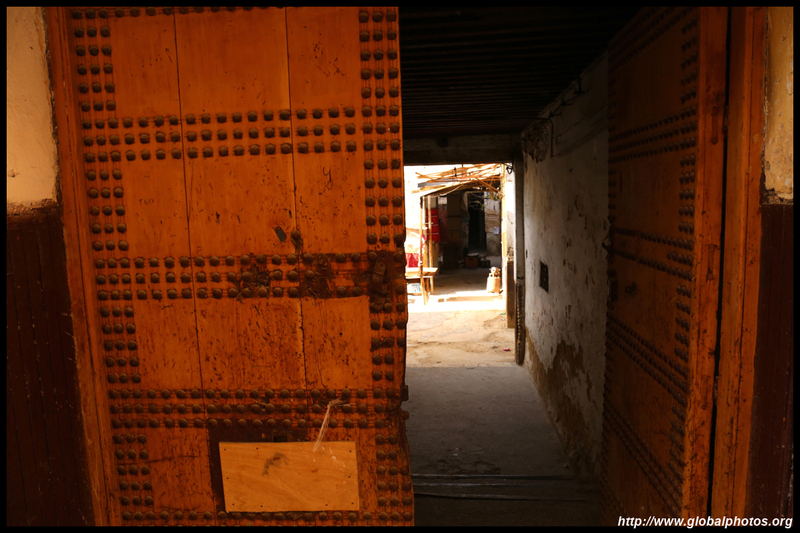 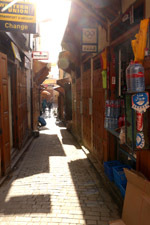 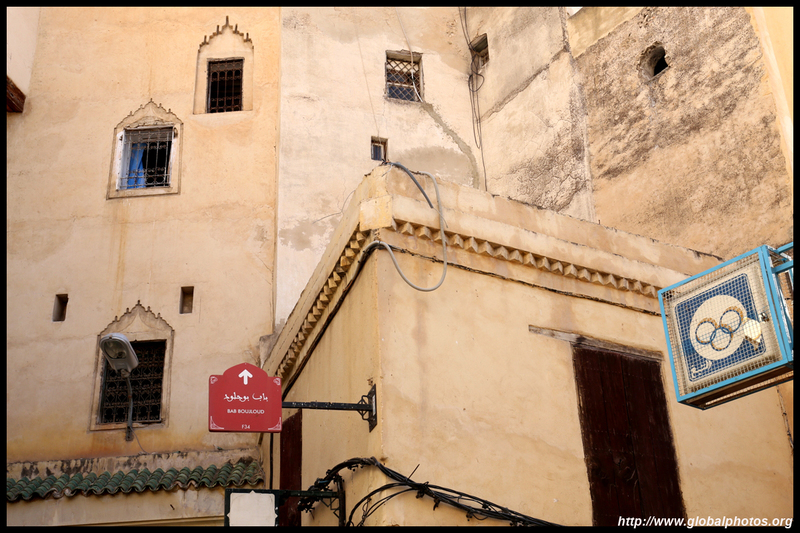 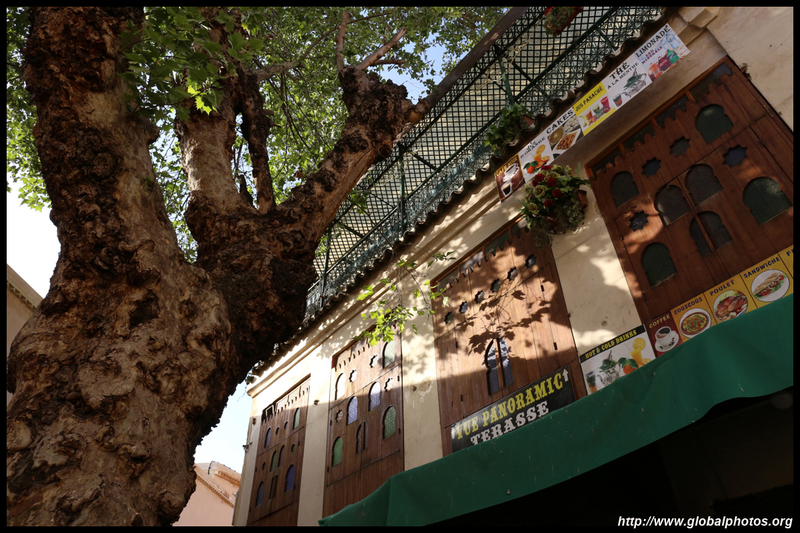 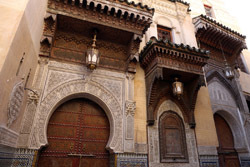 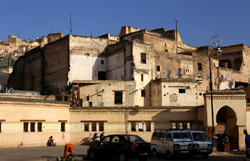 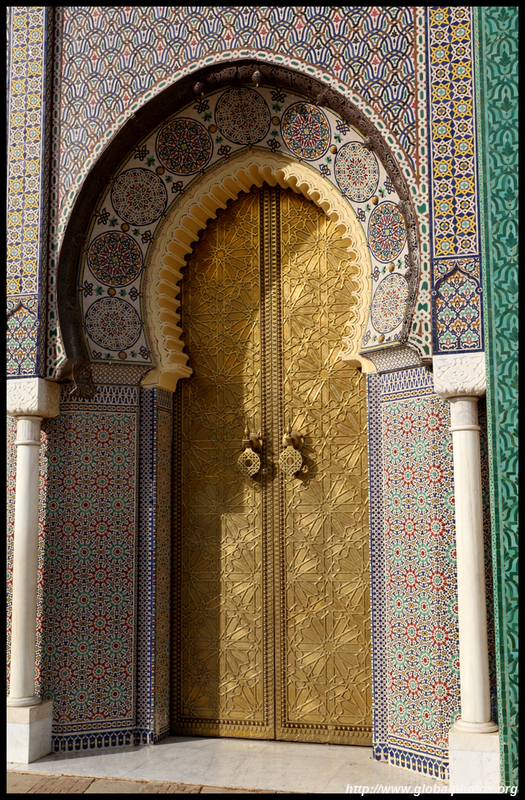 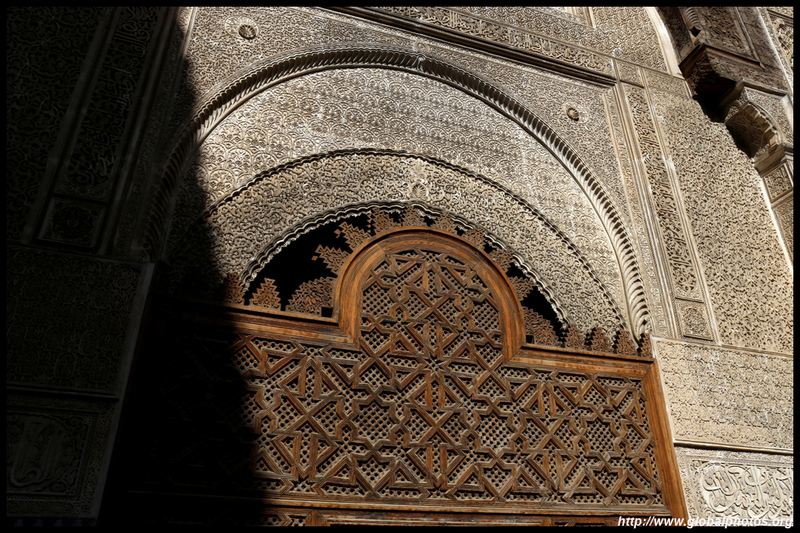 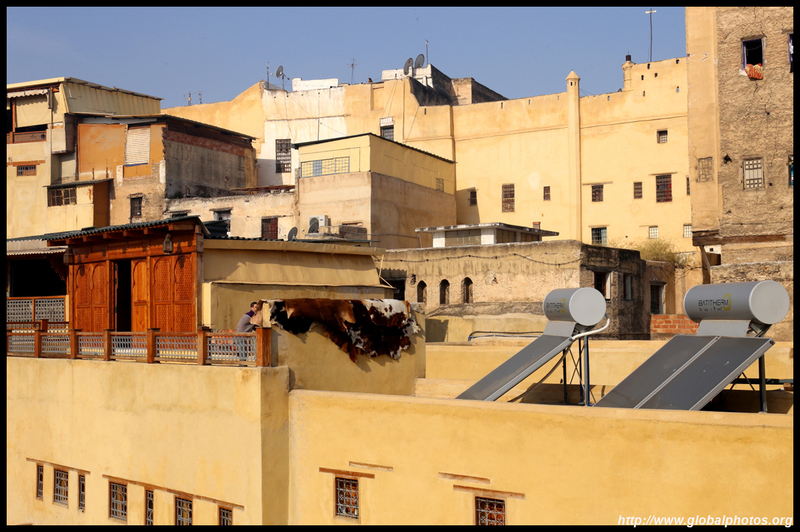 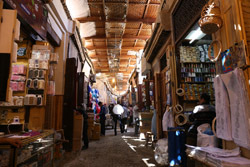 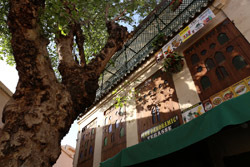 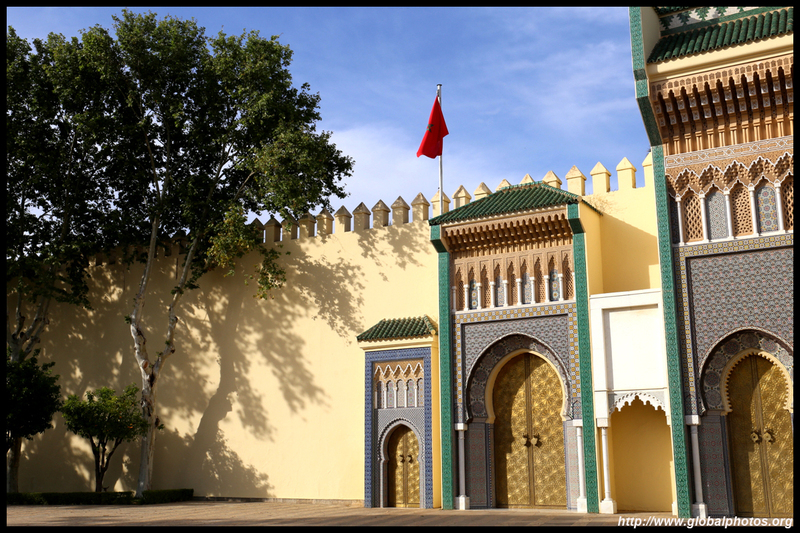 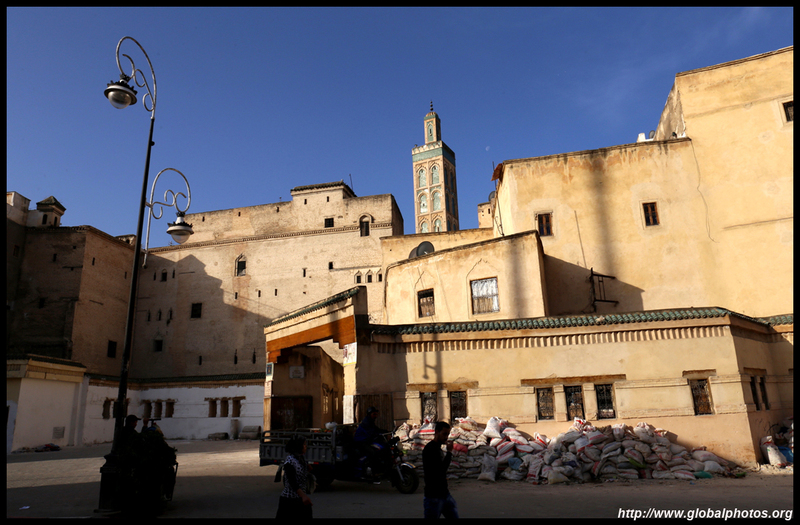 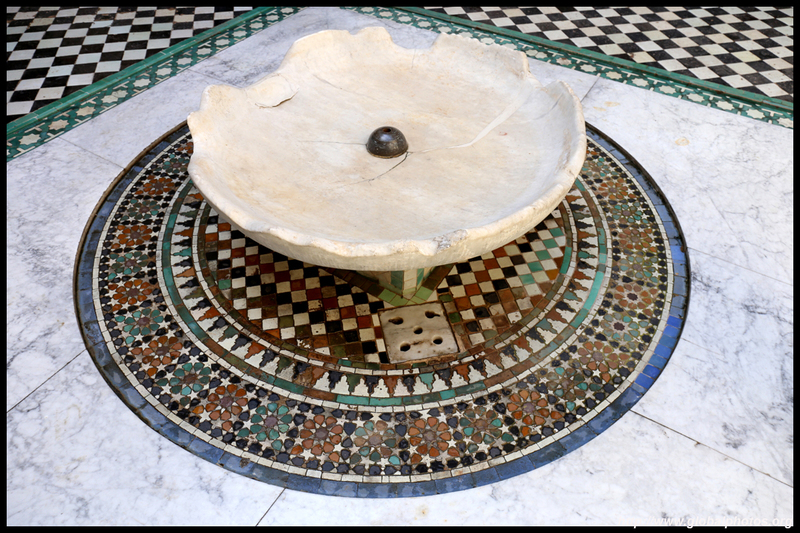 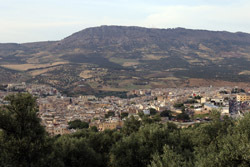 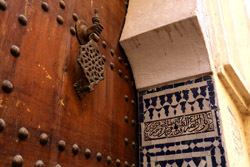 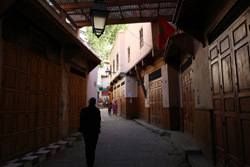 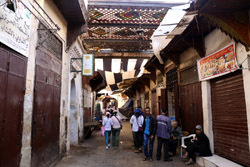 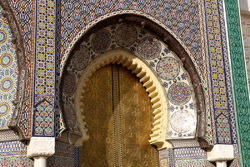 Fes el-Jedid was built in the 13th century as a kasbah to watch over the old town. 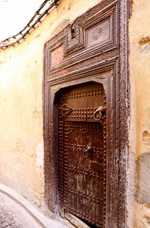 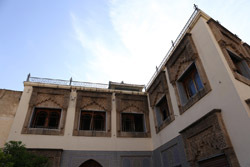 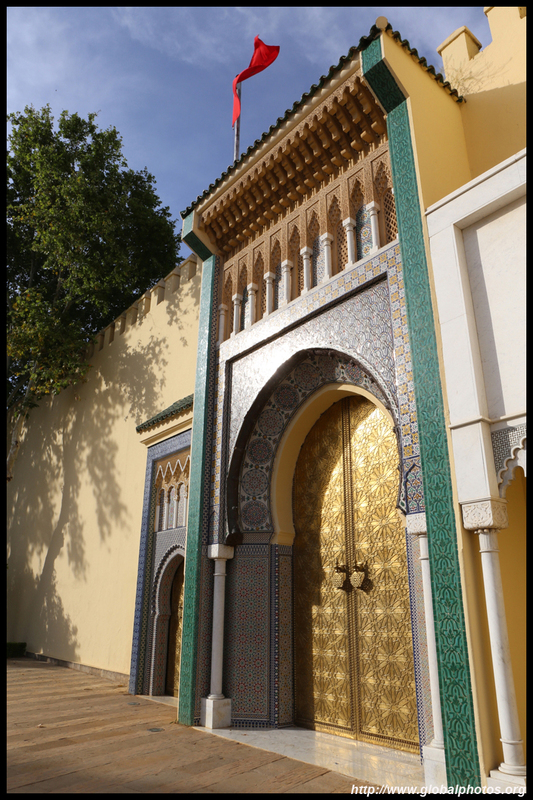 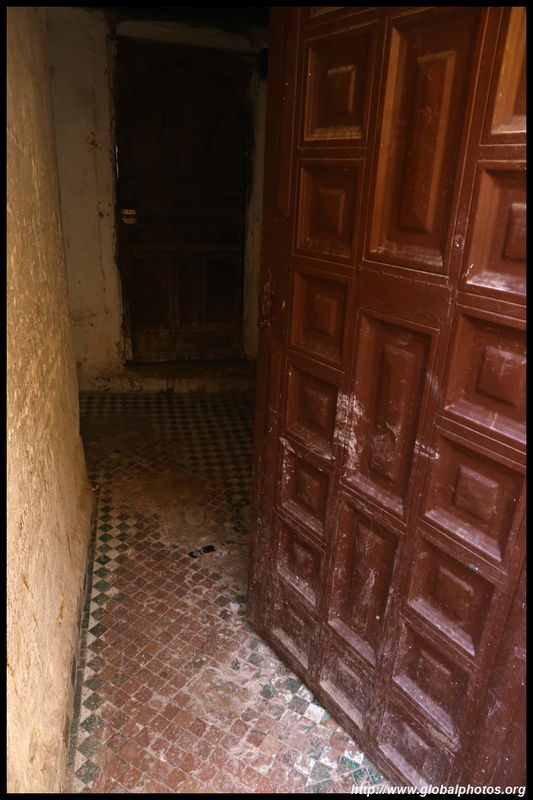 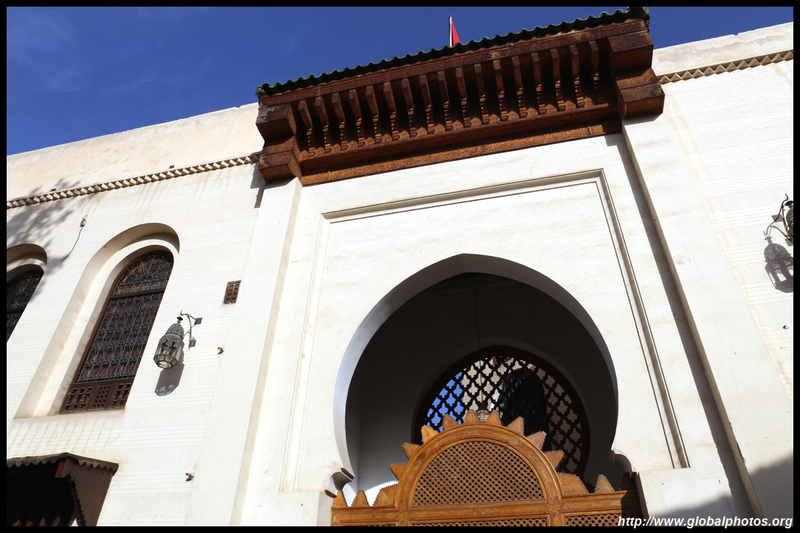 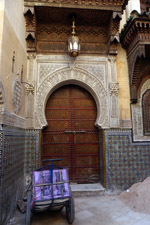 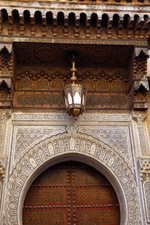 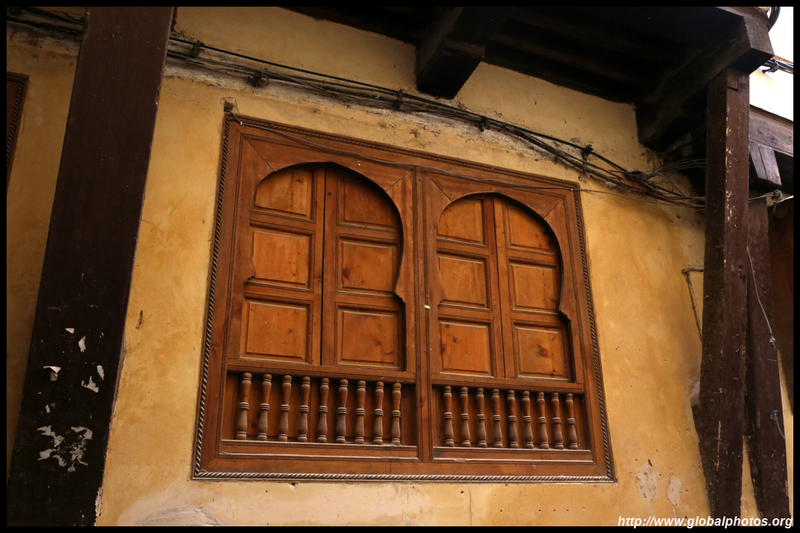 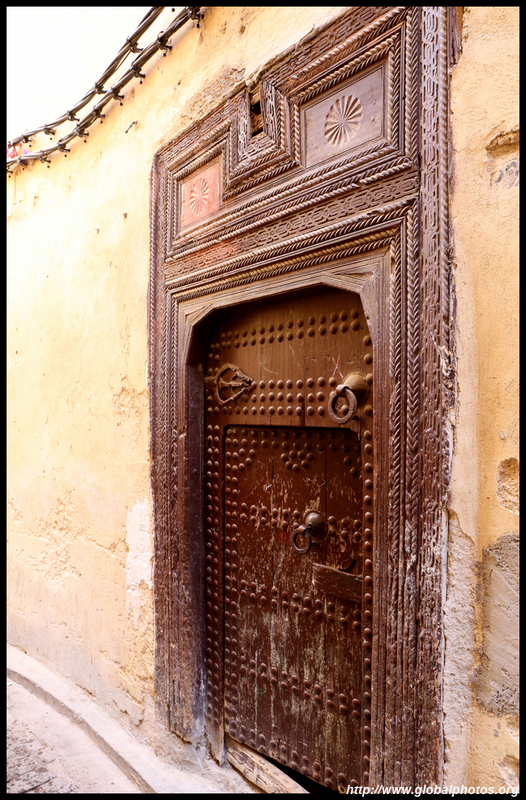 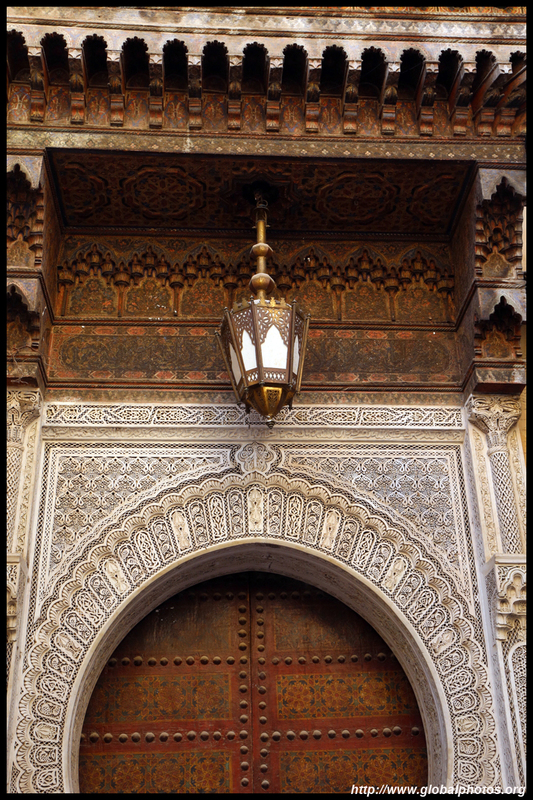 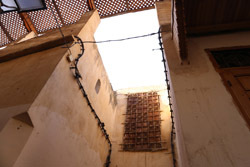 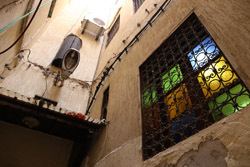 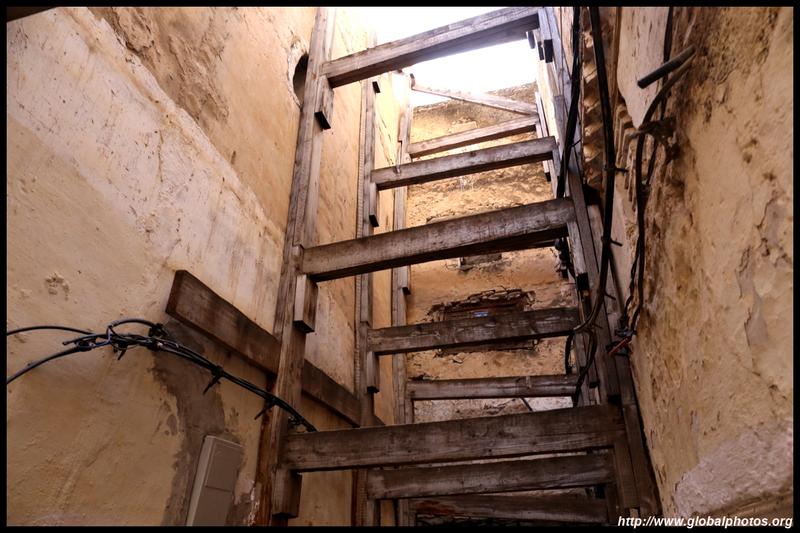 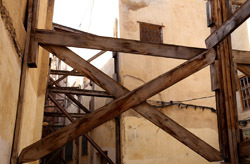 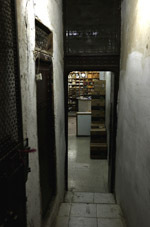 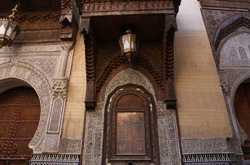 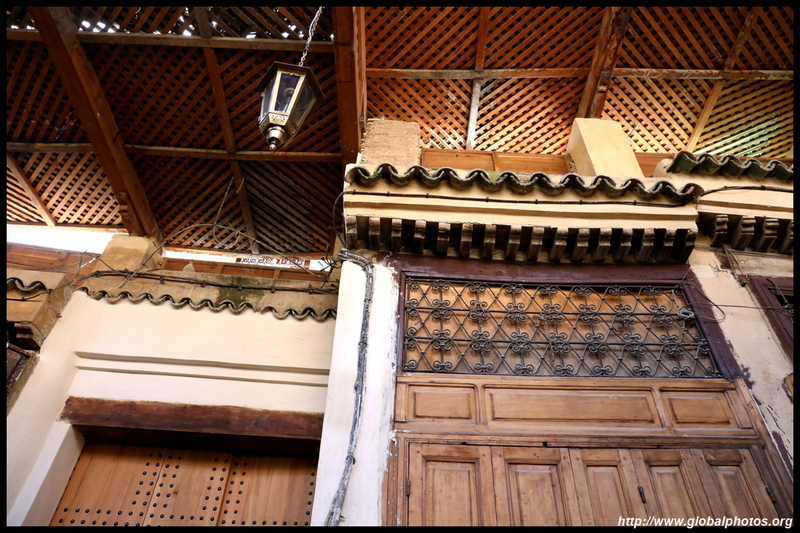 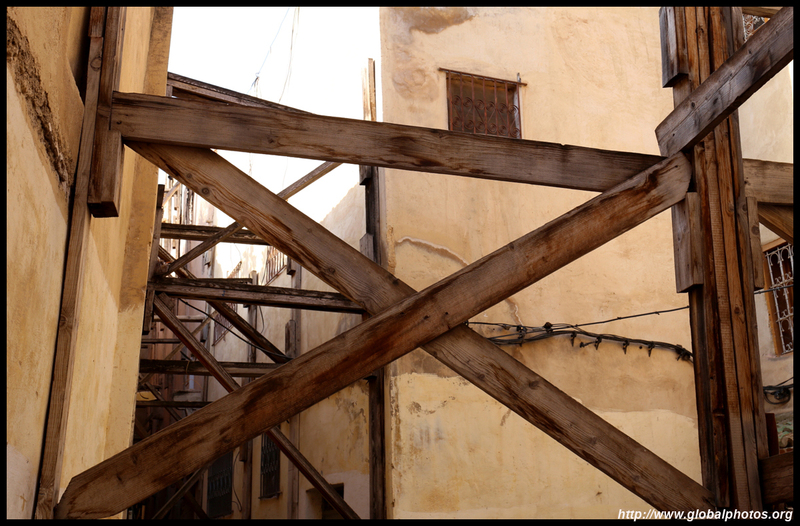 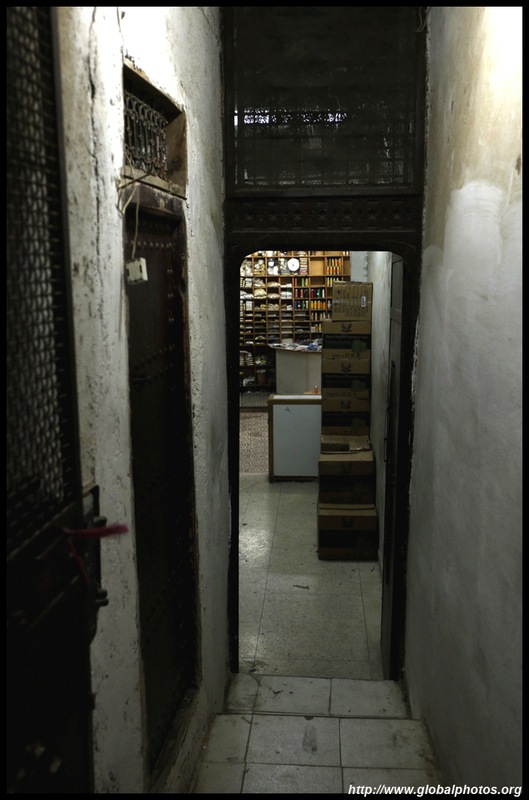 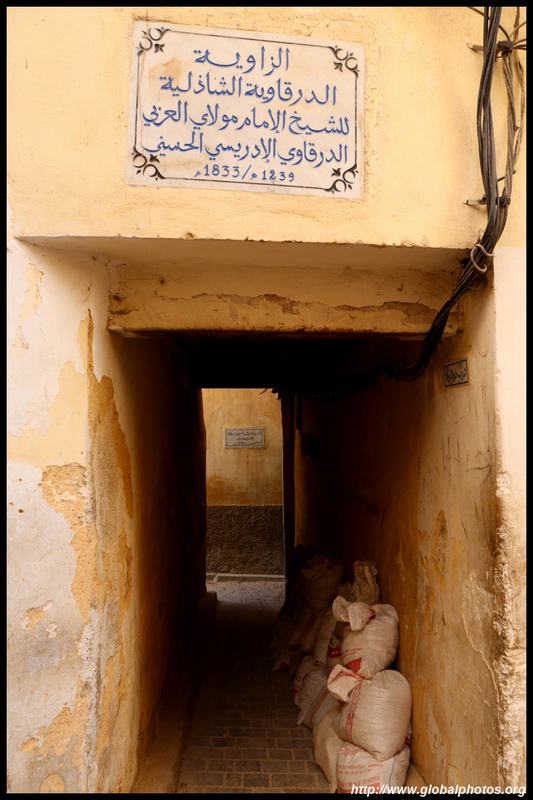 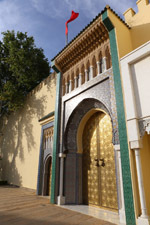 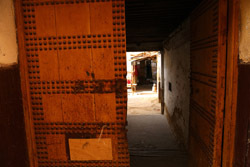 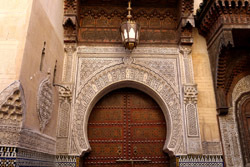 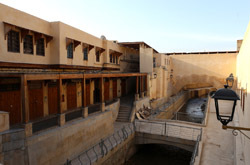 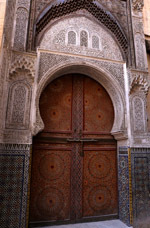 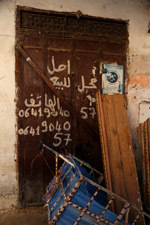 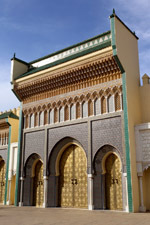 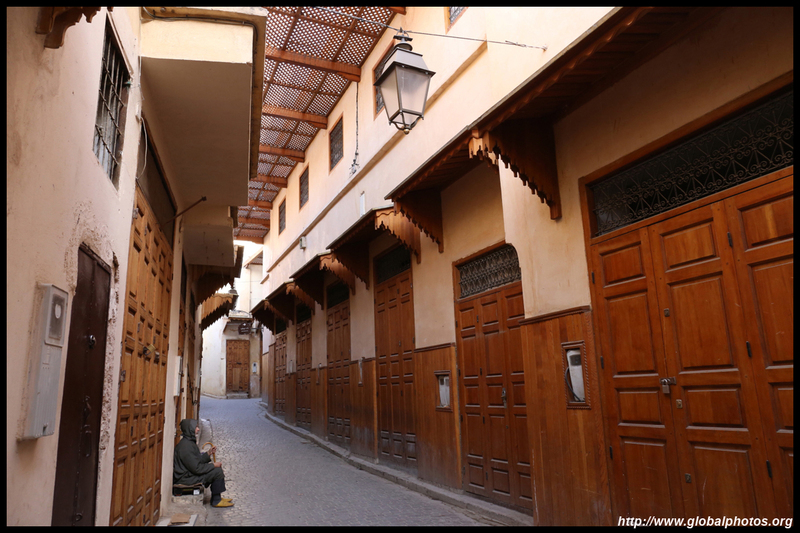 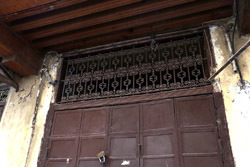 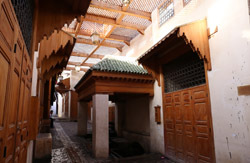 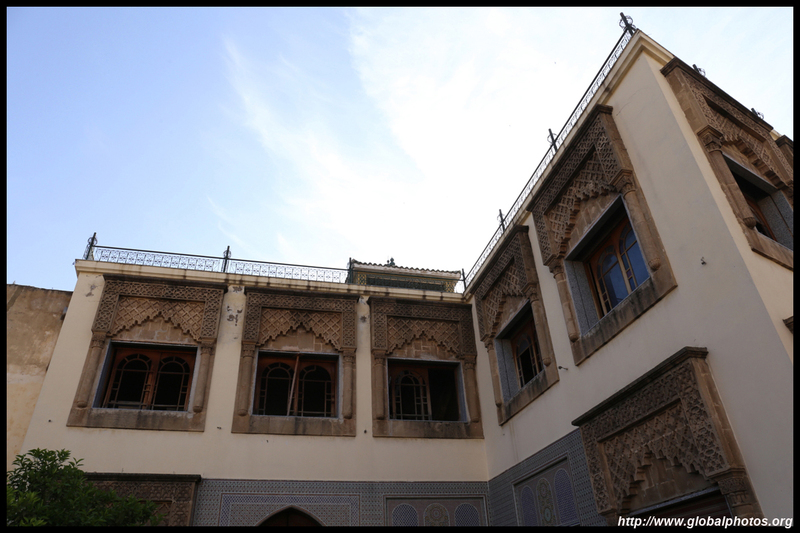 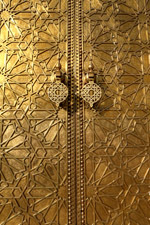 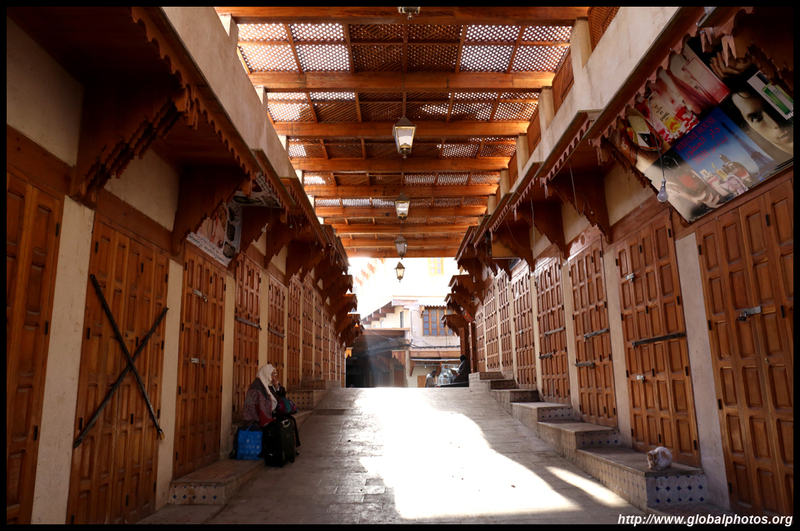 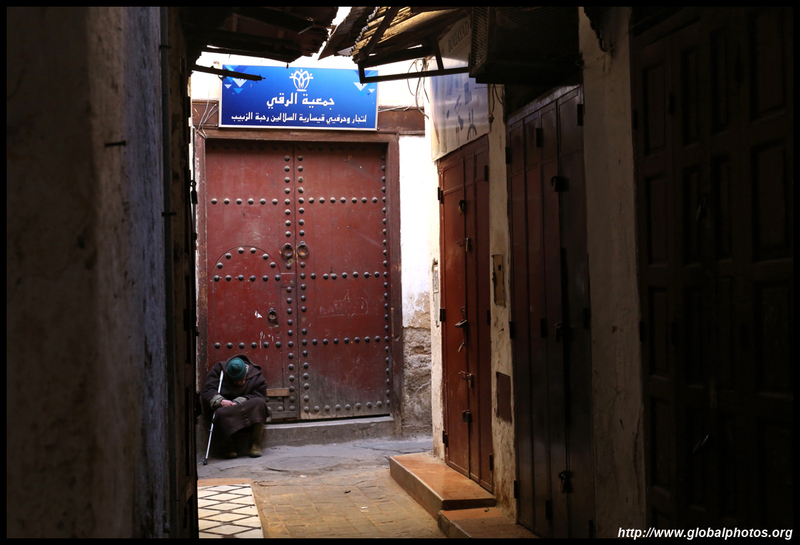 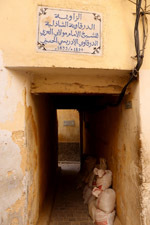 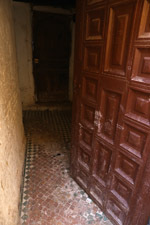 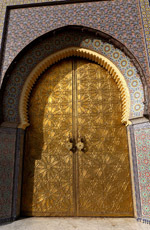 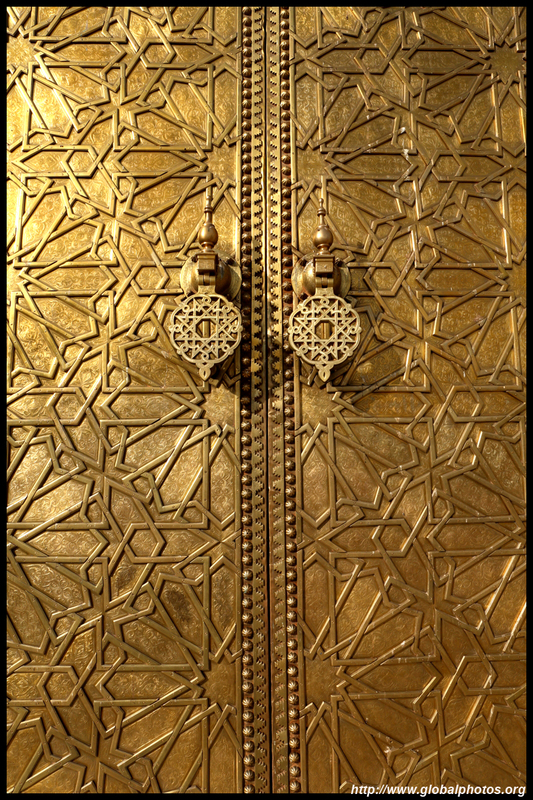 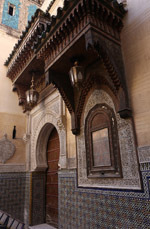 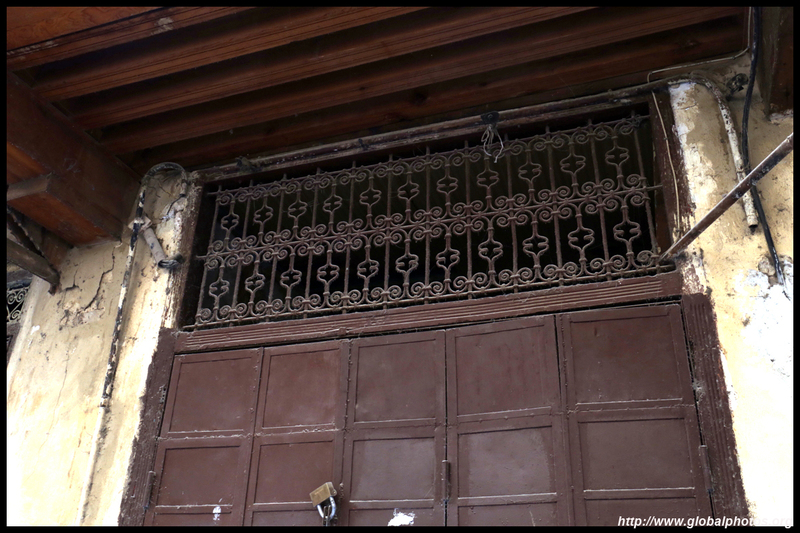 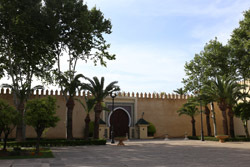 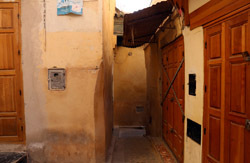 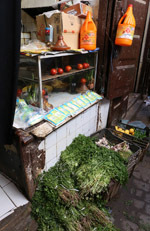 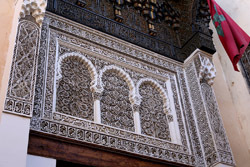 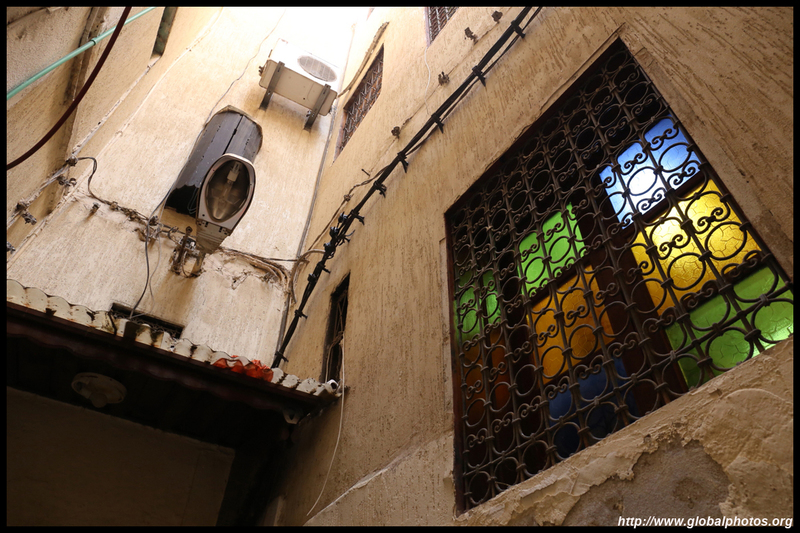 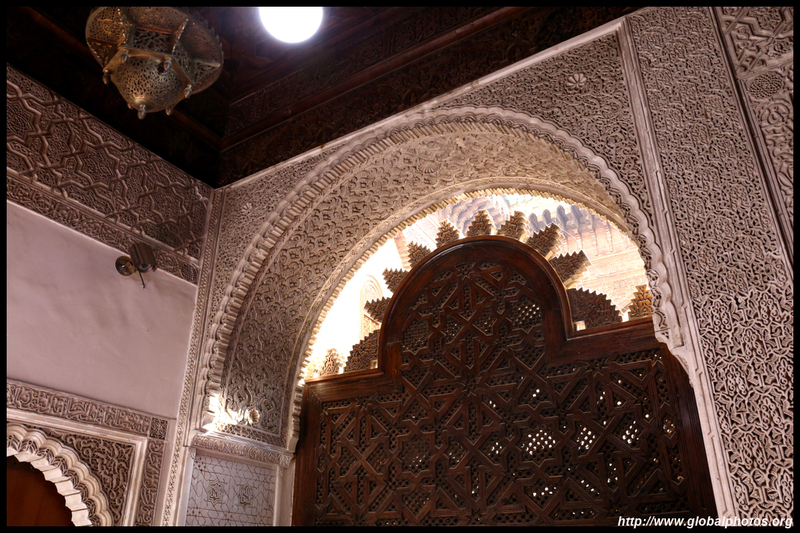 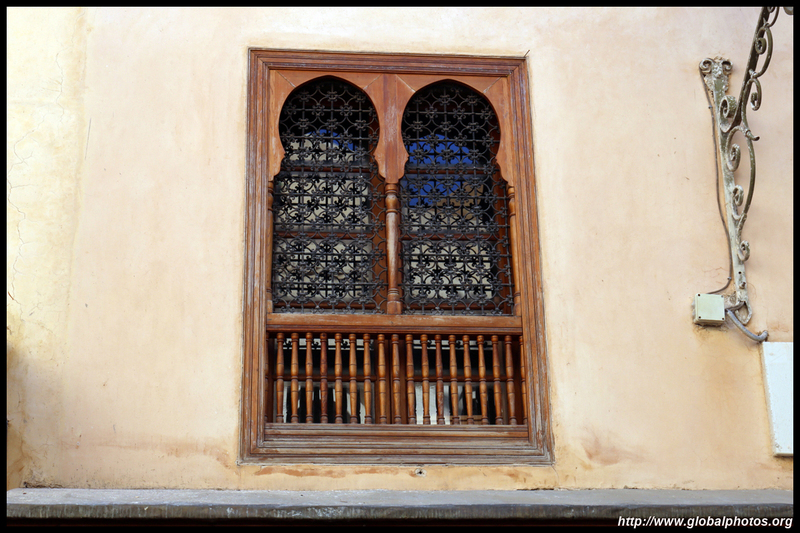 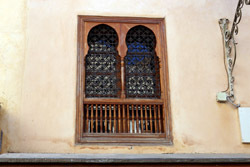 The royal palace (Dar el-Makhzen), which was home to the sultan and his servants, lies behind these doors and is still being used by the king today. 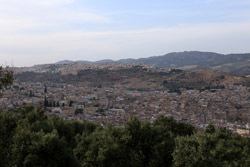 For a nice view of the city, head uphill to Borj Sud (pictured here) or Borj North.